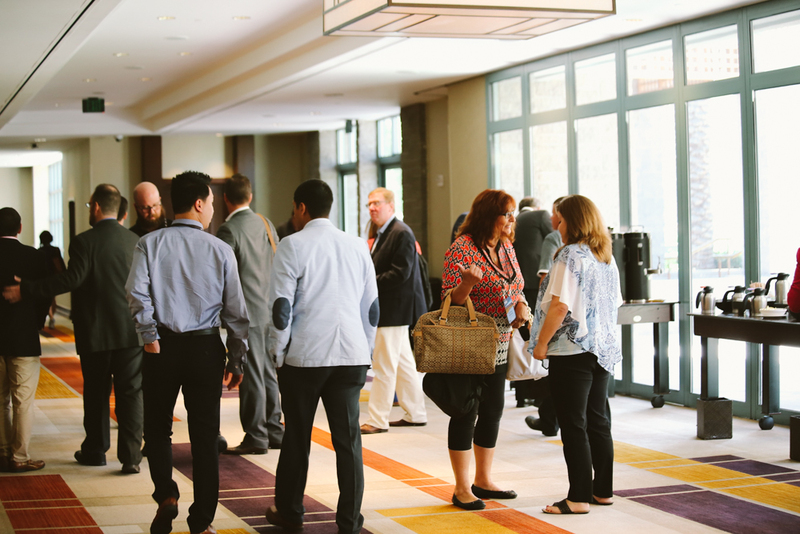 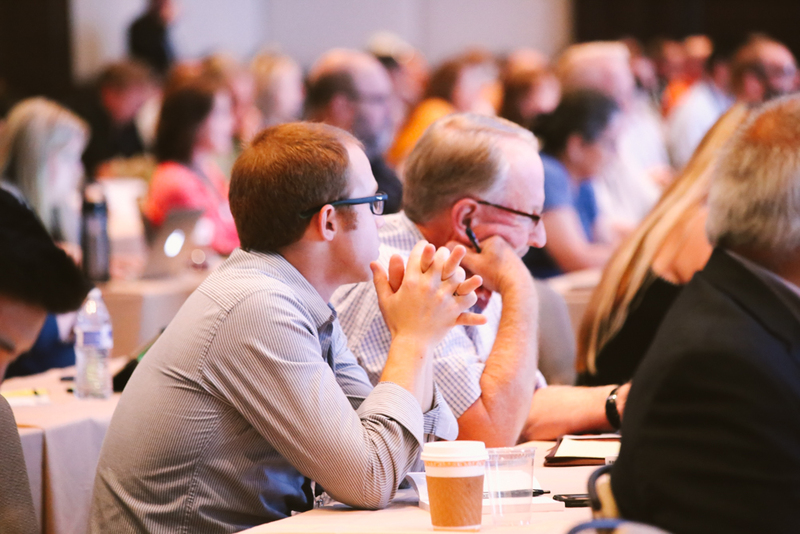 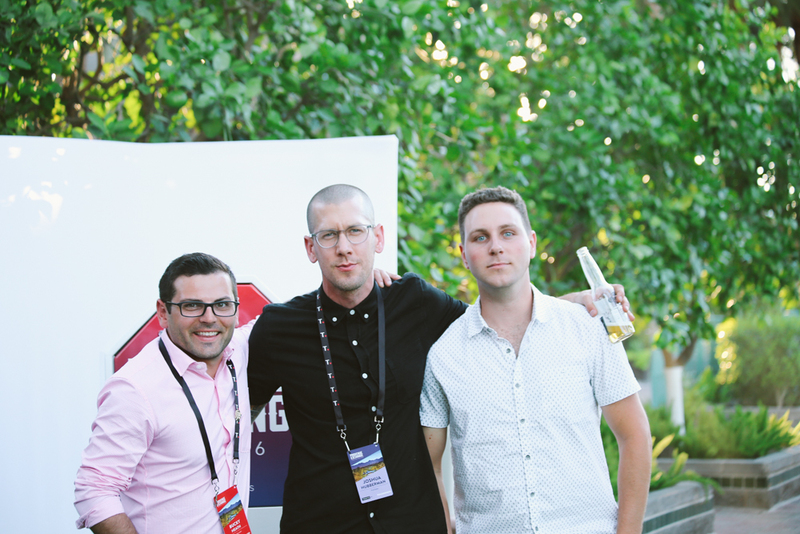 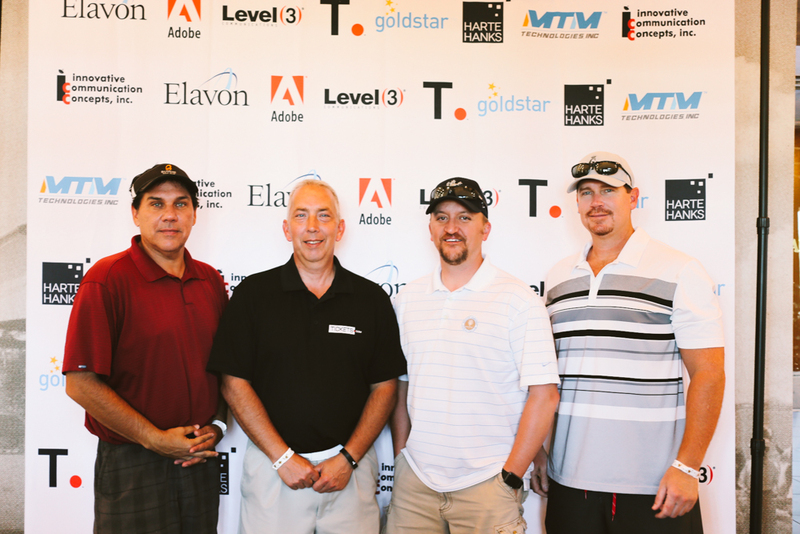 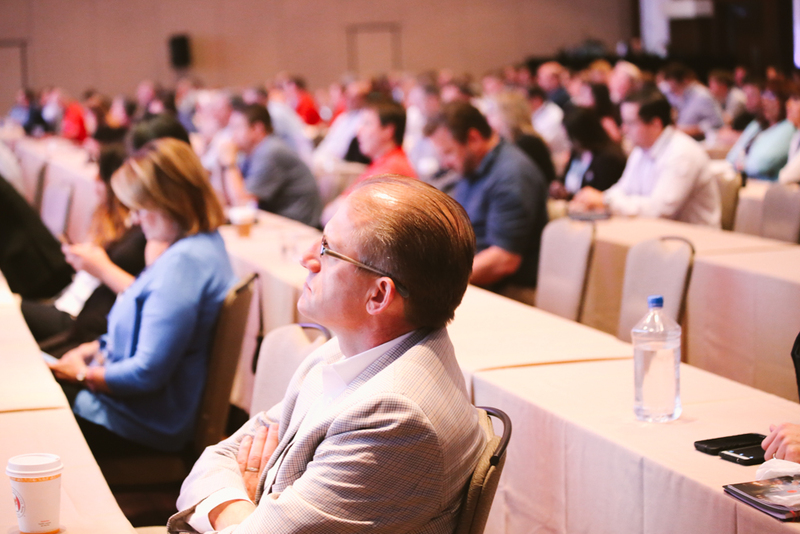 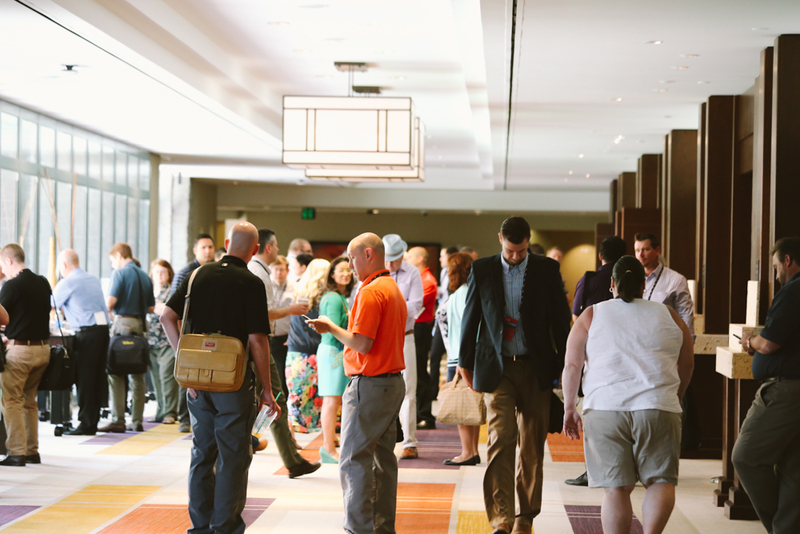 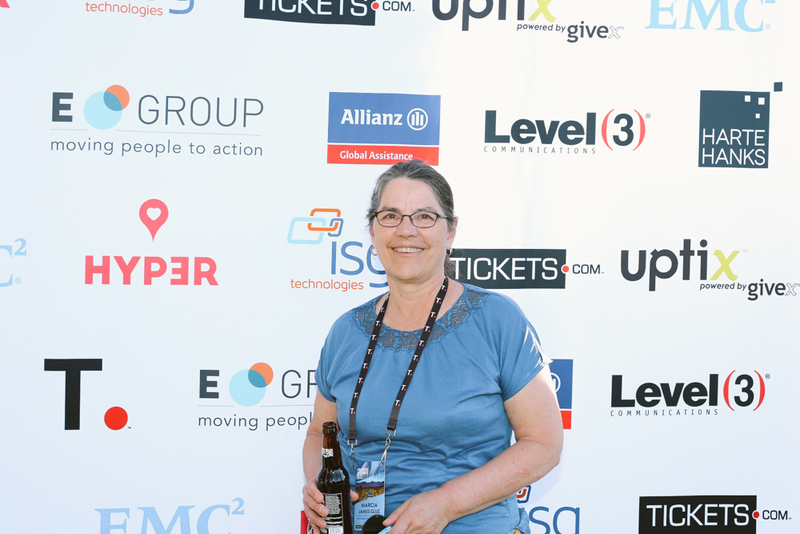 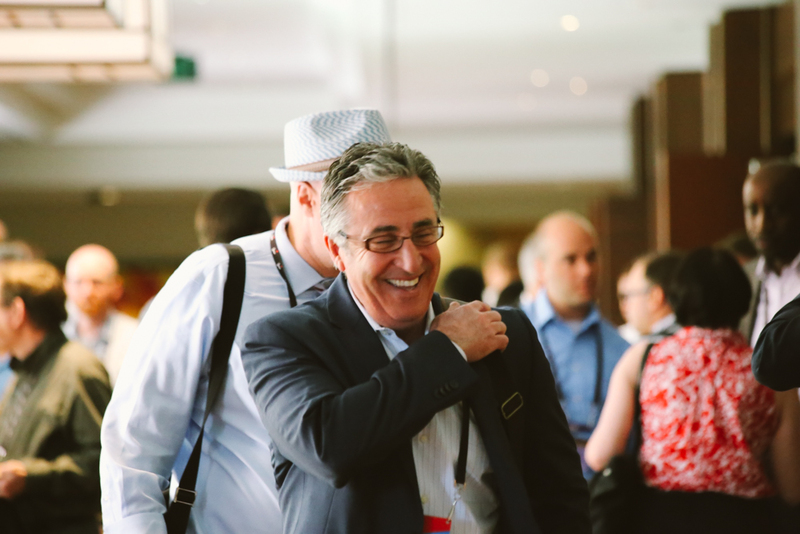 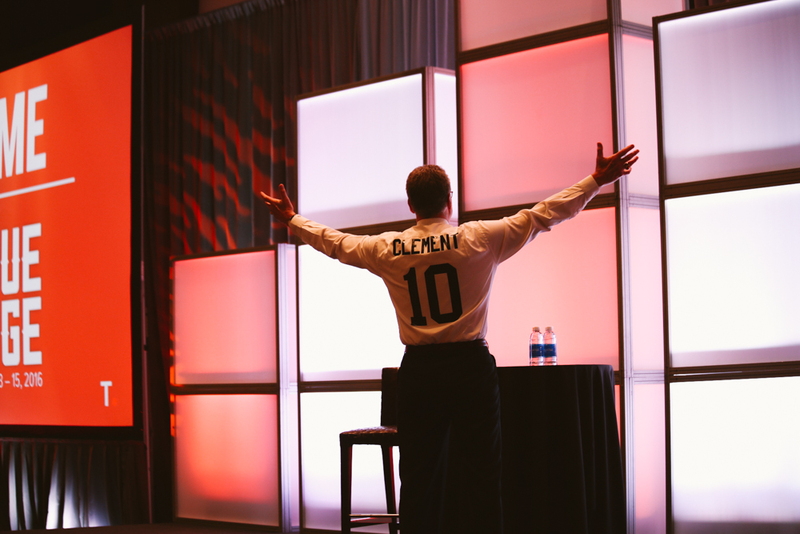 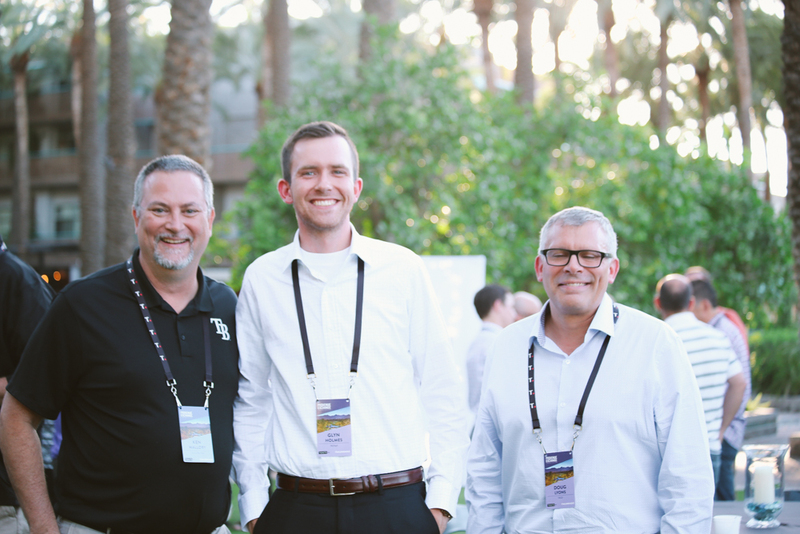 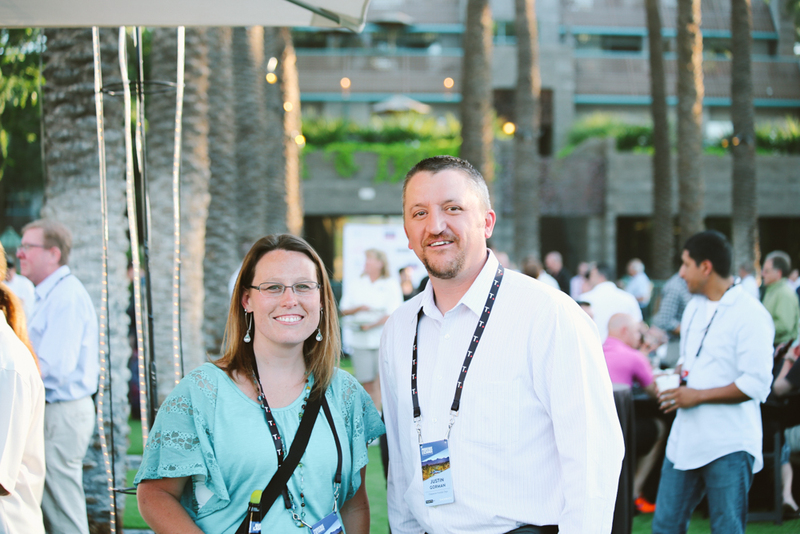 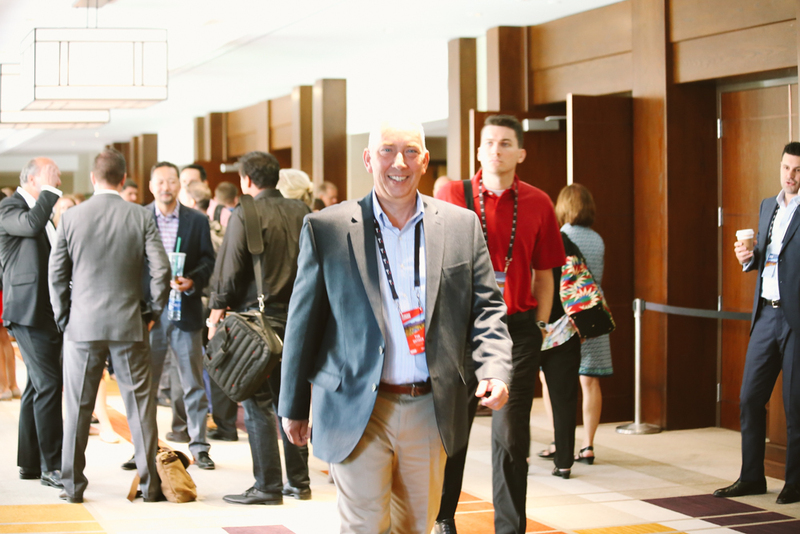 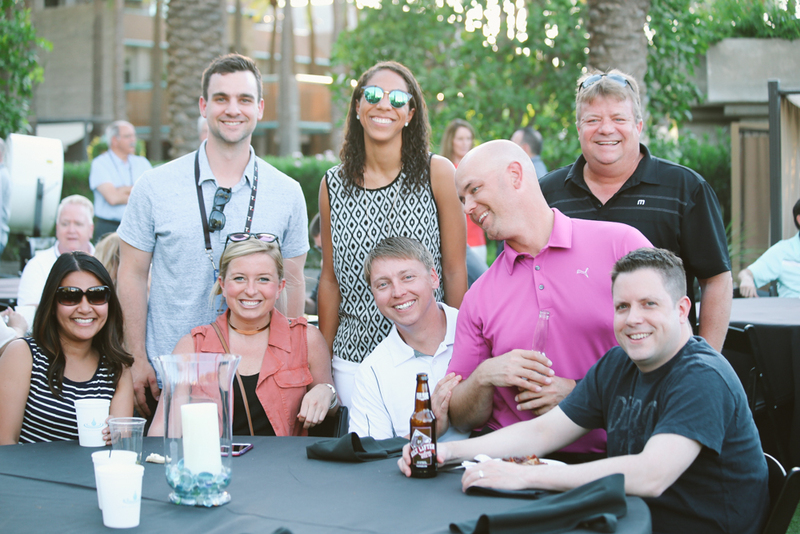 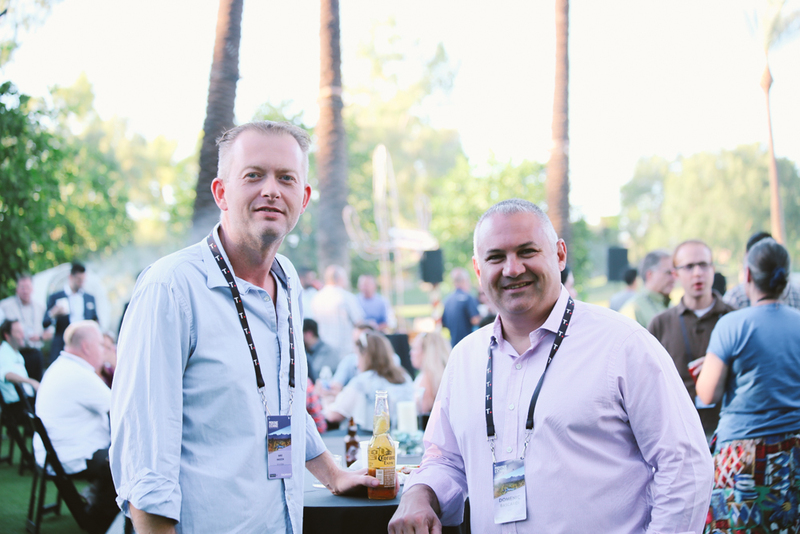 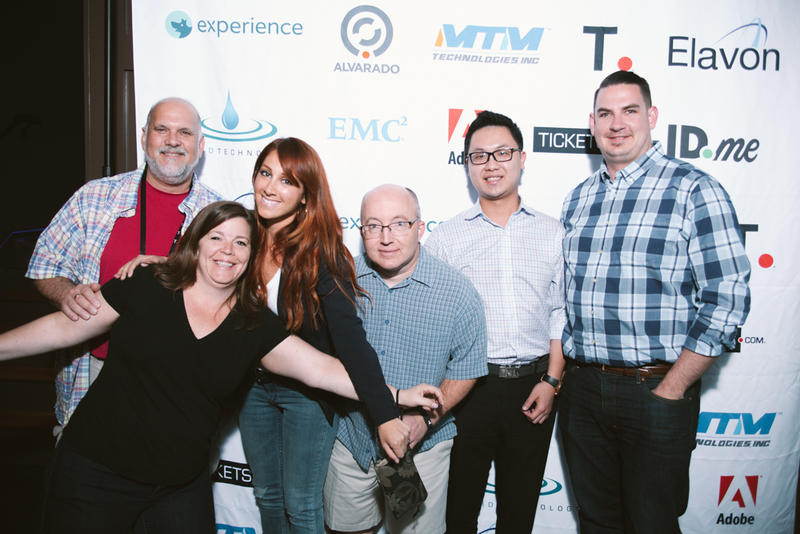 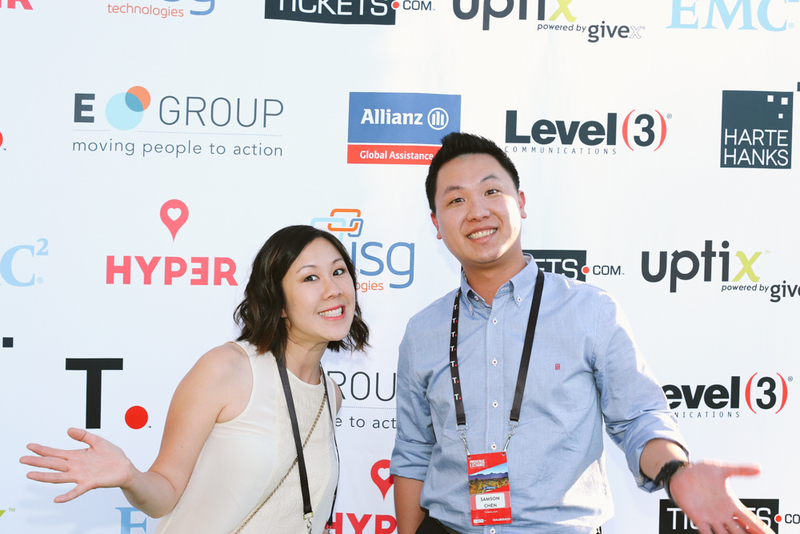 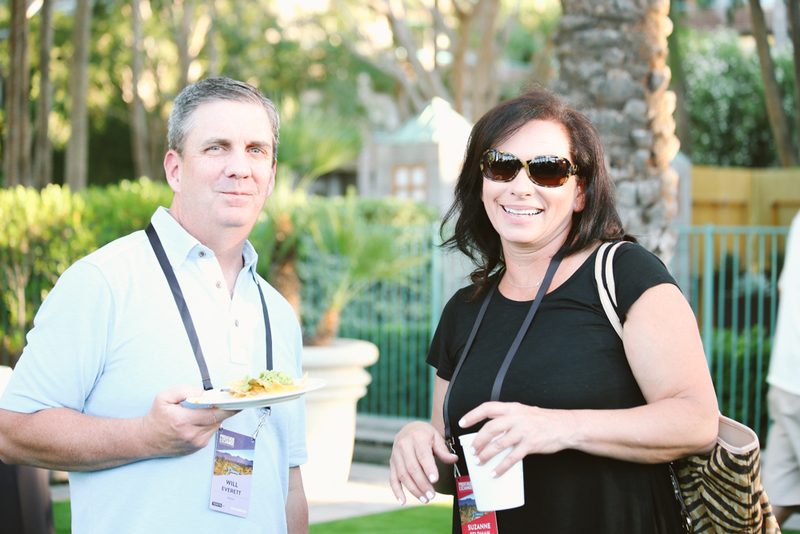 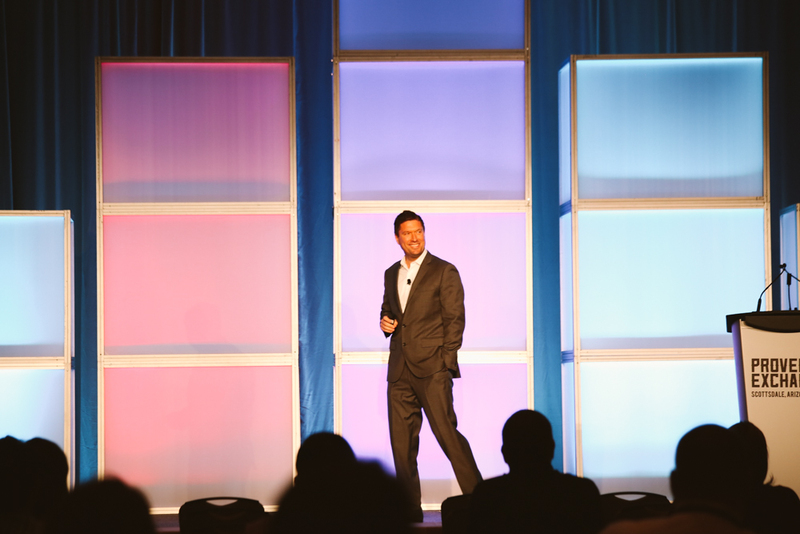 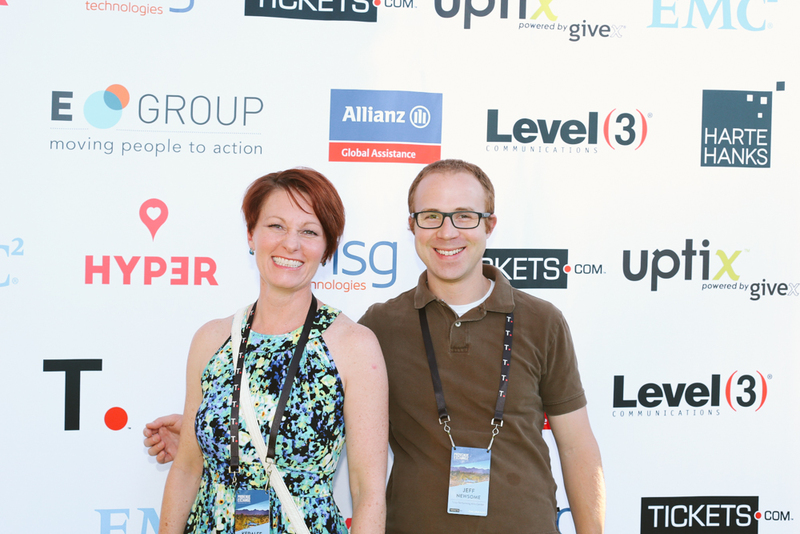 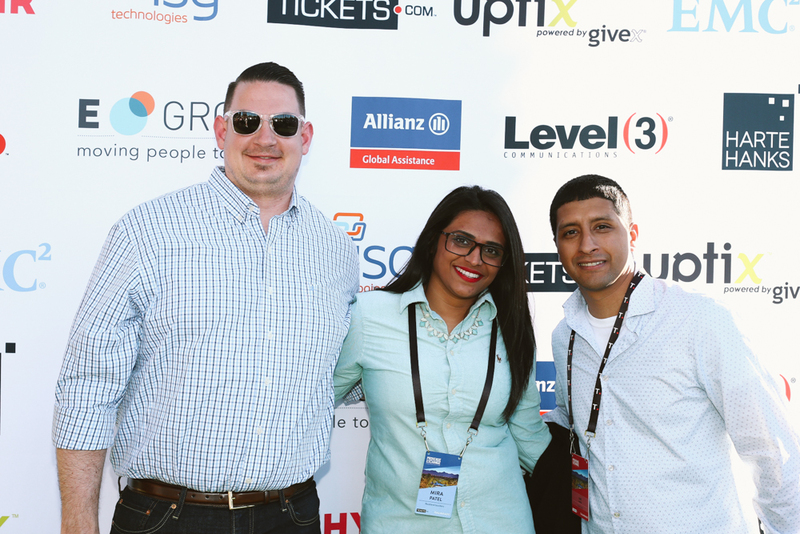 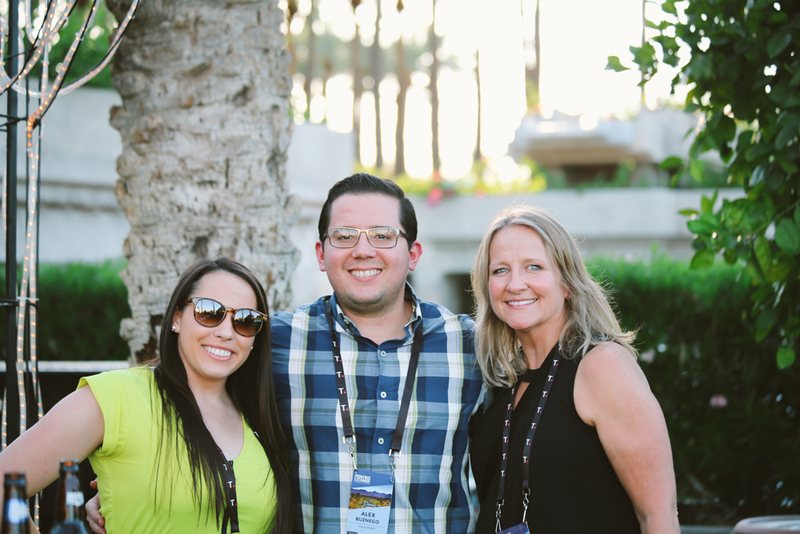 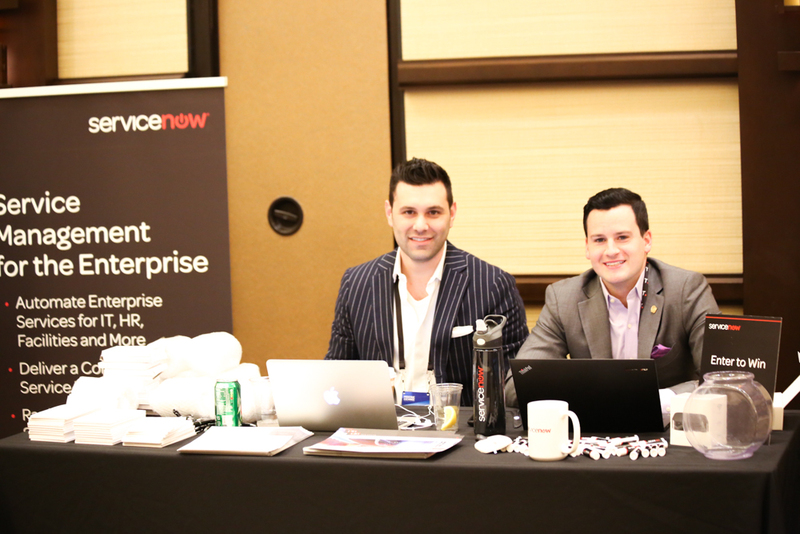 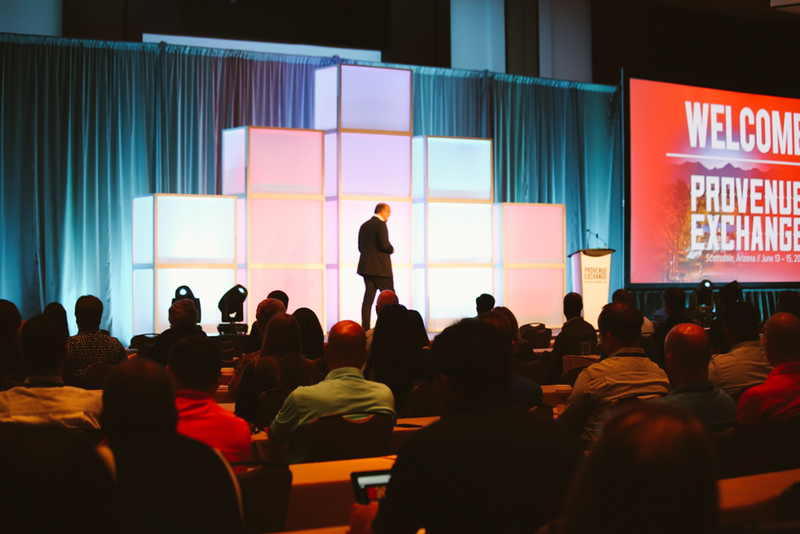 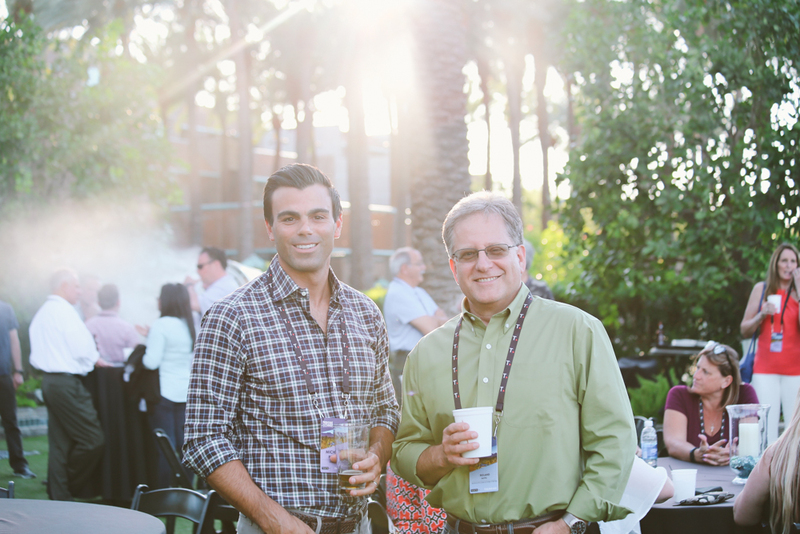 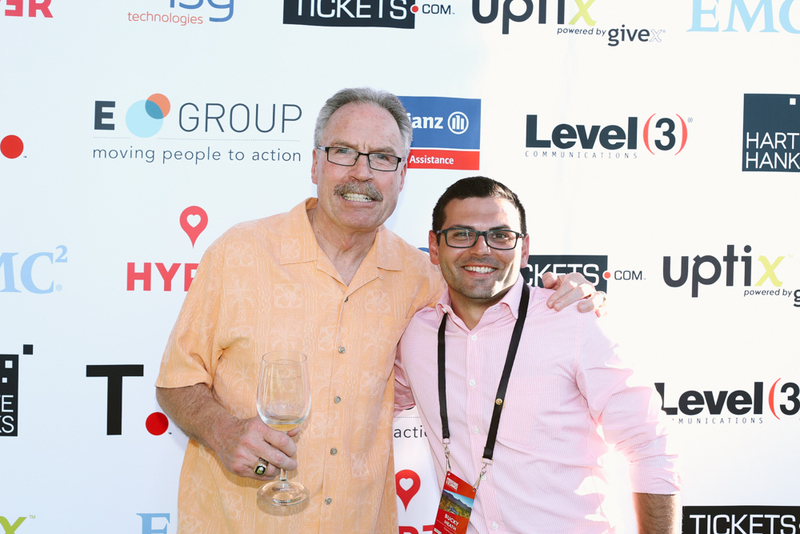 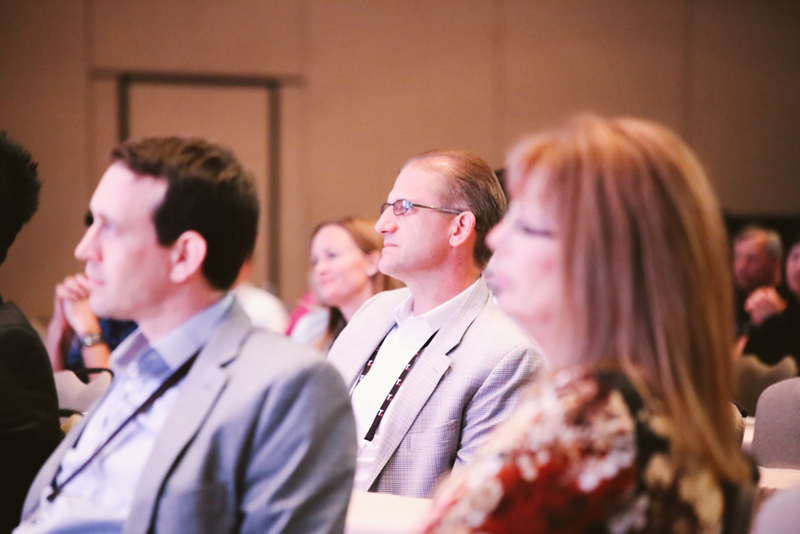 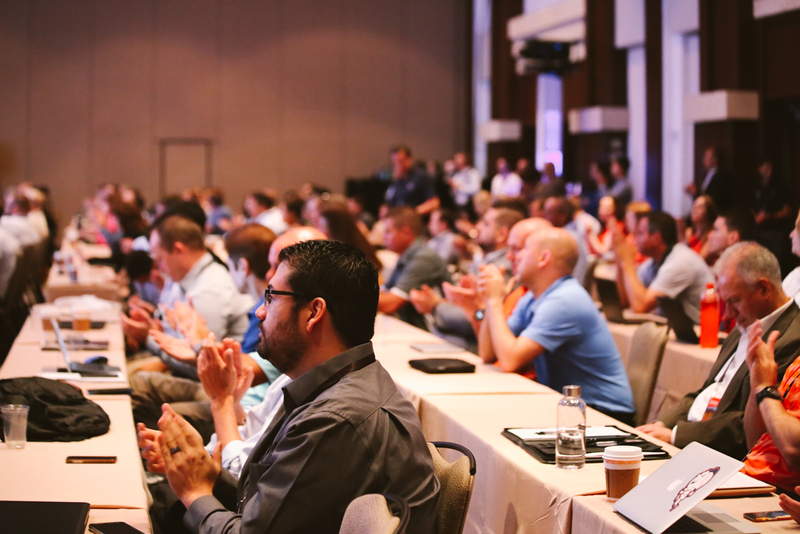 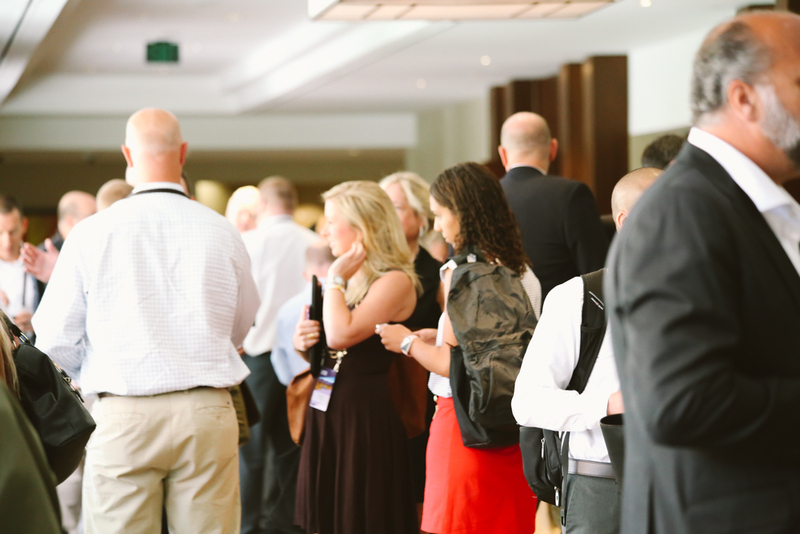 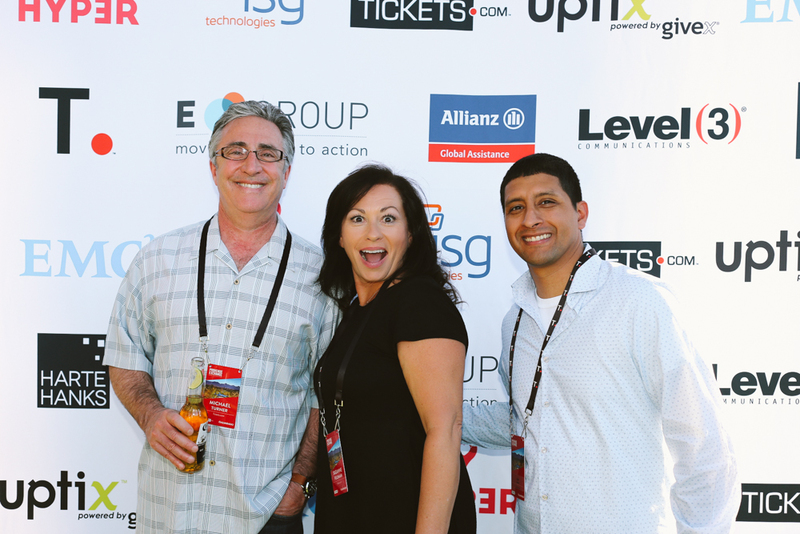 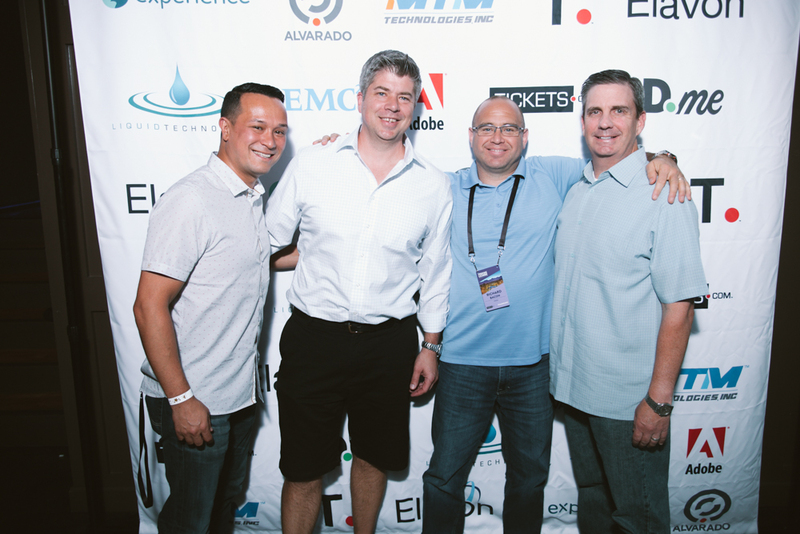 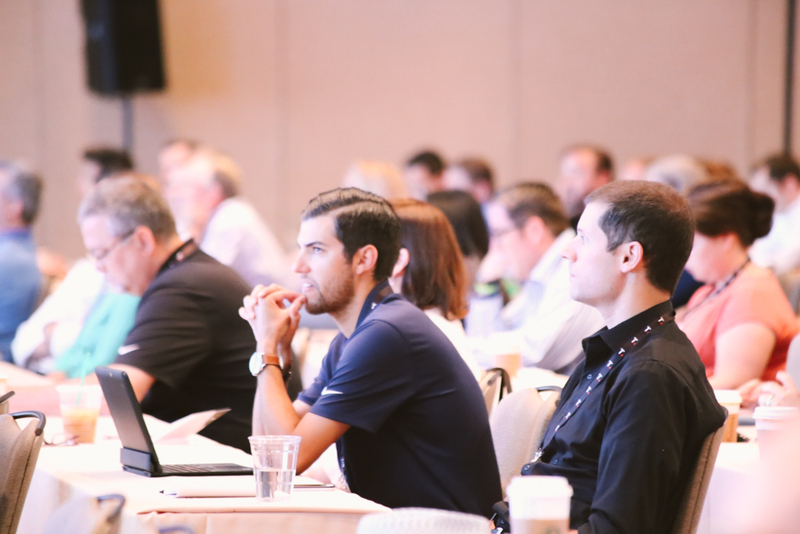 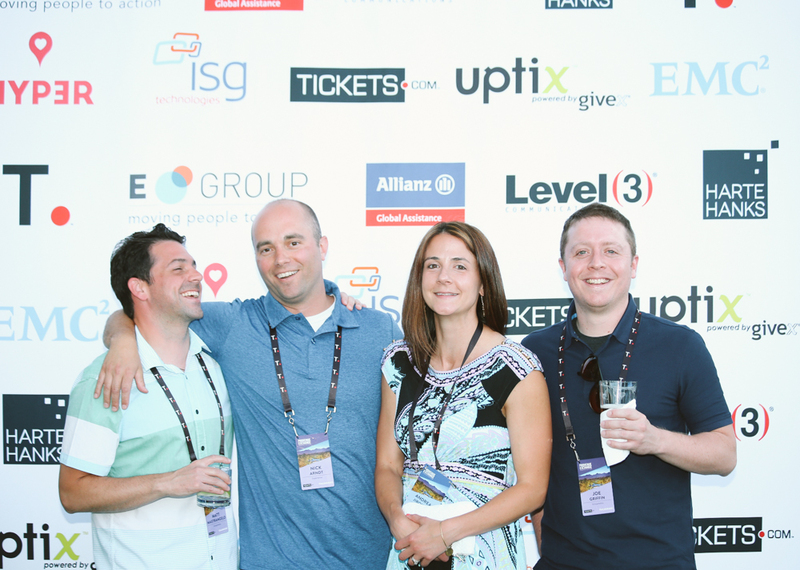 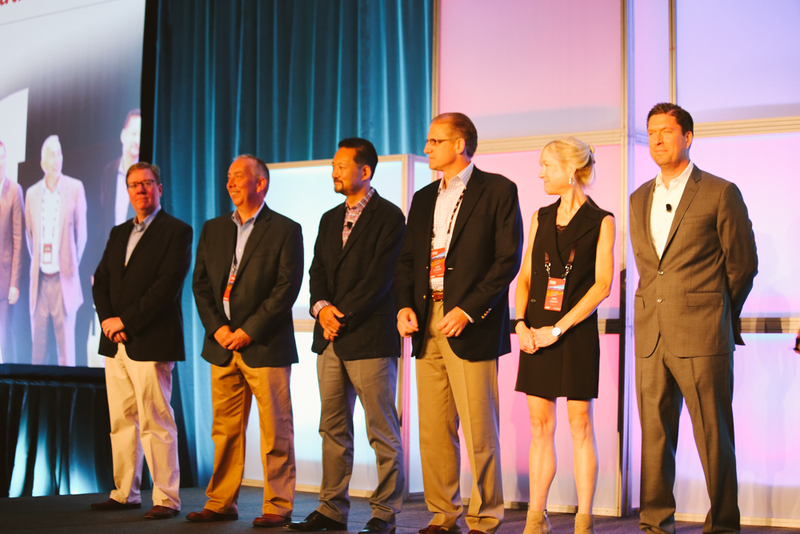 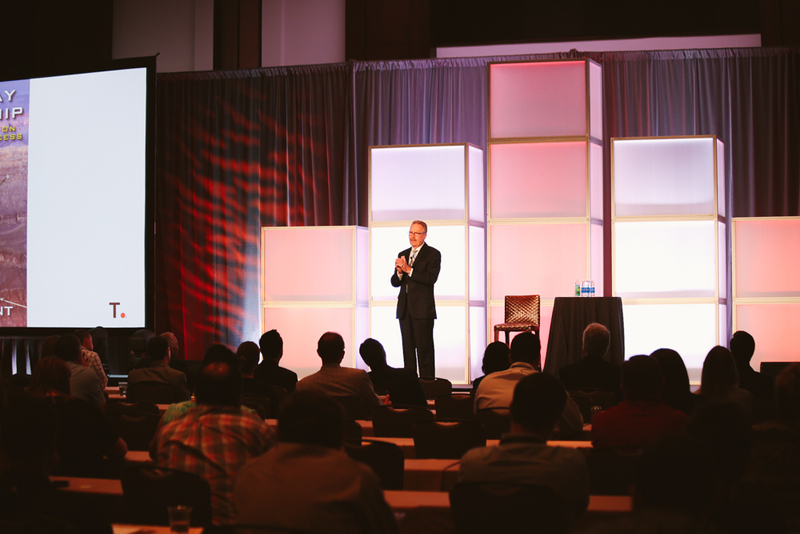 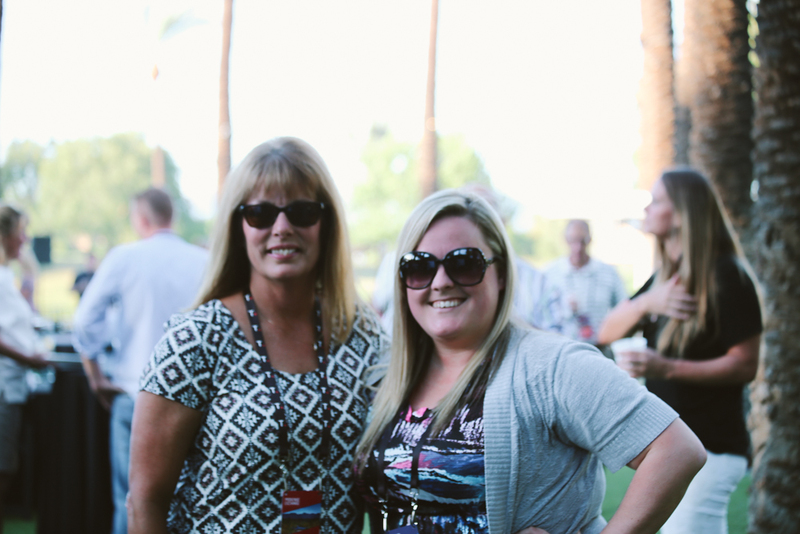 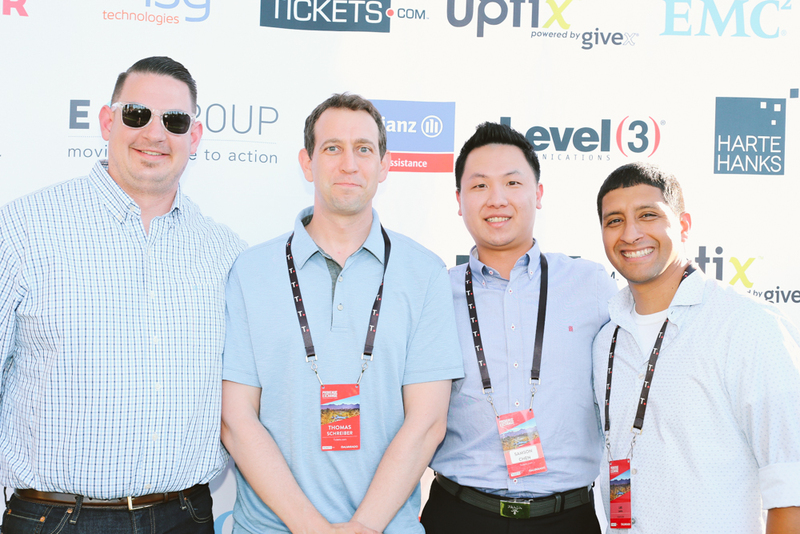 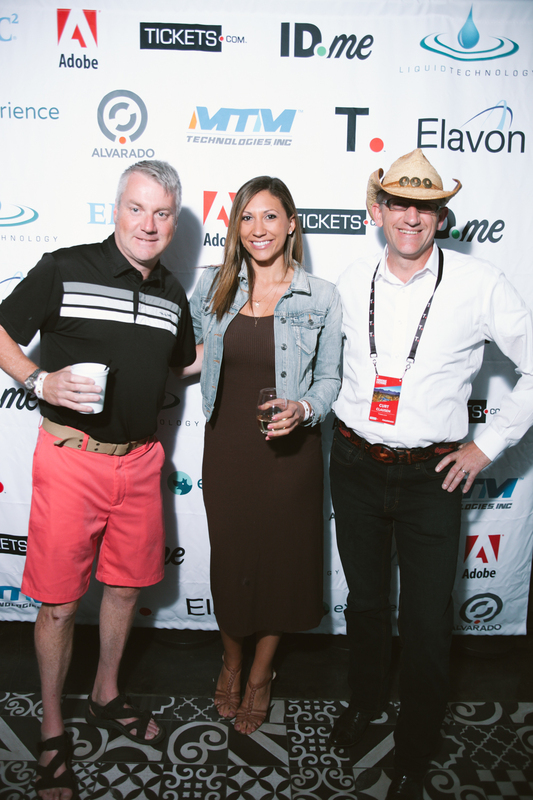 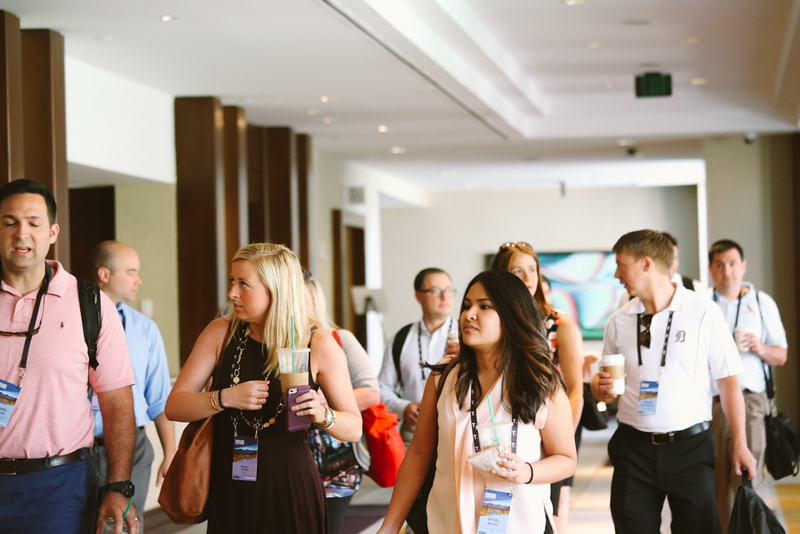 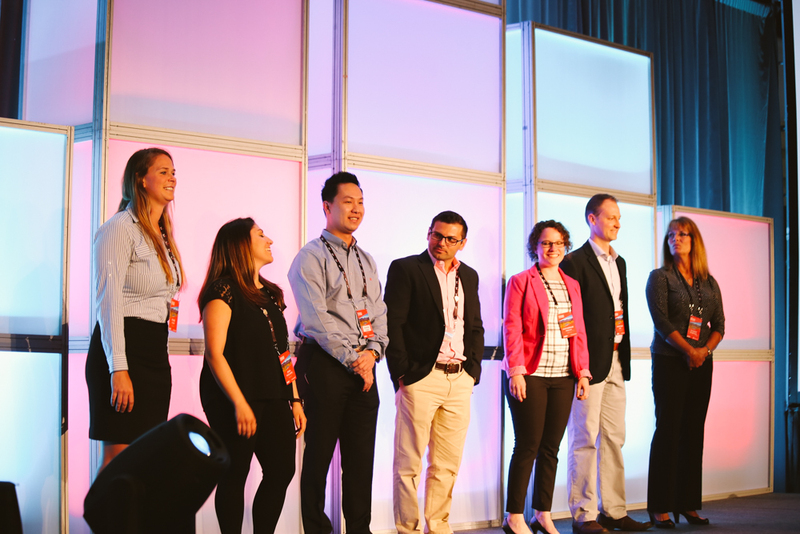 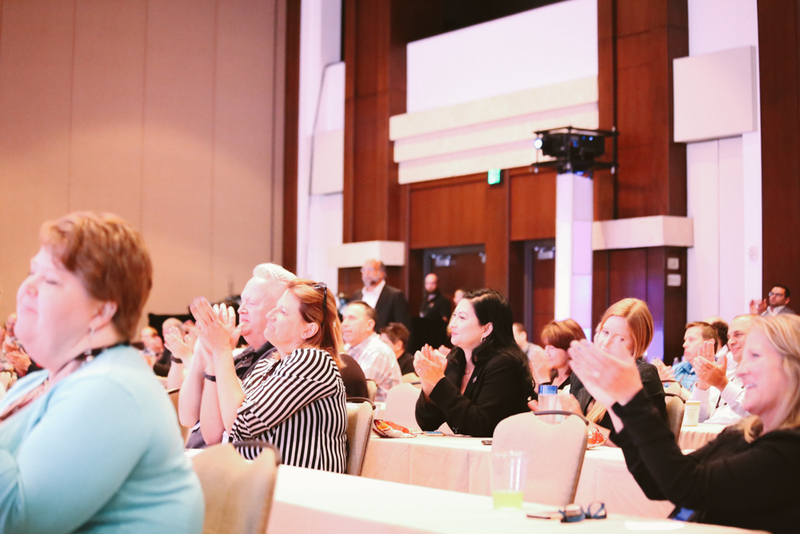 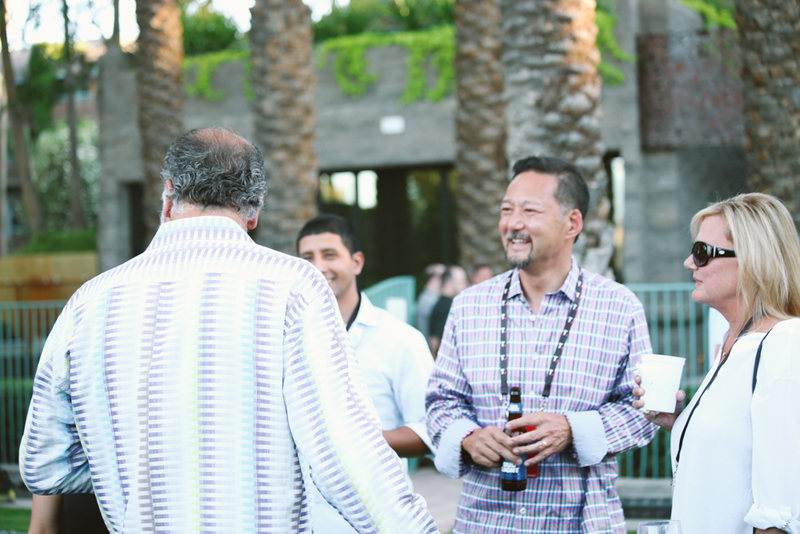 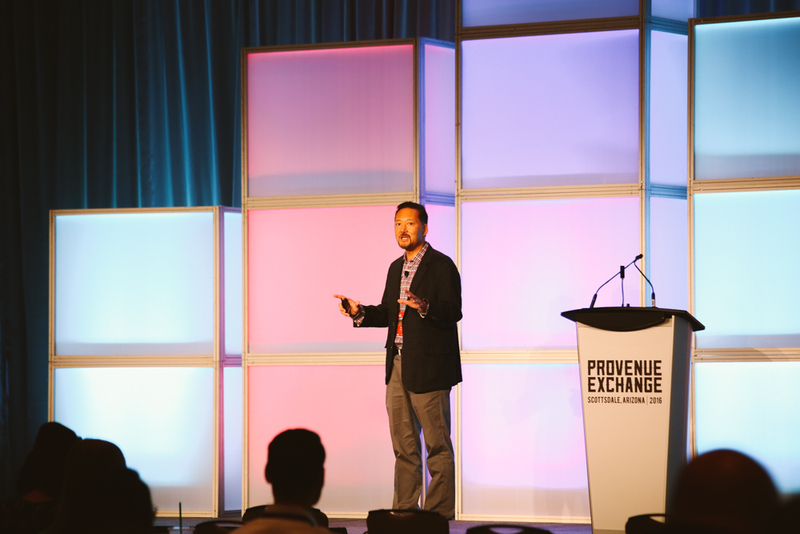 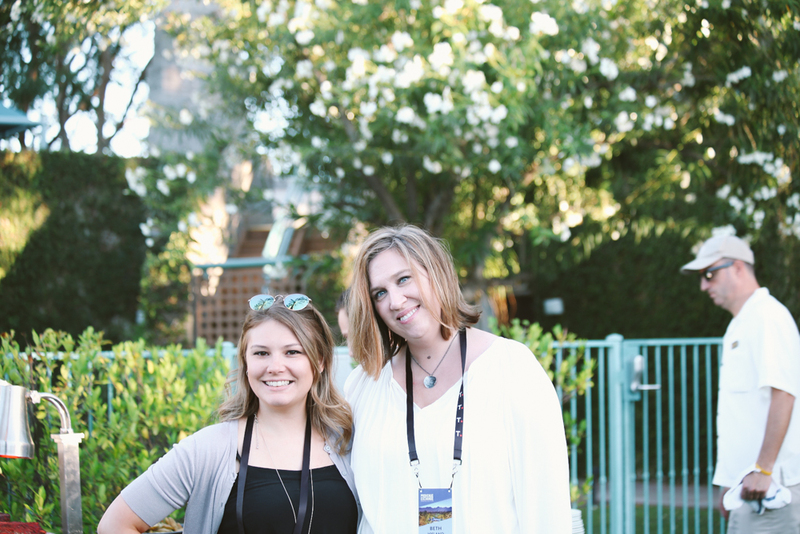 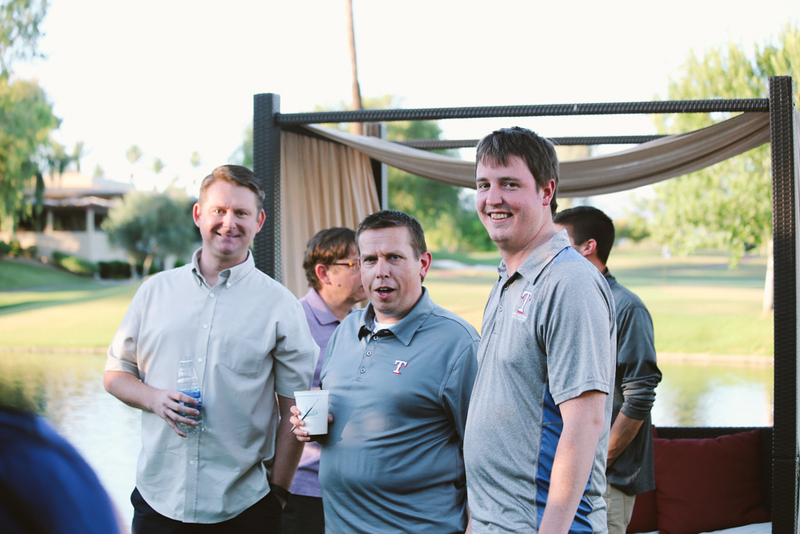 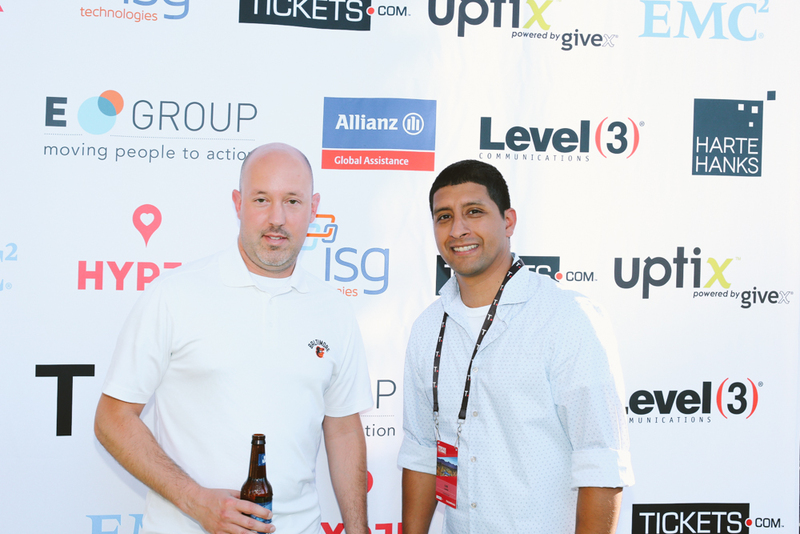 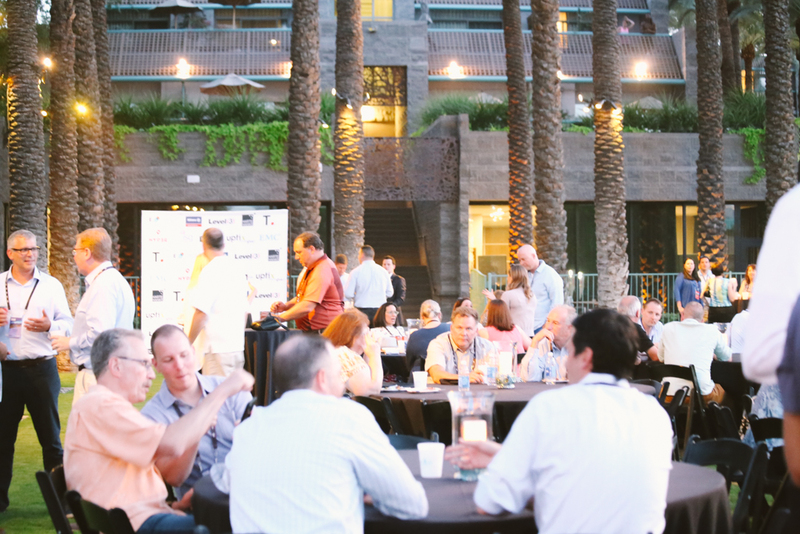 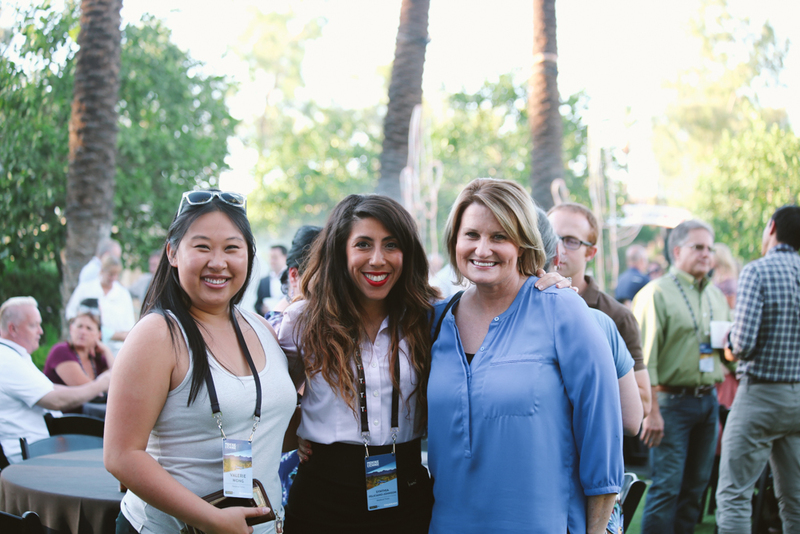 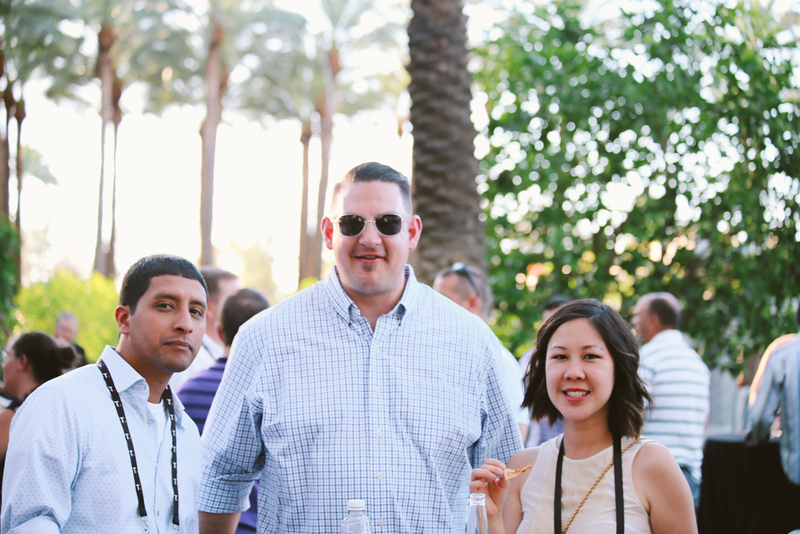 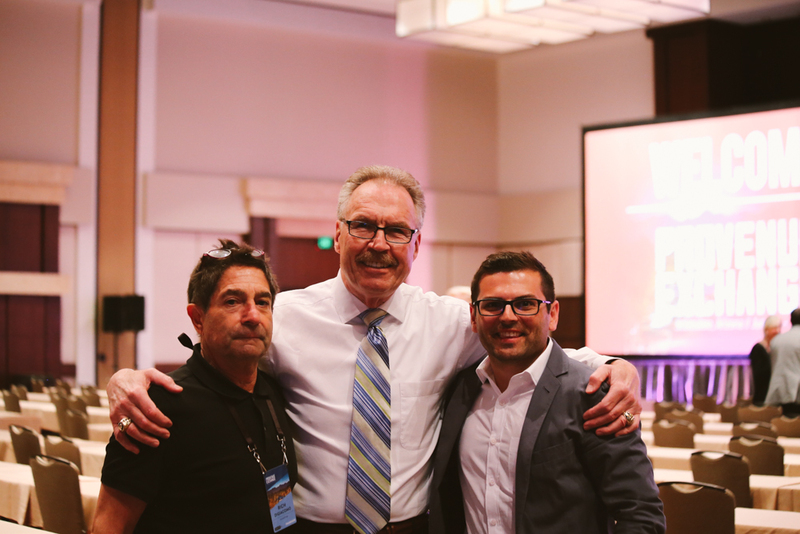 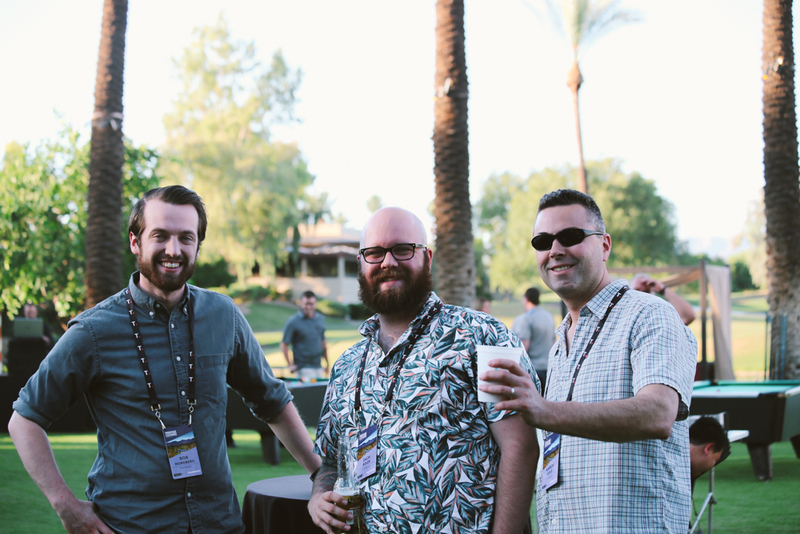 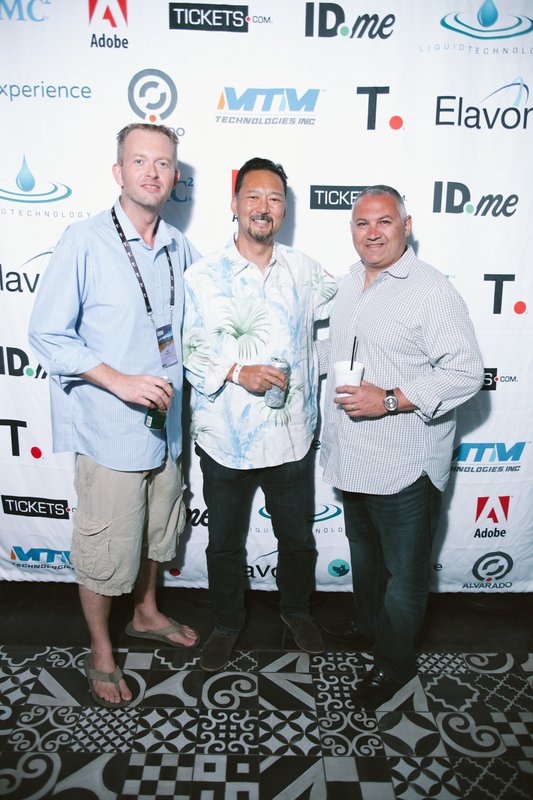 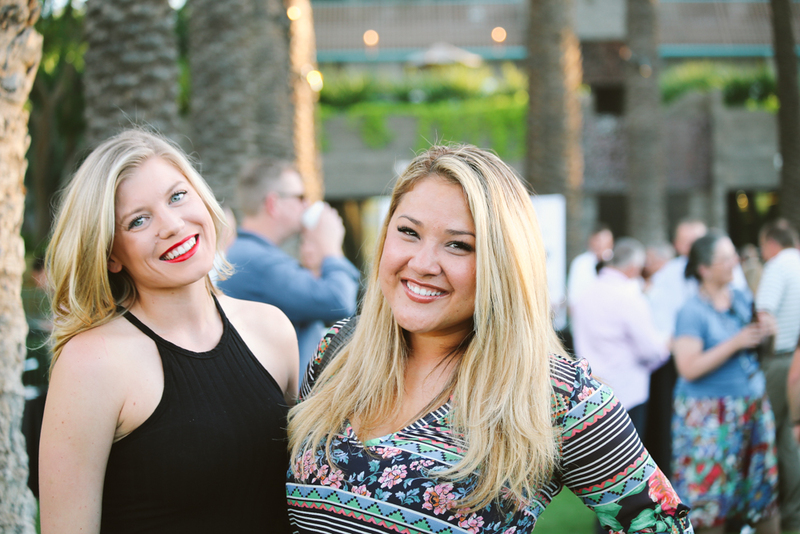 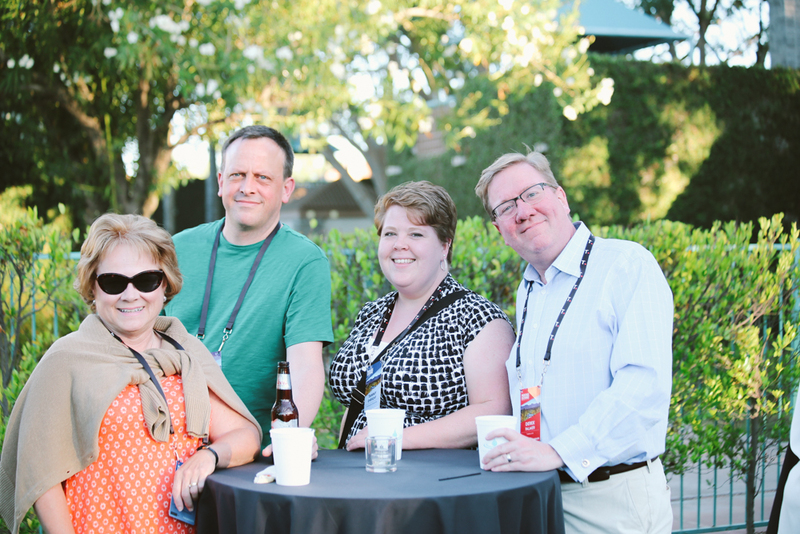 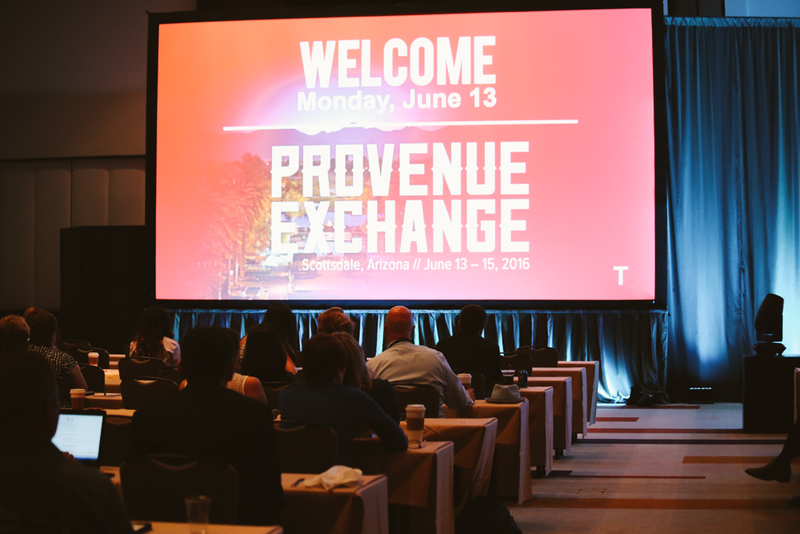 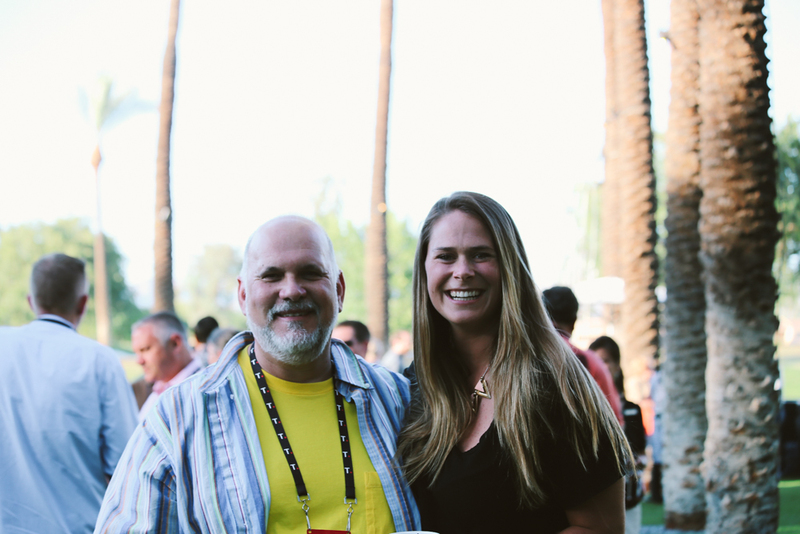 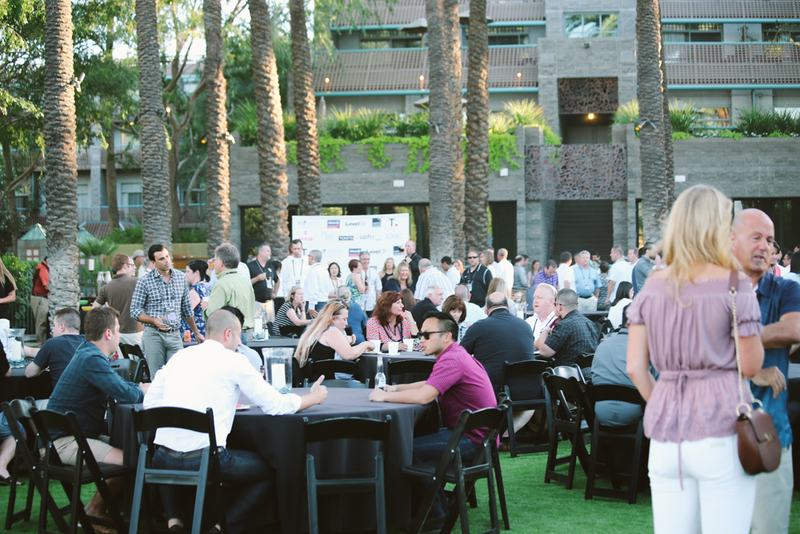 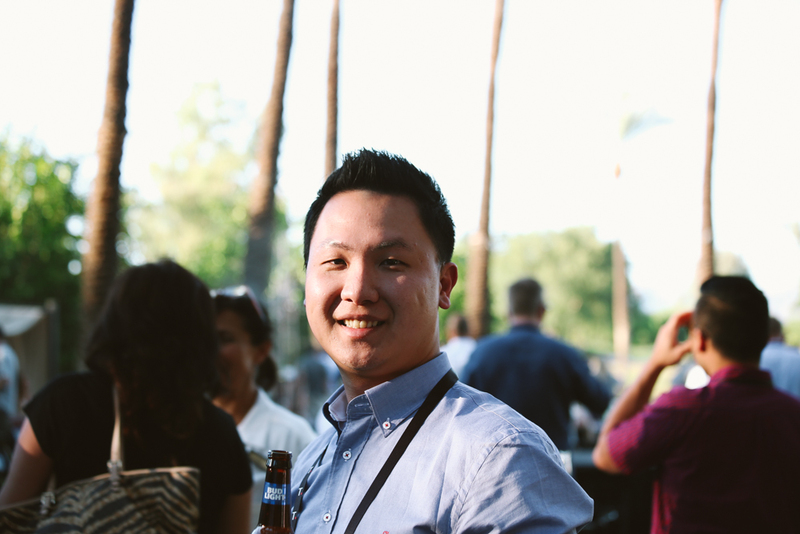 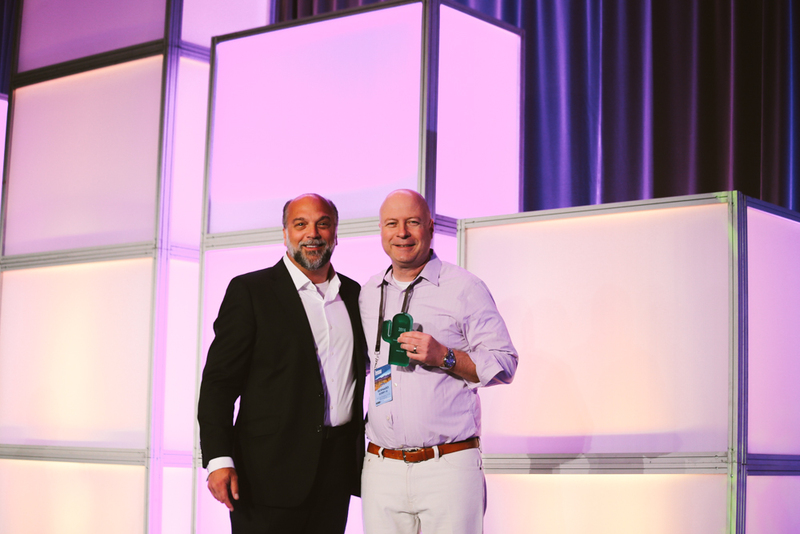 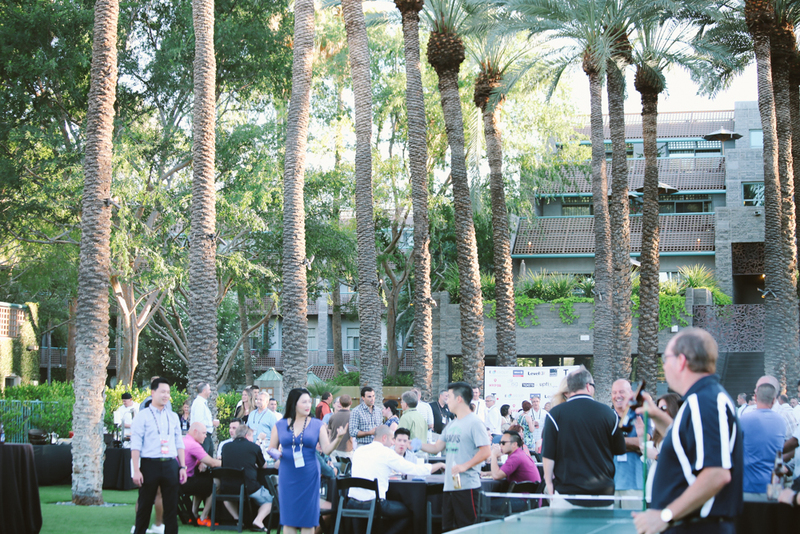 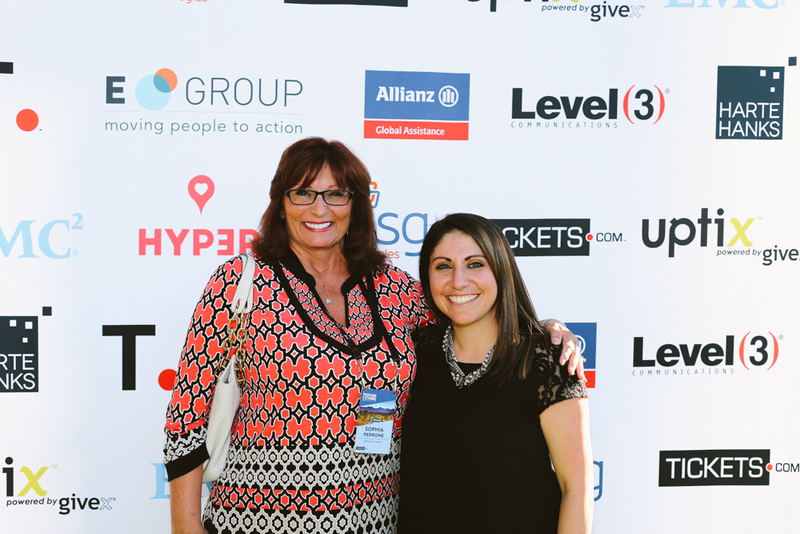 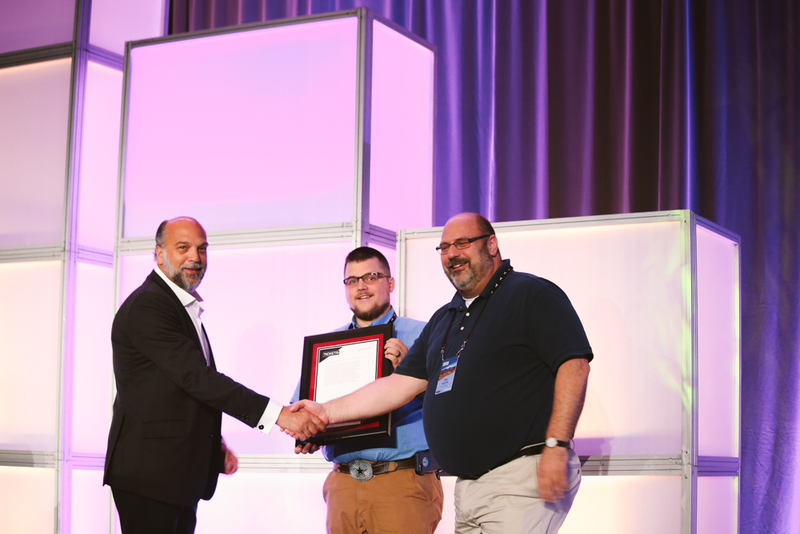 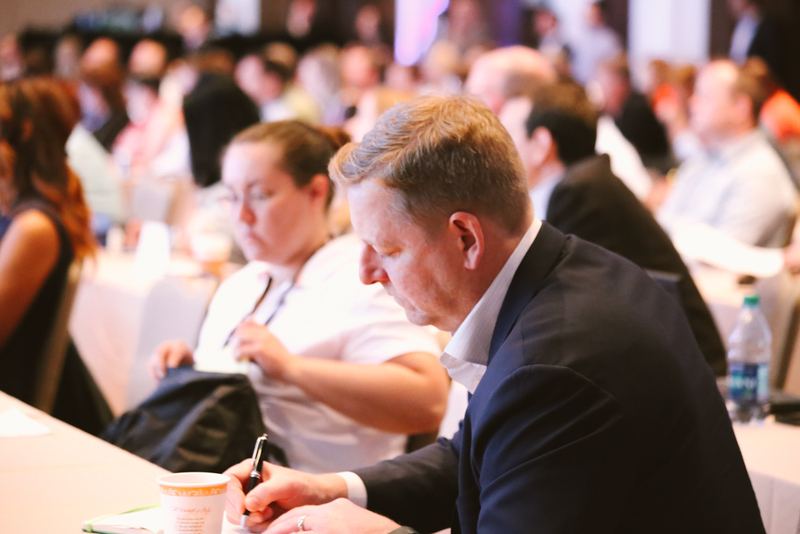 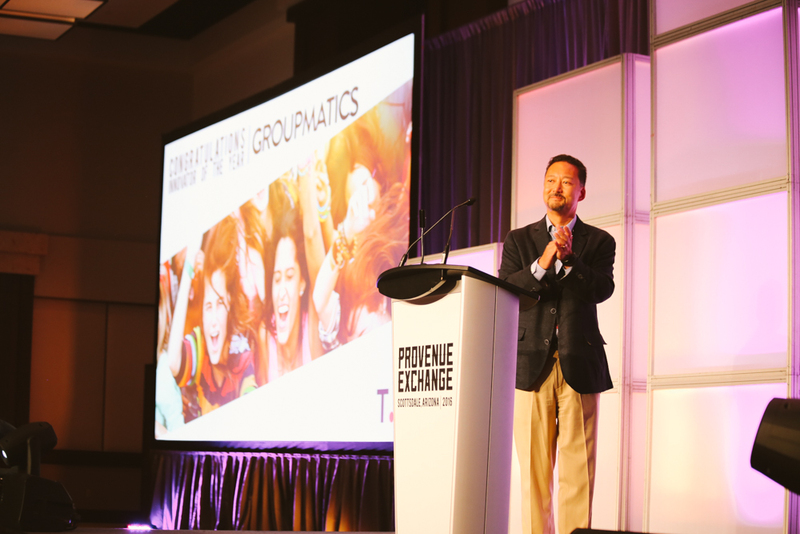 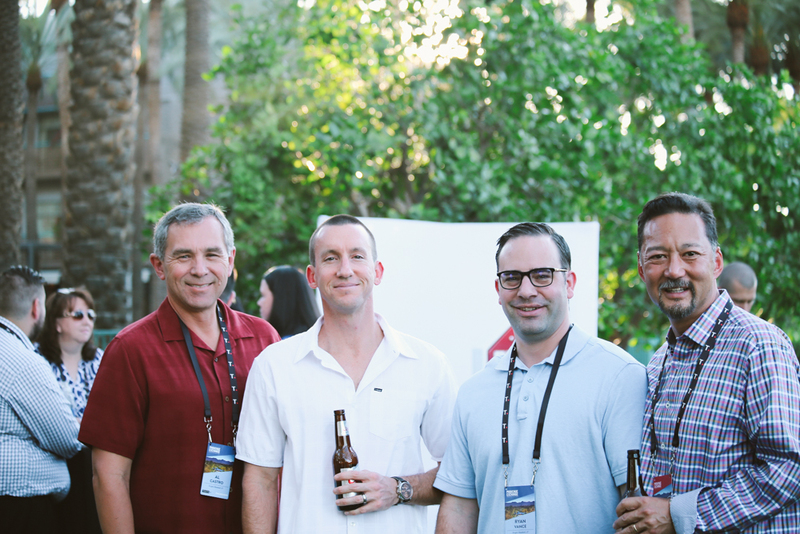 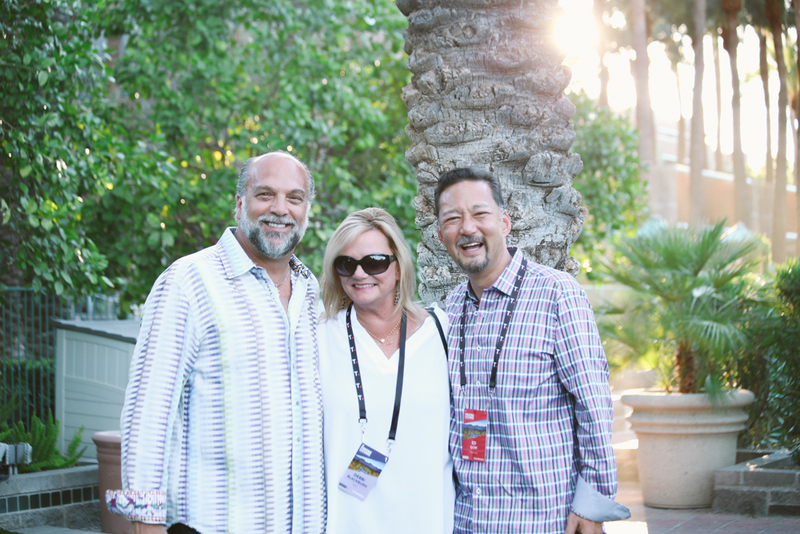 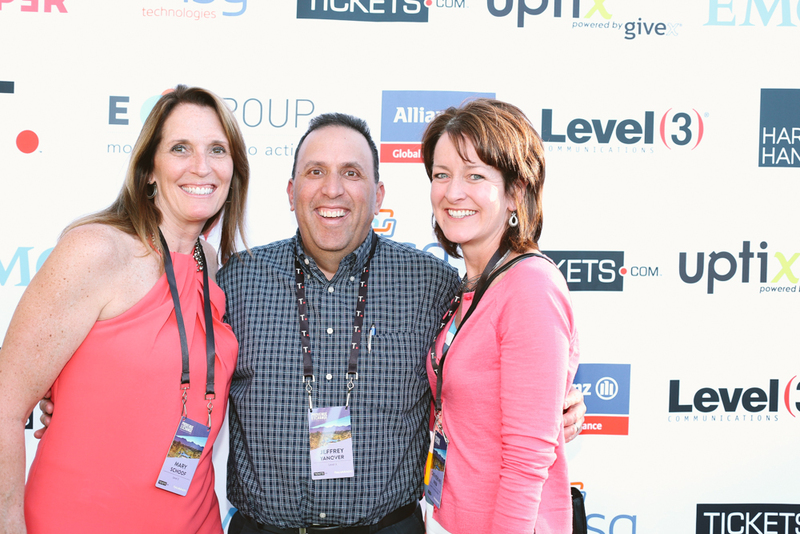 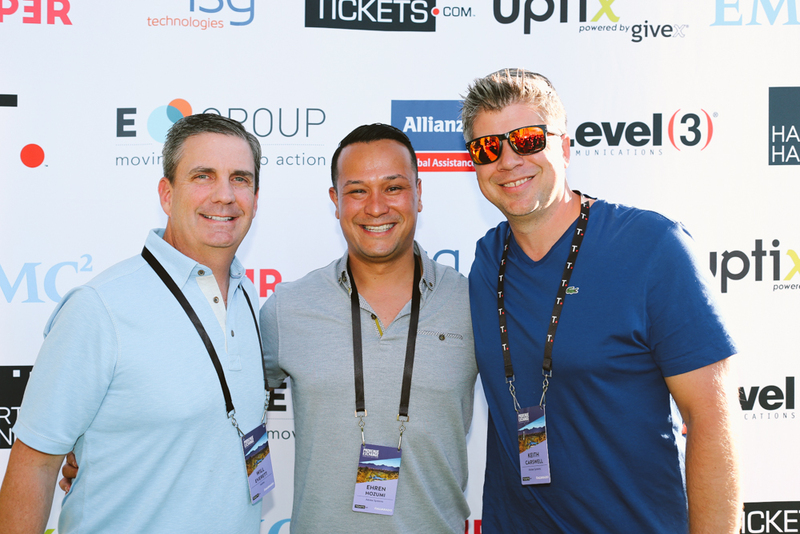 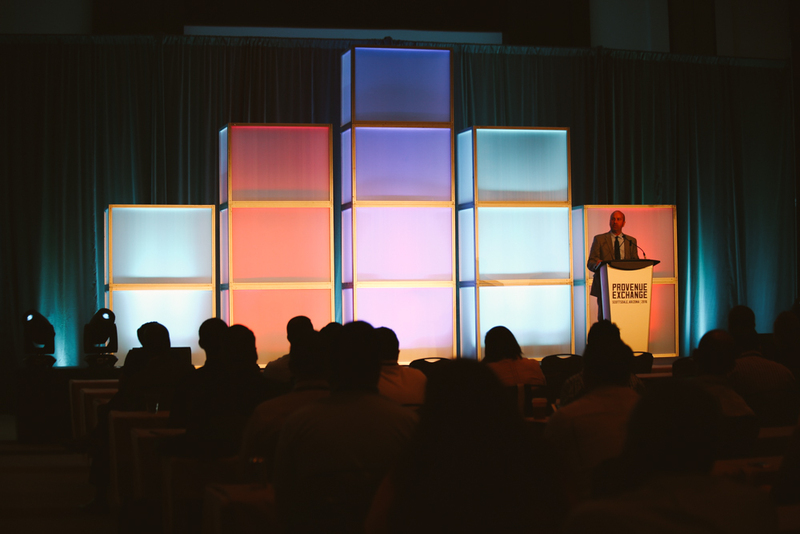 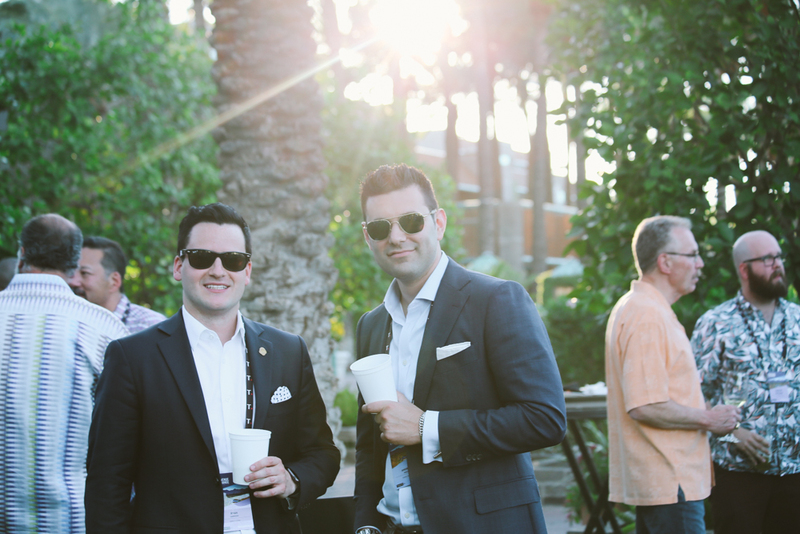 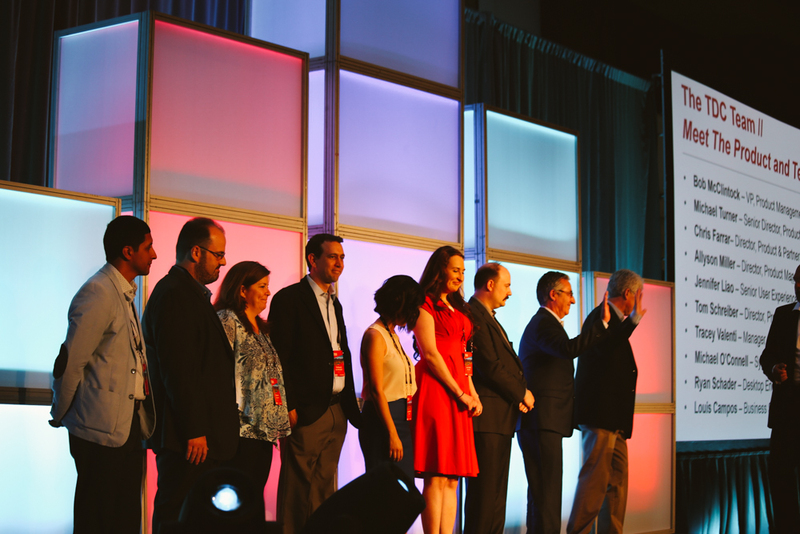 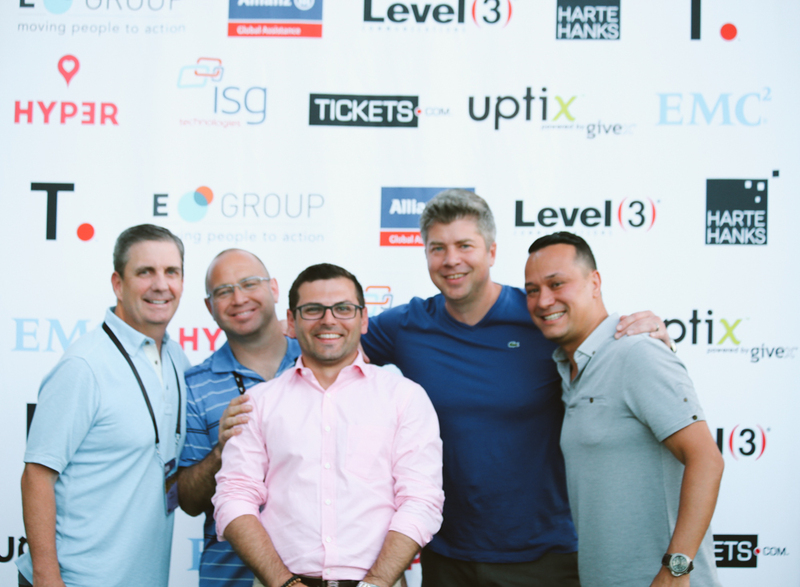 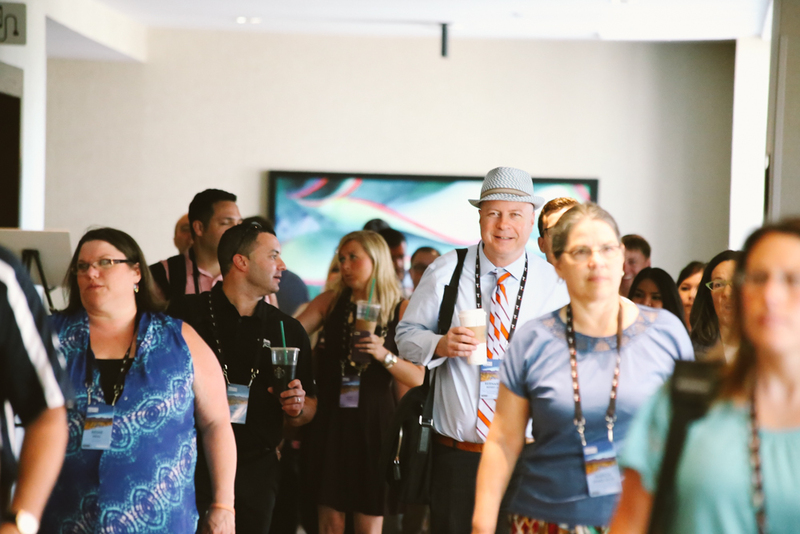 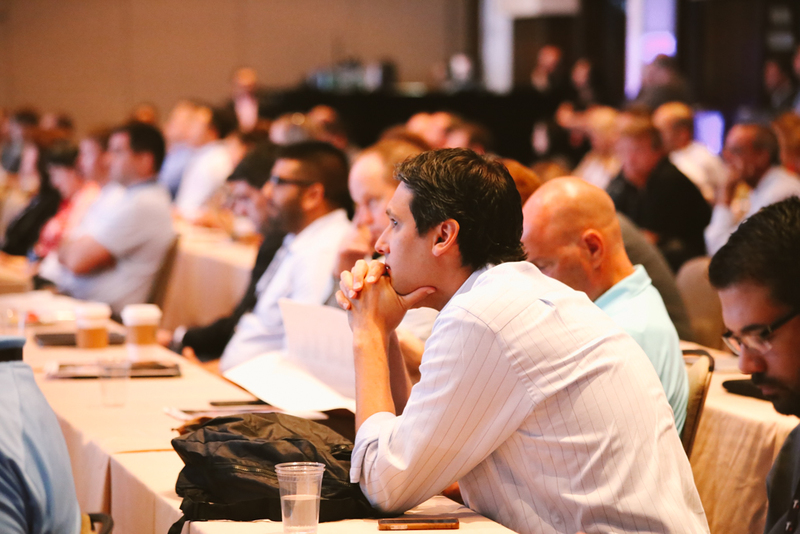 Attendees from all over the world arrived in Scottsdale, Arizona on June 13th, 2016 for the annual ProVenue Exchange conference. 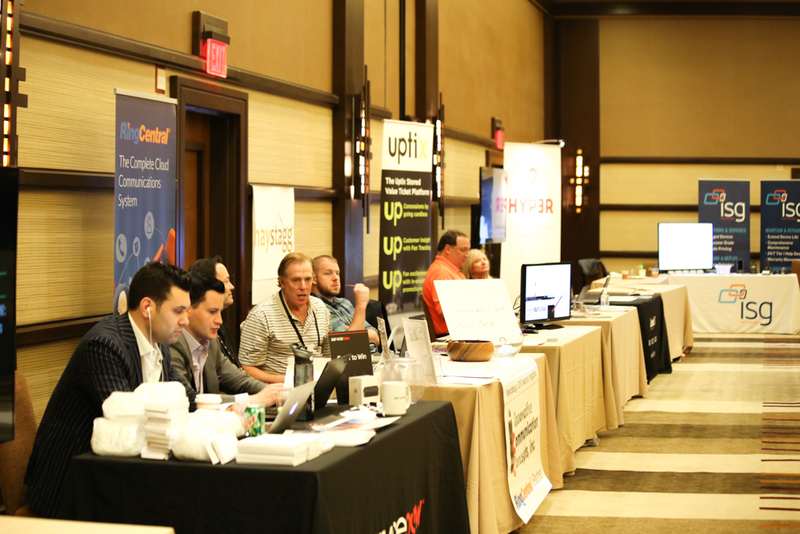 The Tickets.com vision for the 5th annual conference was to create a true peer-to-peer exchange among clients, vendors, and partners, while learning about emerging technologies. 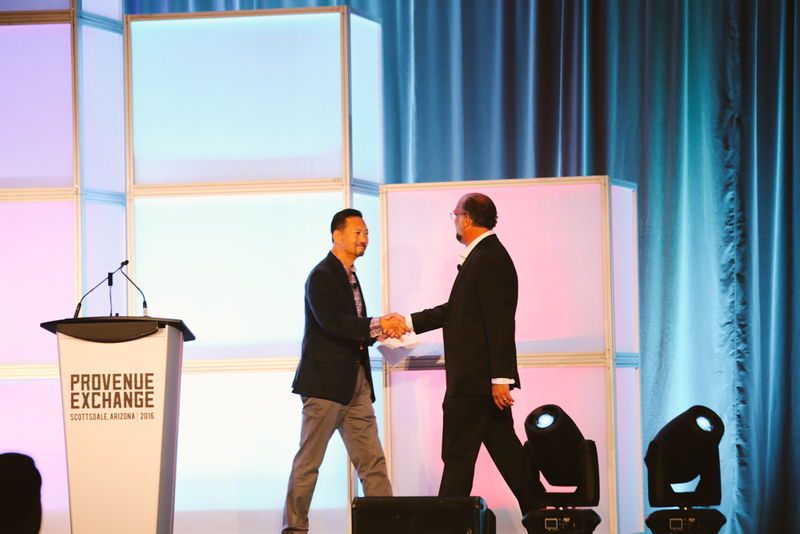 This momentous occasion opened the doors to connecting, collaborating, giving back, and discovering future technology trends. 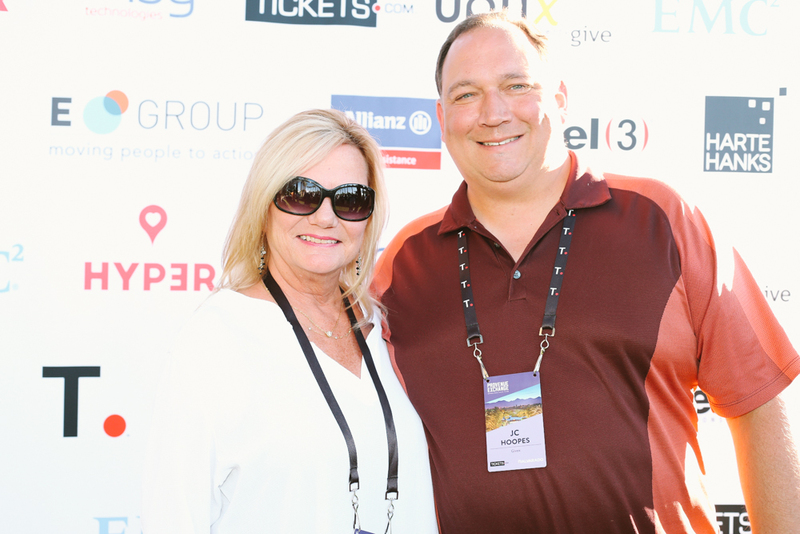 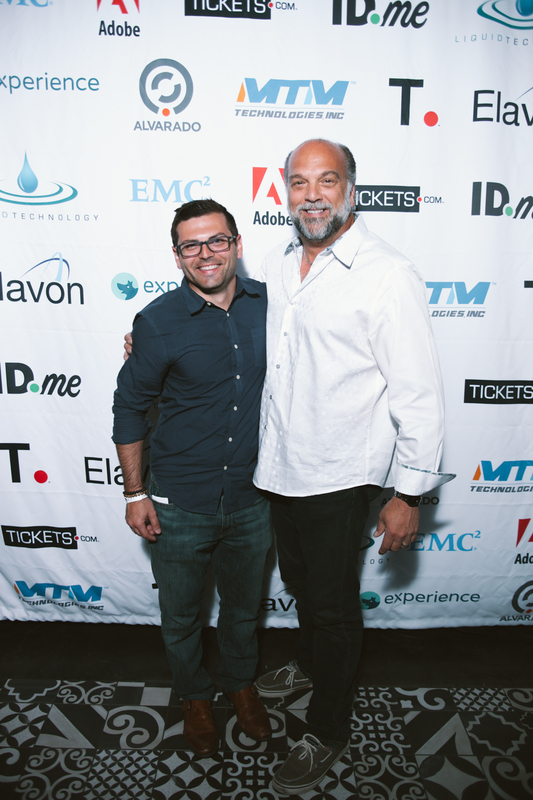 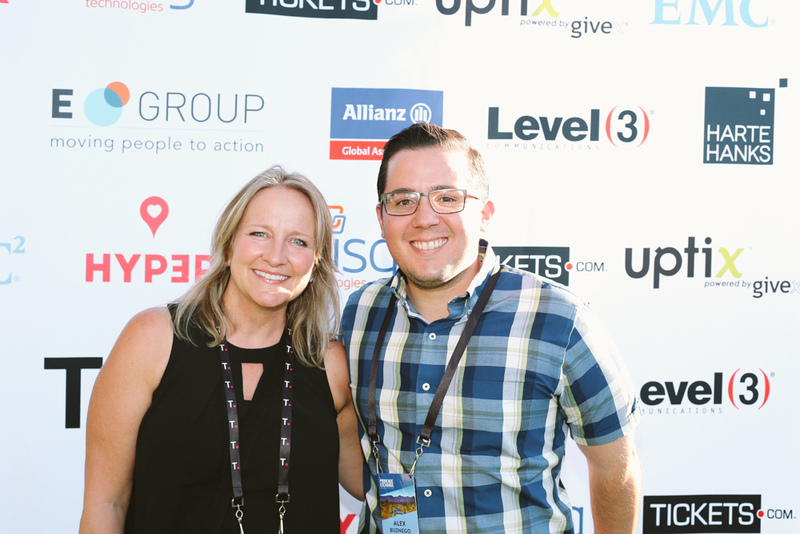 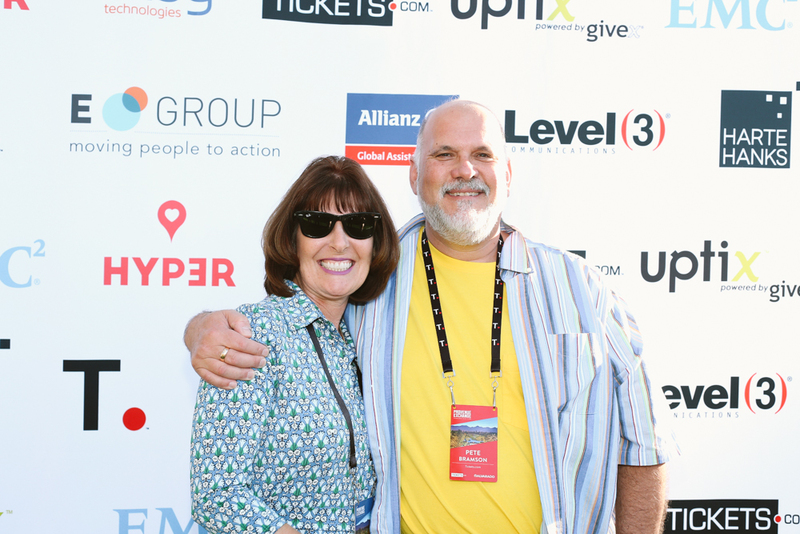 To kick-off the 2.5 day event, Tickets.com President and CEO Joe Choti, shared how “we live in a society where there is massive competition for entertainment time and spend. 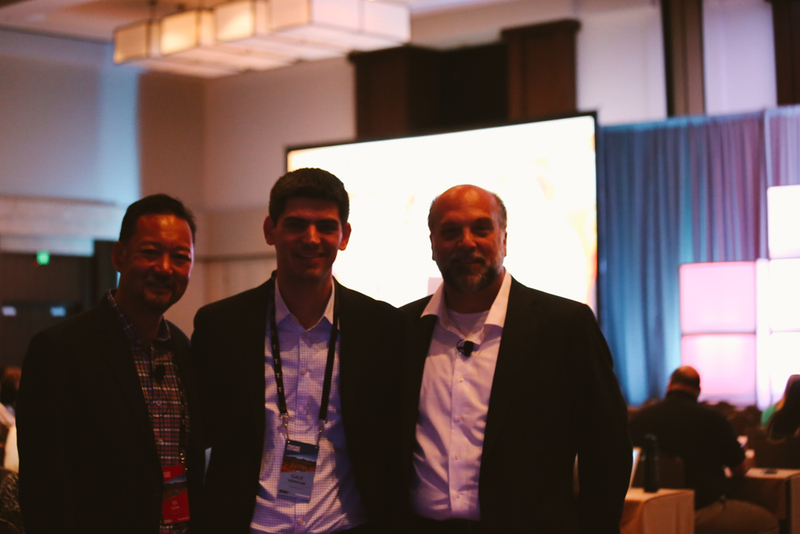 By providing experiences and value we can differentiate ourselves and be successful.” Through innovation, partnerships, and integrations, Joe Choti urged guests to work toward a common purpose: seize opportunity to achieve success, give back to the community to create powerful connections, and inspire confidence in their colleagues to deliver the best value for their patrons. 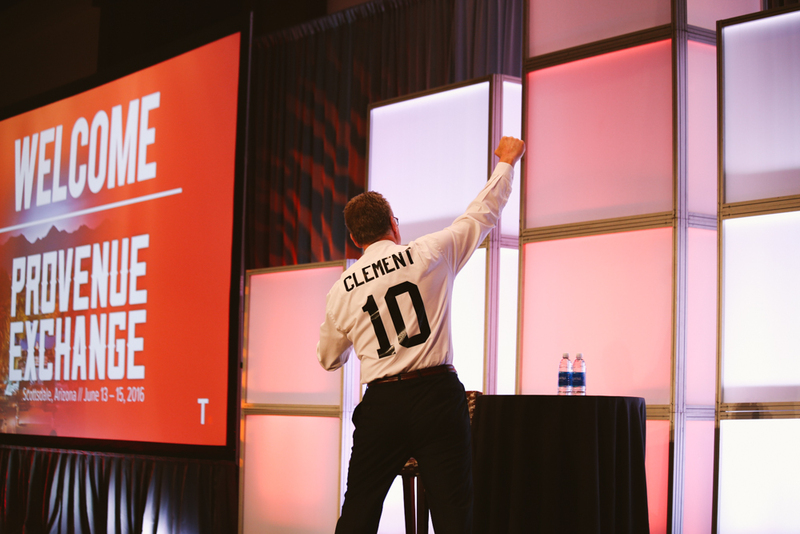 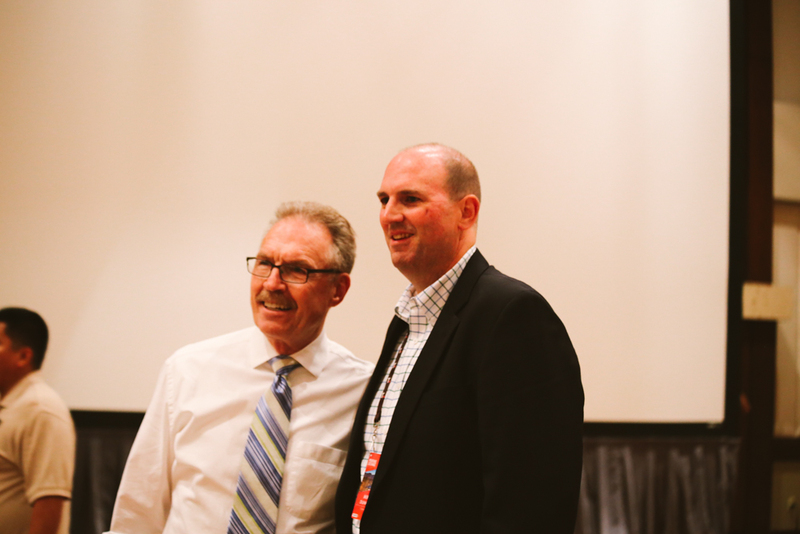 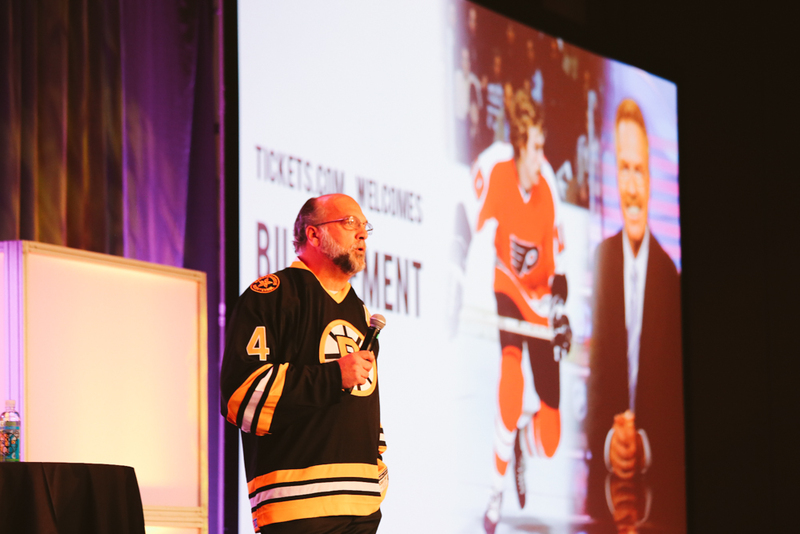 A highlight of the event was when keynote speaker, Bill Clement, two-time Stanley Cup Champion and current hockey analyst for ESPN. 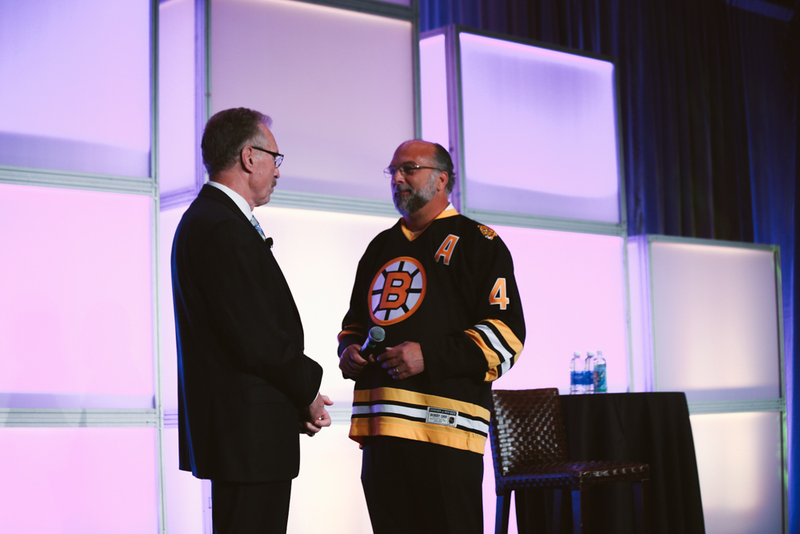 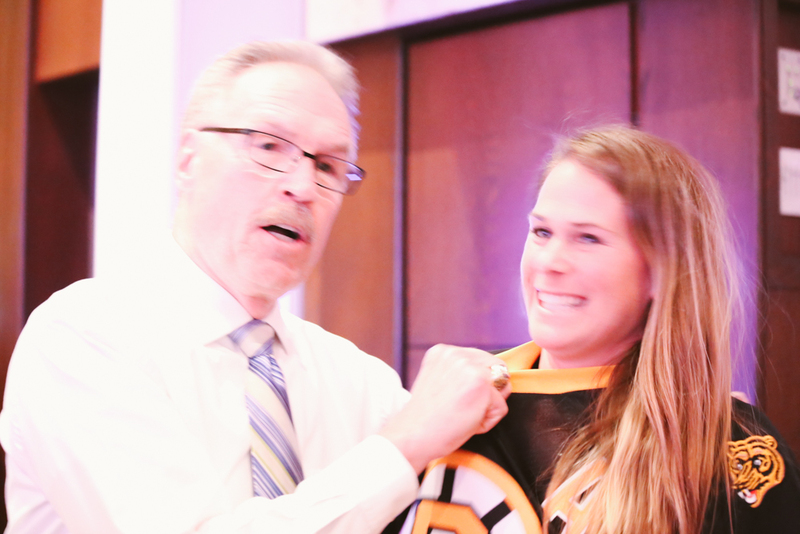 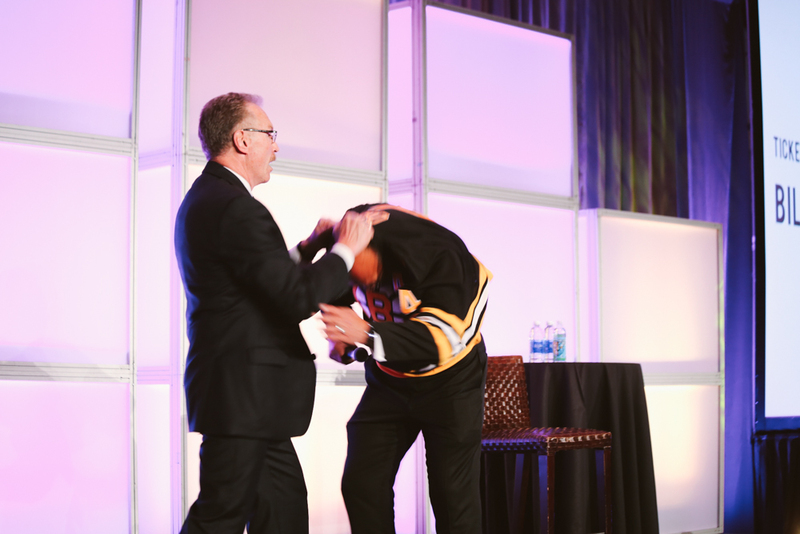 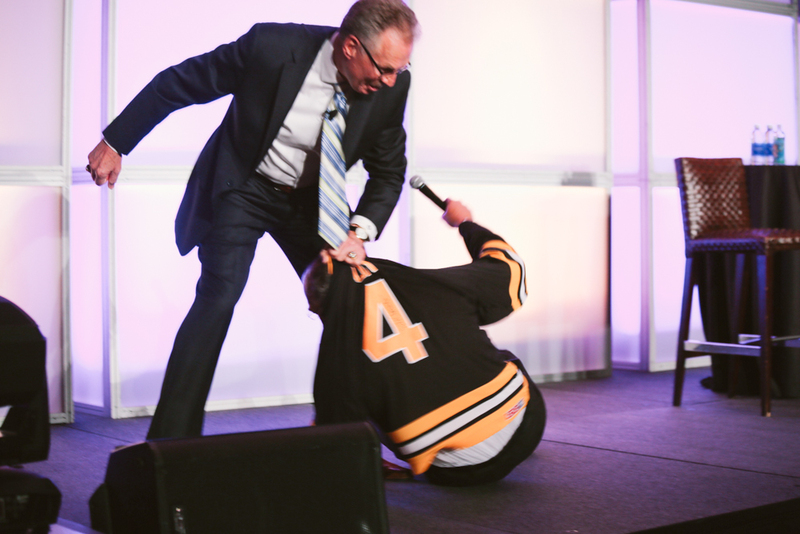 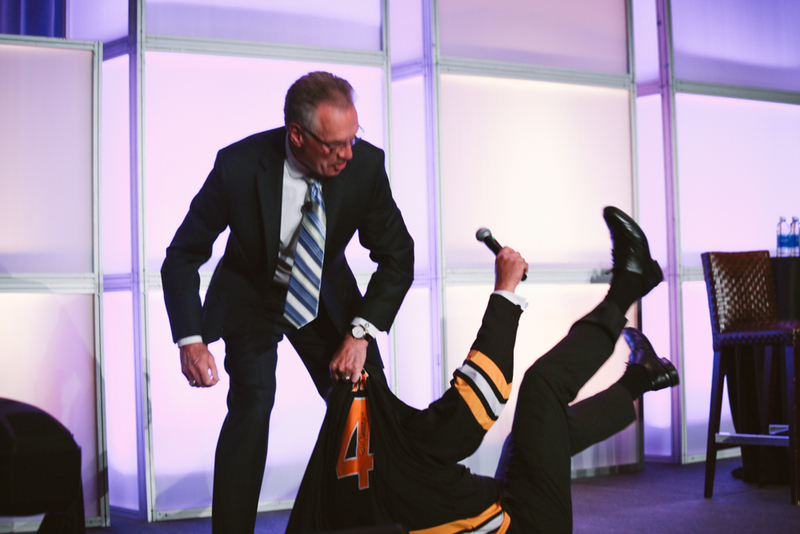 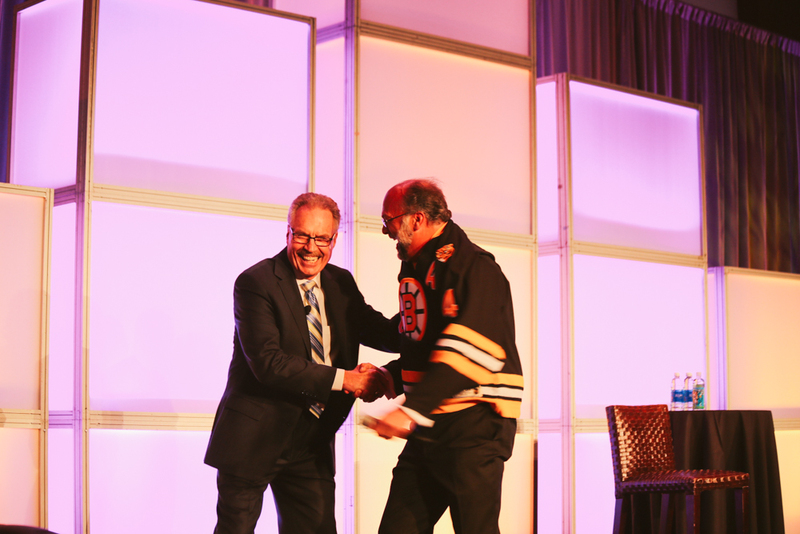 He captured the audience by walking up on stage and re-enacting his infamous 1972 NHL fight with Tickets.com’s own CEO, Joe Choti. 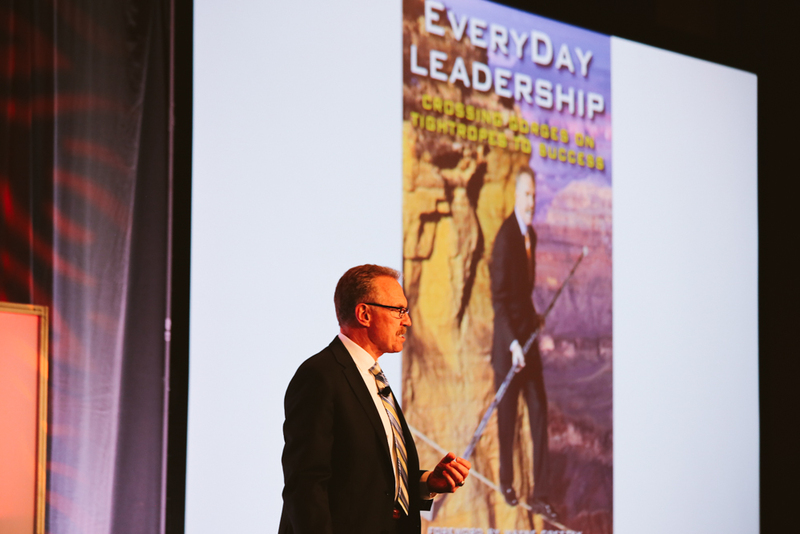 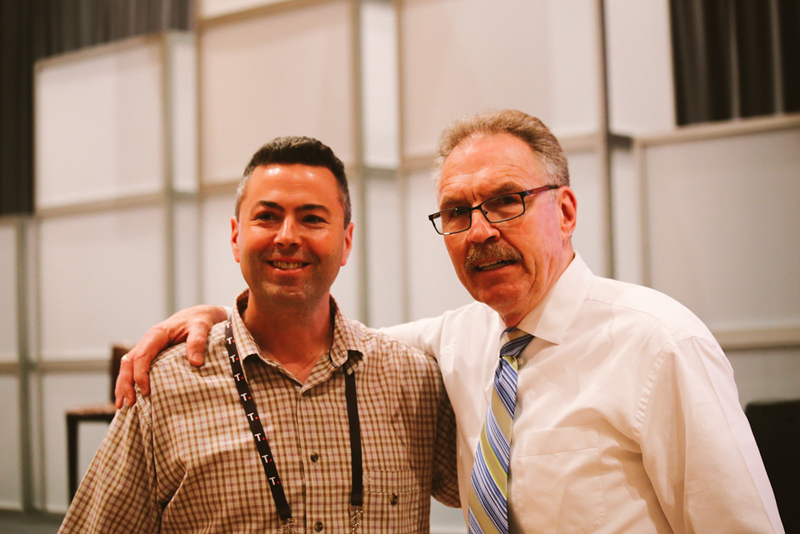 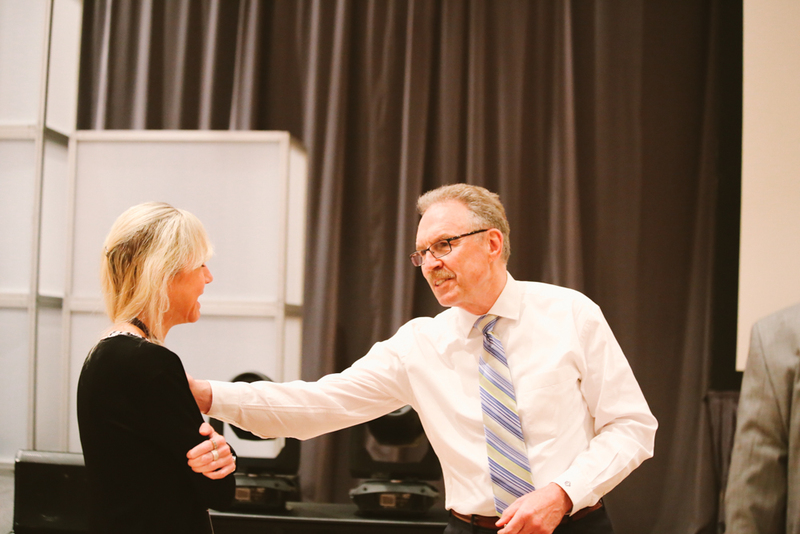 Bill’s message inspired the audience, sharing “…leadership has little to do with job titles. 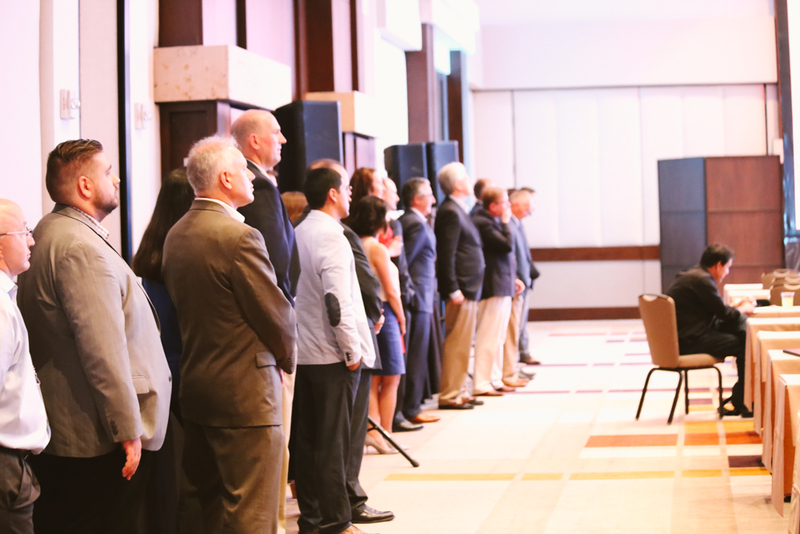 We are all in a position of leadership 24 hours a day 7 days a week.” Bill continued to speak about the choices everyday leaders have to make, both in and out of the business world. 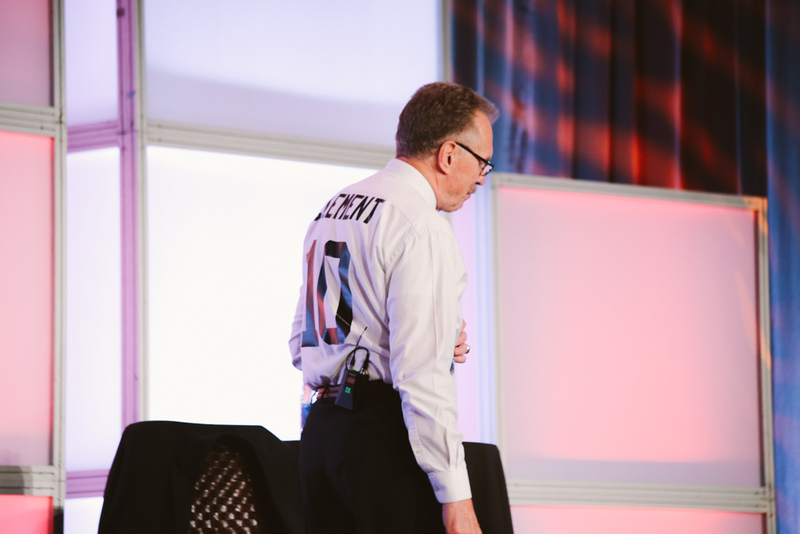 Leaving the past behind, giving to your company culture more than you take, and making colleagues feel vital to the outcome of your business were all key points in Bill’s message. 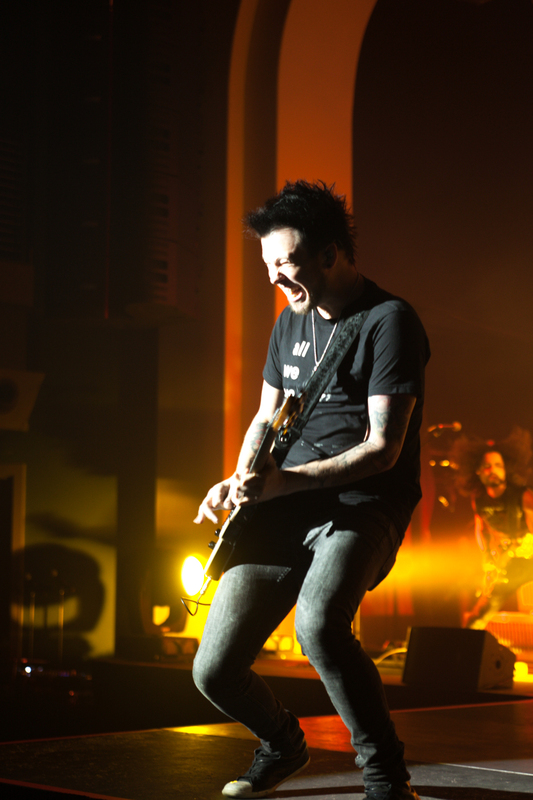 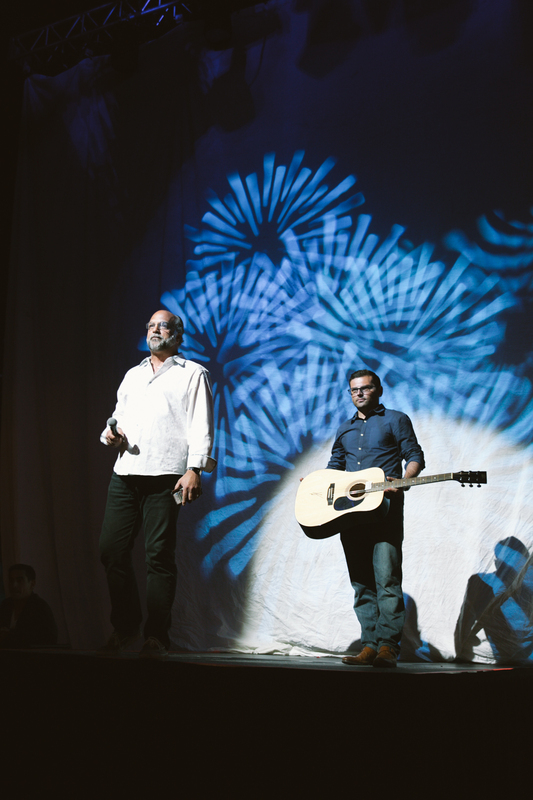 He exited the stage to a standing ovation and left the audience feeling inspired and empowered. 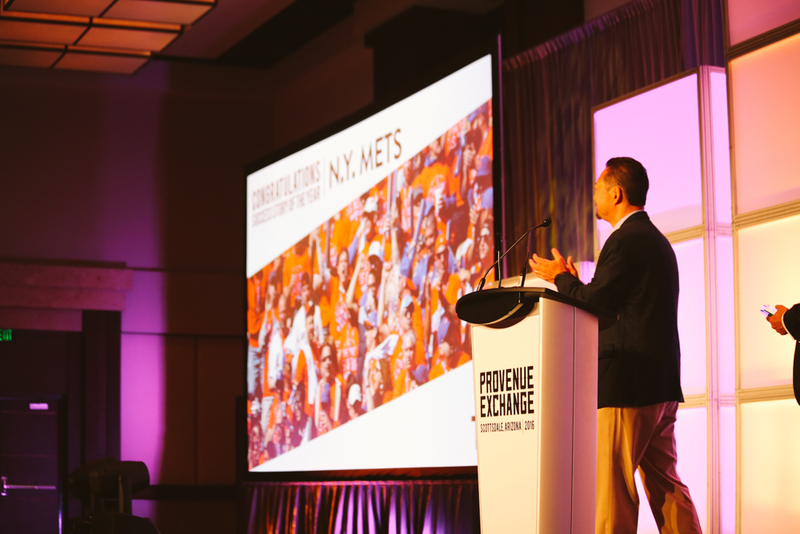 Discover more about ProVenue Exchange. 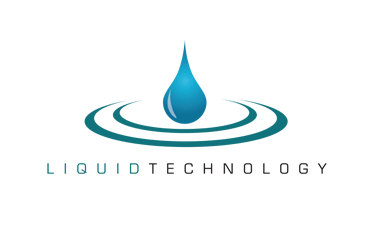 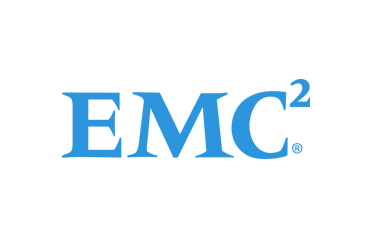 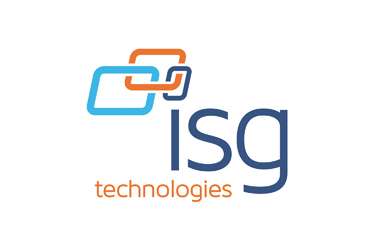 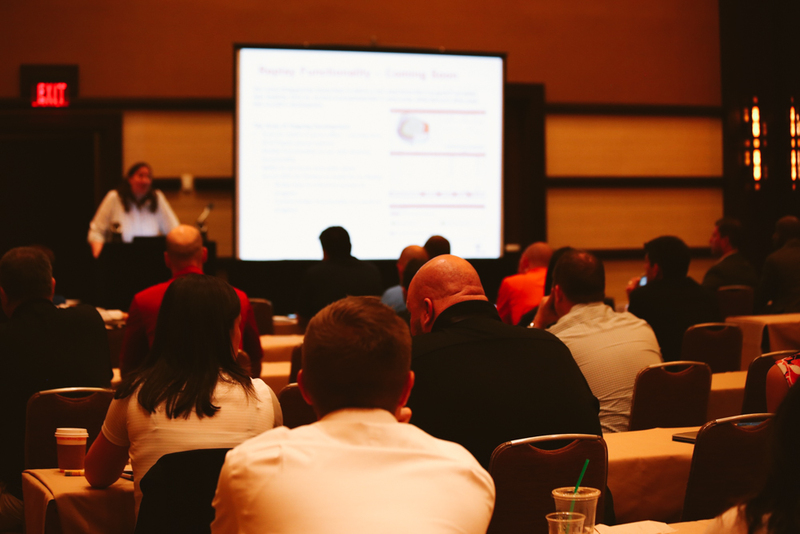 Read about our Technology Training Sessions or Evening Out Events below. 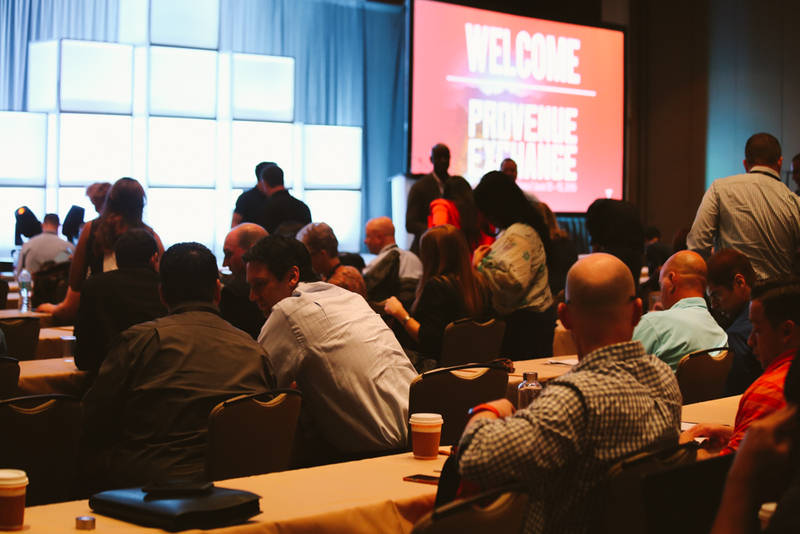 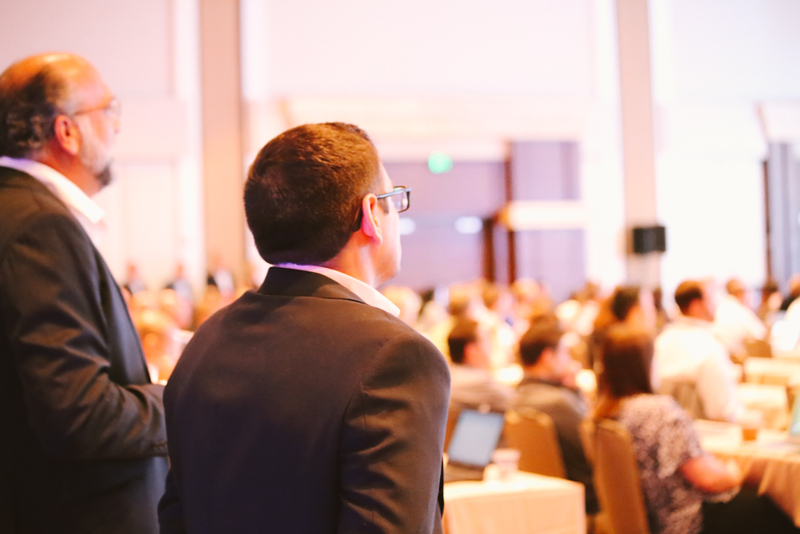 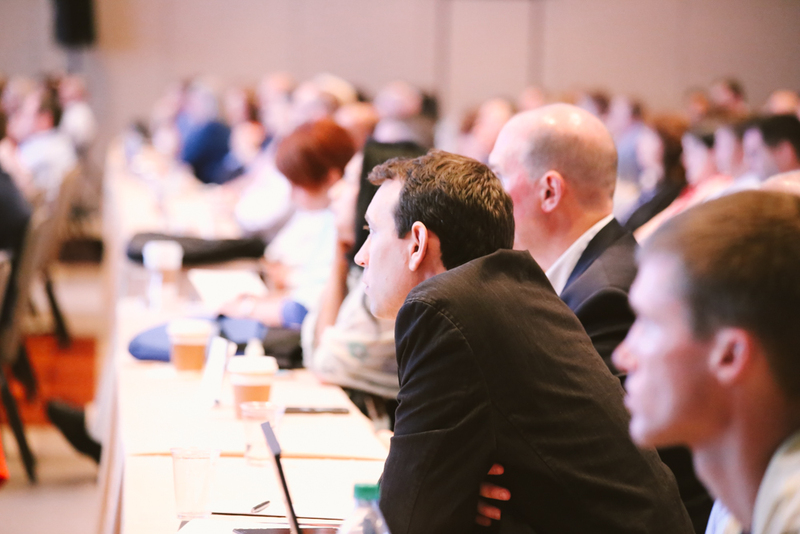 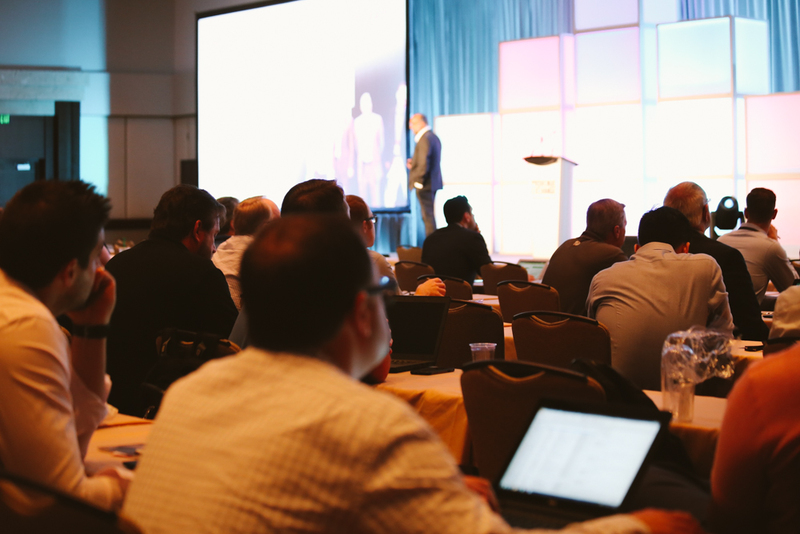 Learn more about our attendees reactions to the conference by downloading our PVEX16 Survey Report which presents interpretations, conclusions, ratings, recommendations and more. 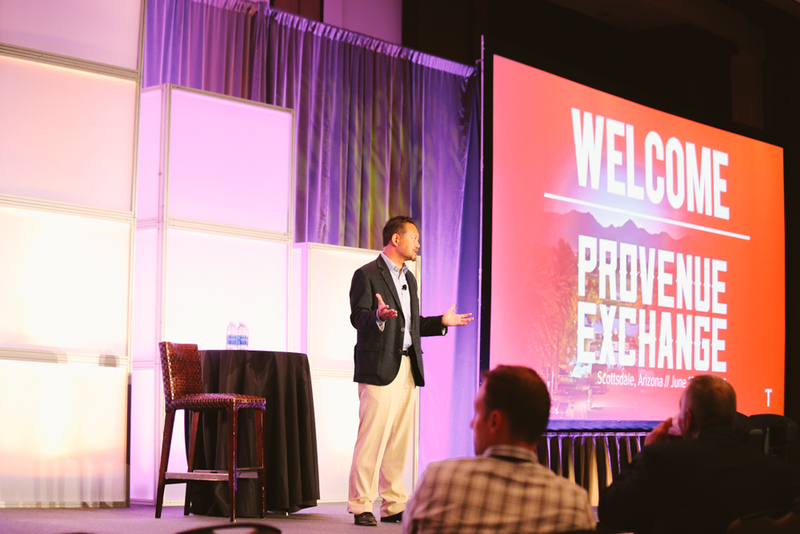 "Great experience at PV Exchange in Scottsdale. 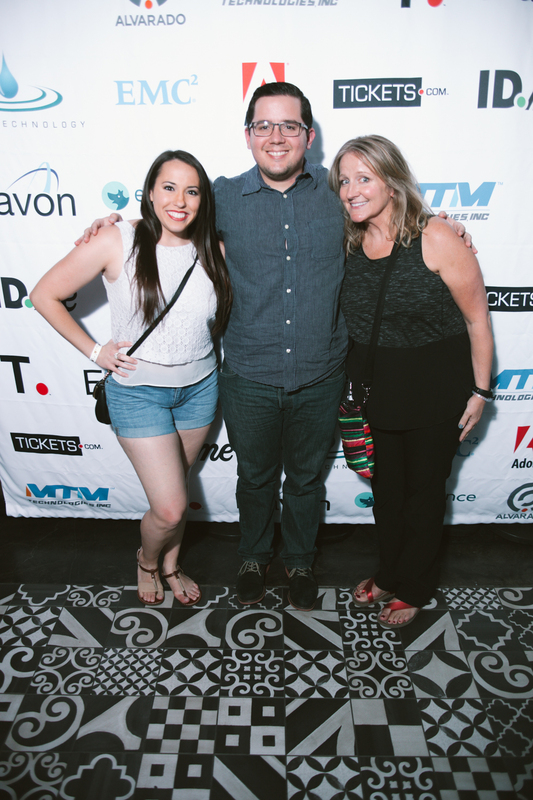 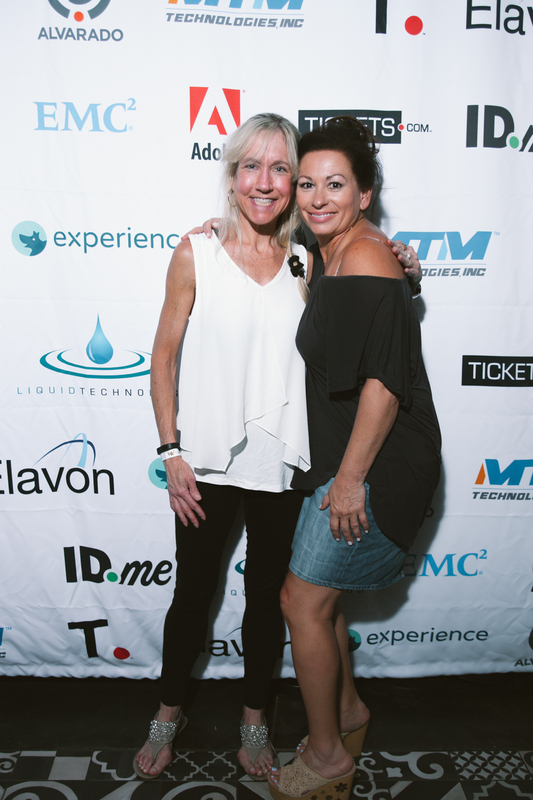 Interacting with TDC personnel and other TDC clients is very valuable to advancing our partnership with Tickets.com"
"I had a great time at the PV Exchange! 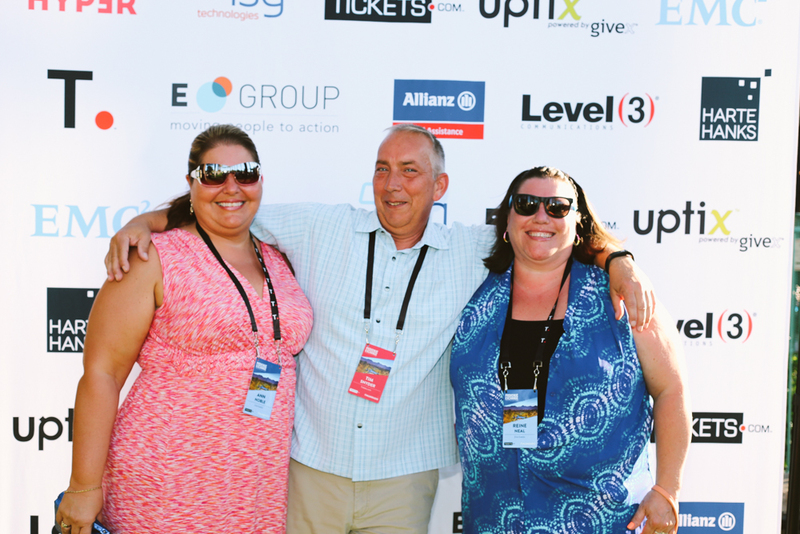 There was time to do lots of great networking and made several new friends. 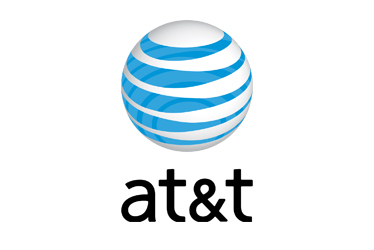 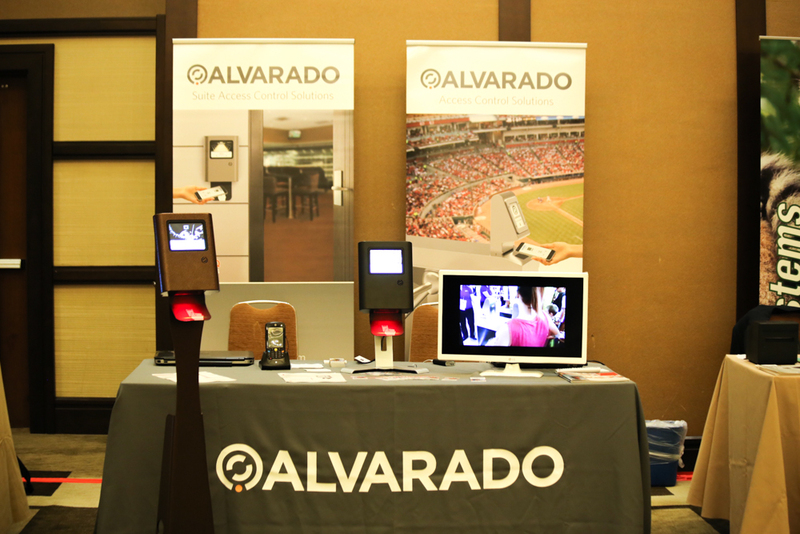 I'm also excited to see some of the new features that PV will be offering in the near future." 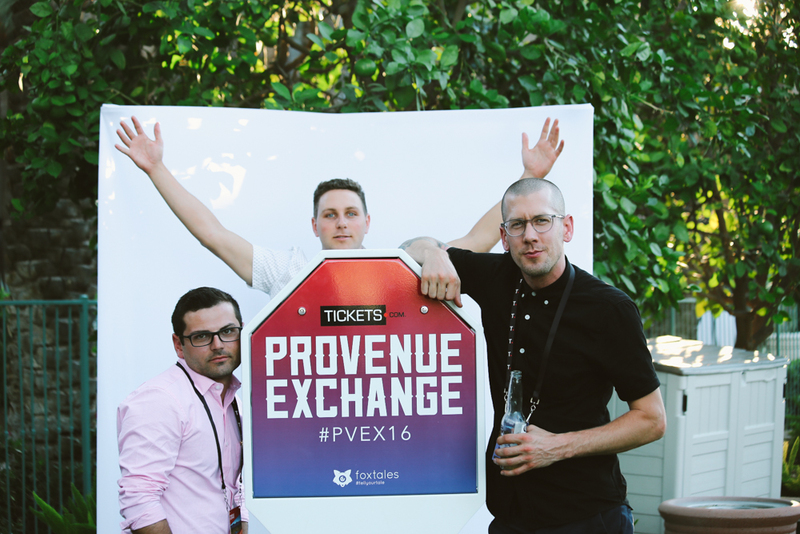 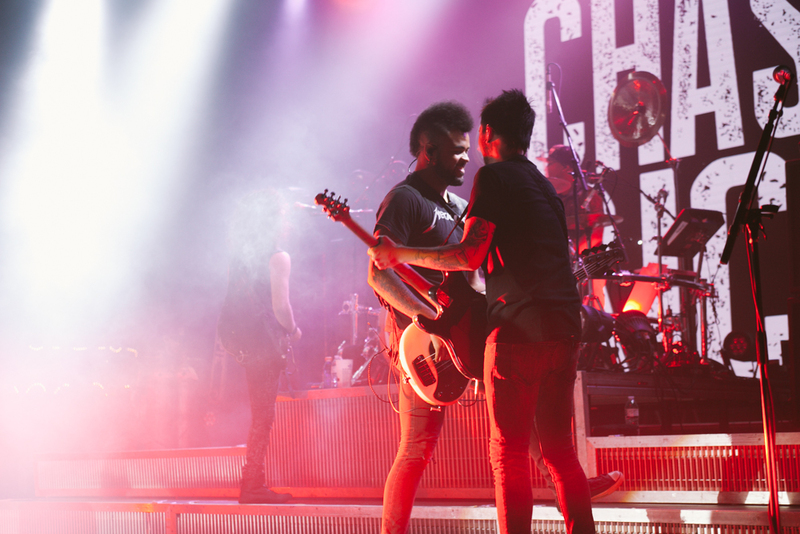 "PV Exchange was an ideal setting to connect with Tickets.com venues and partners, and to spread the word about our partnership. 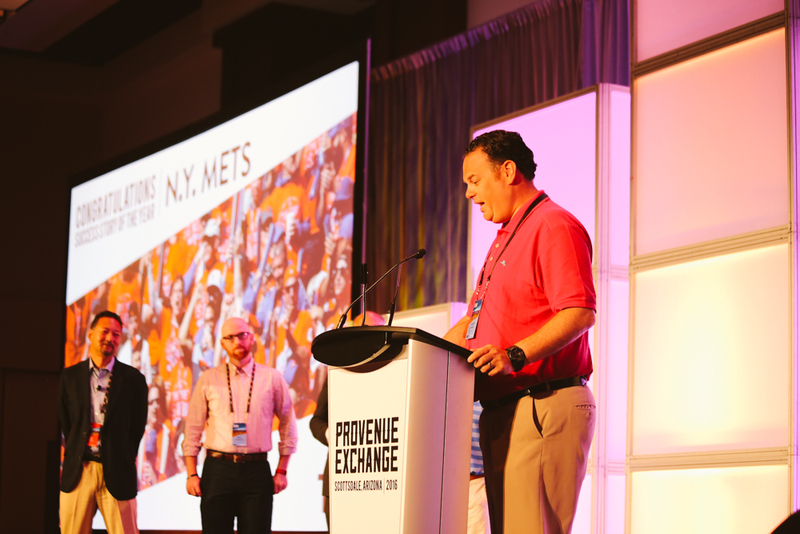 We're excited about what we're building together with Tickets.com and MLBAM, and PV Exchange was the perfect environment to set the stage." 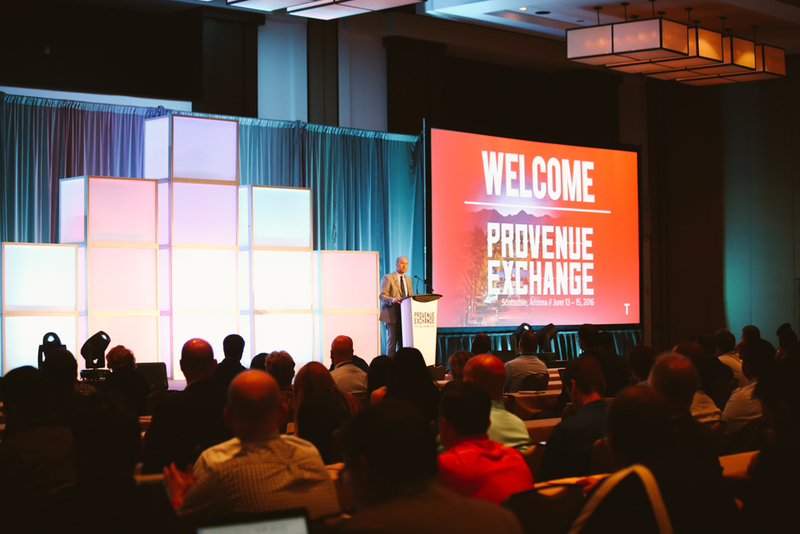 "PV Exchange is a must attend conference for our business. 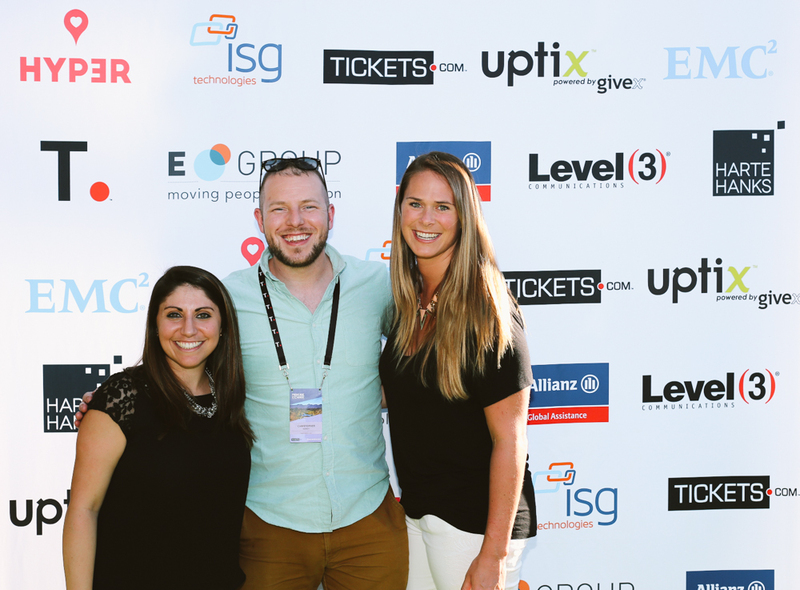 Tickets.com does a great job of balancing content and networking while providing us a stage to showcase our integrated software. 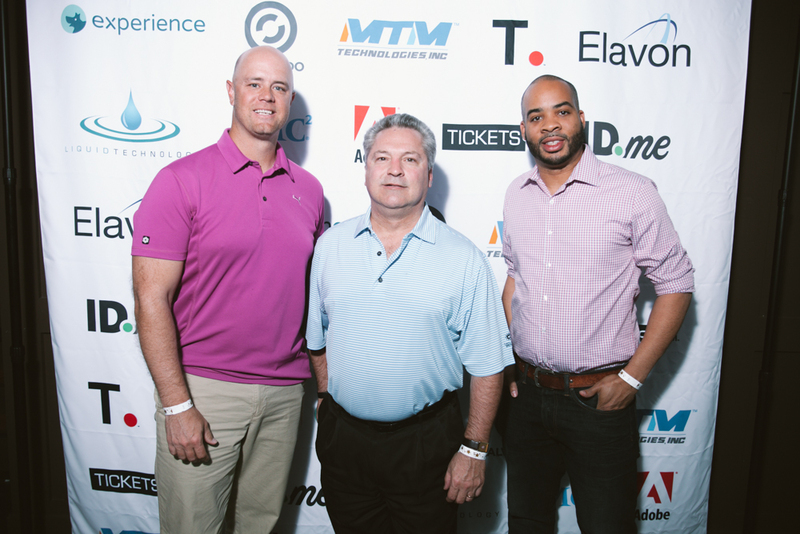 We're proud to be a partner of Tickets.com and will definitely be back next year!" 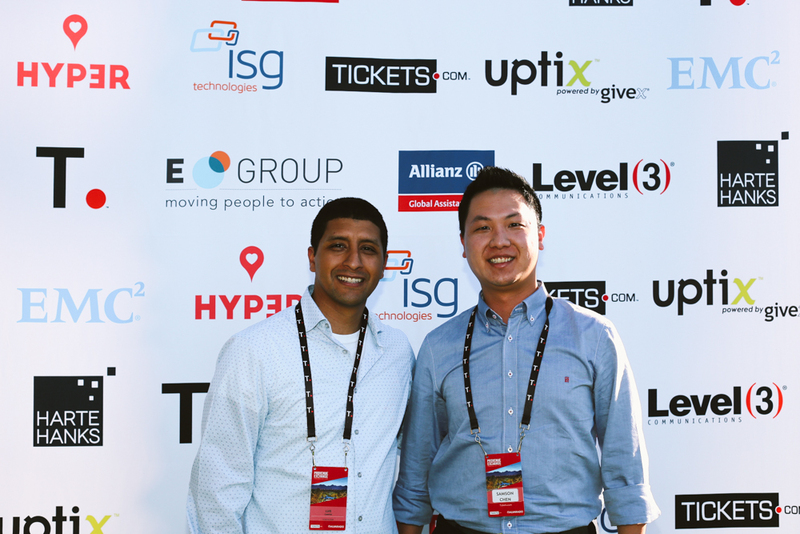 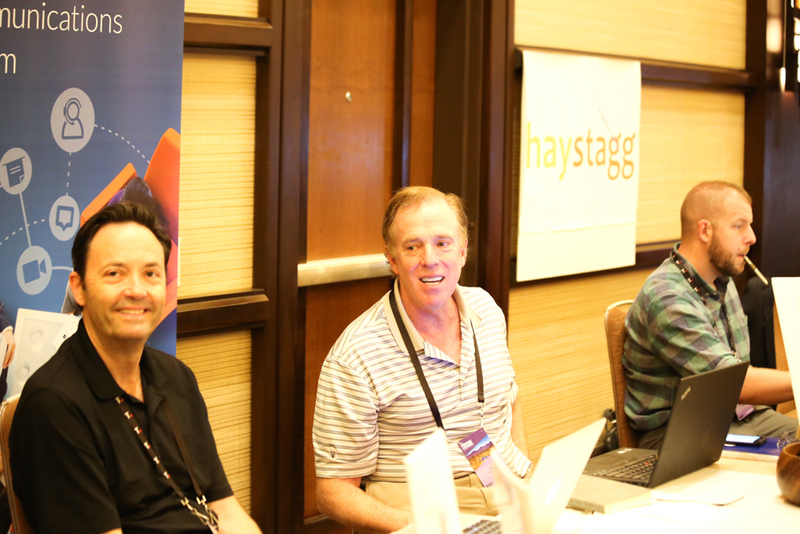 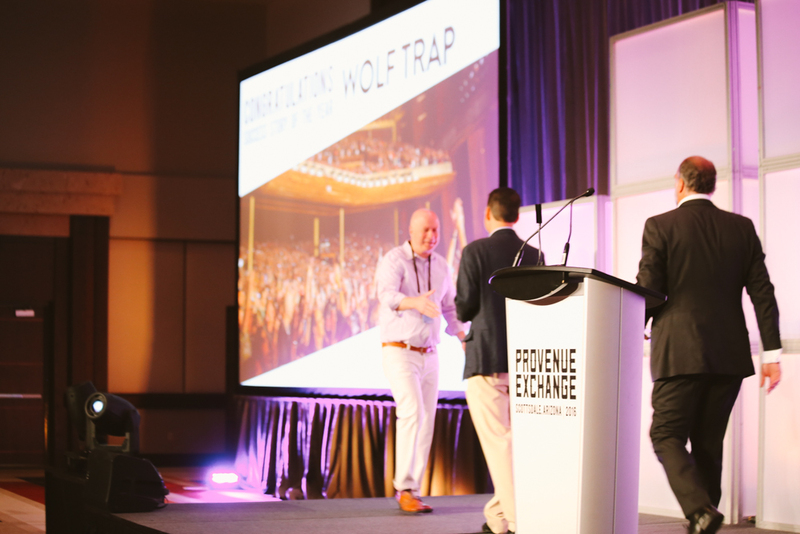 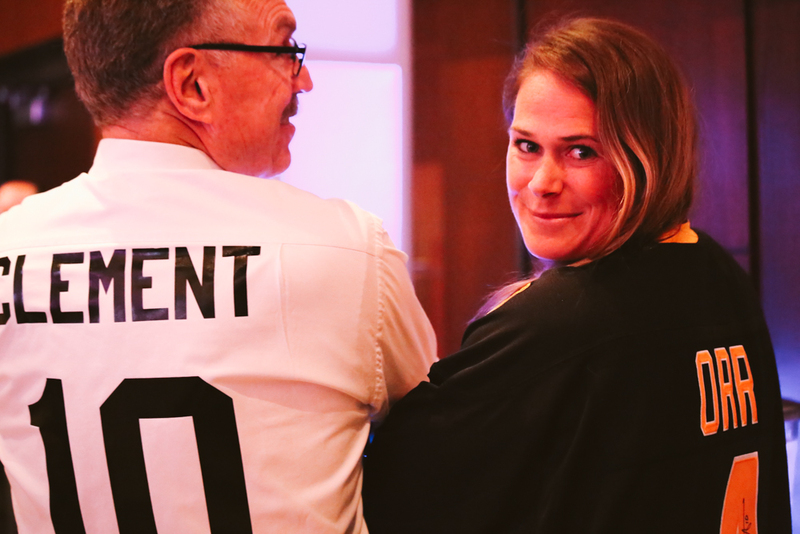 "Provenue Exchange has been an integral conference for the Medieval Times team to attend because it not only provides a chance to preview the Tickets.com initiatives but gives us the opportunity to network with peers both inside and outside of our industry. 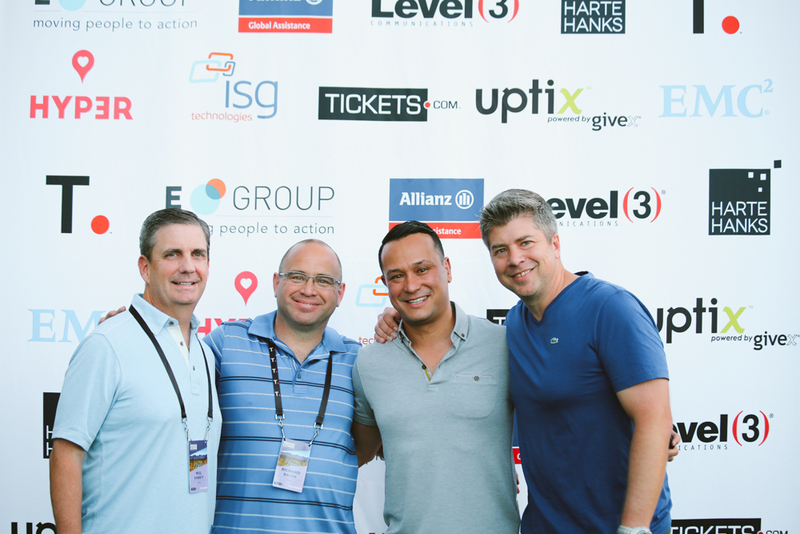 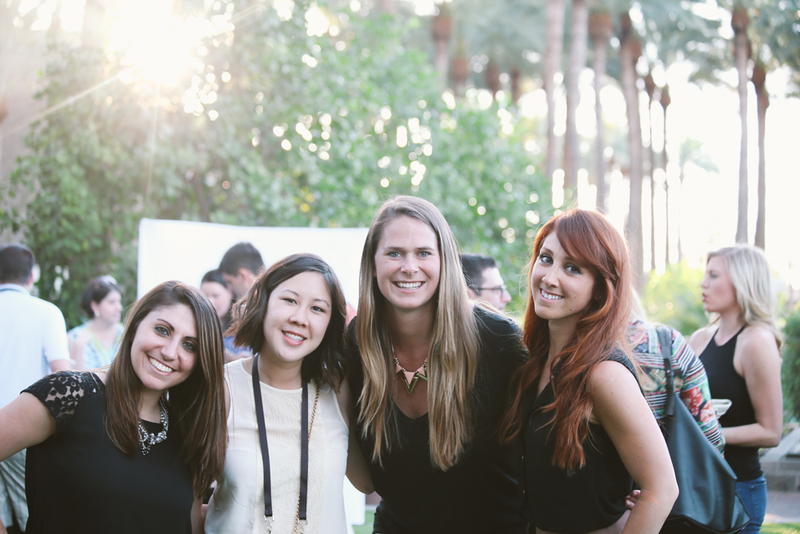 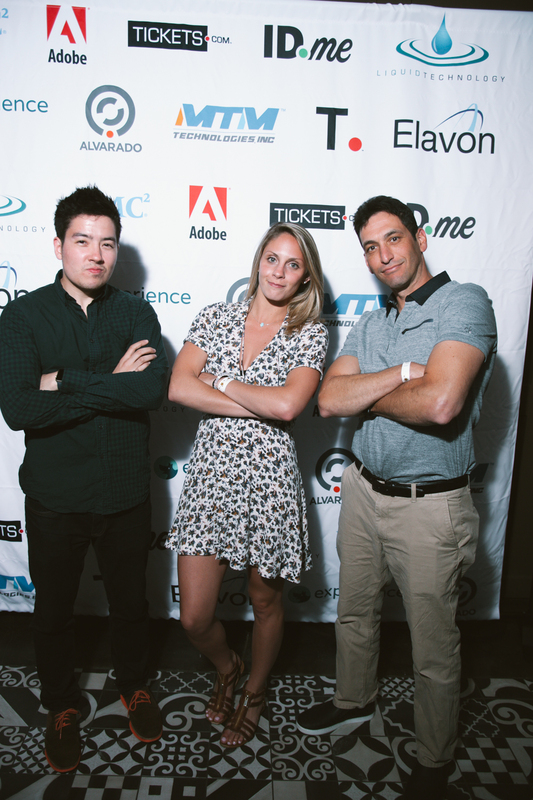 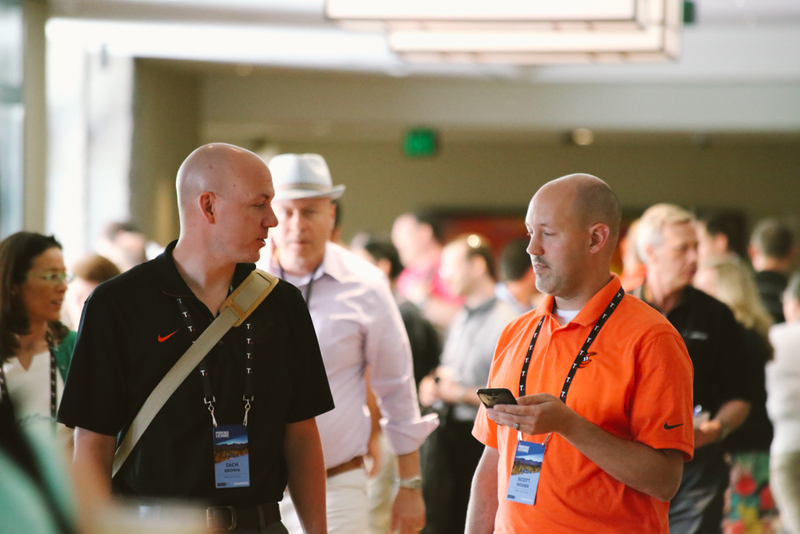 Because of the intimate nature of the conference it gives us quality interactions with the Tickets.com team. 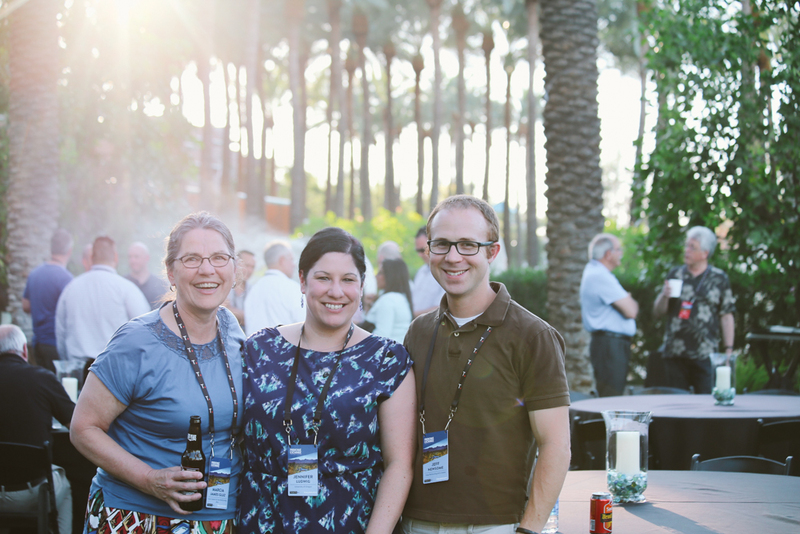 The conference is well-organized and most of all FUN!!! 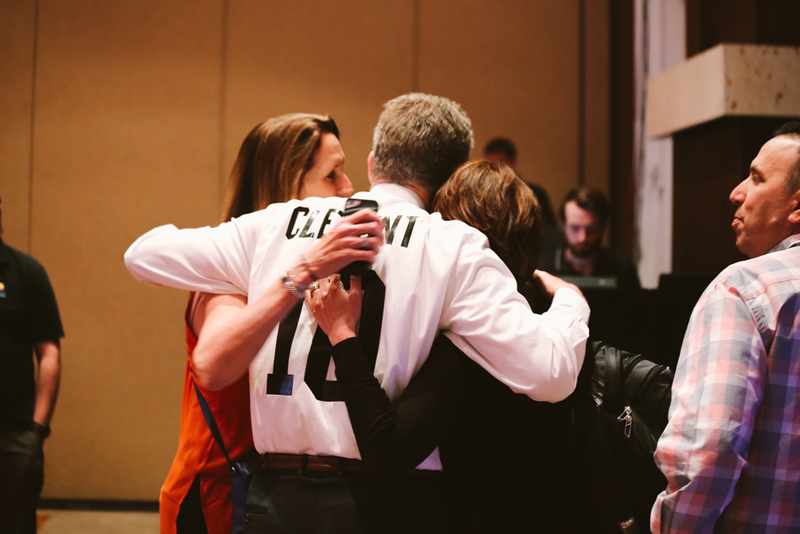 We look forward to next year!" 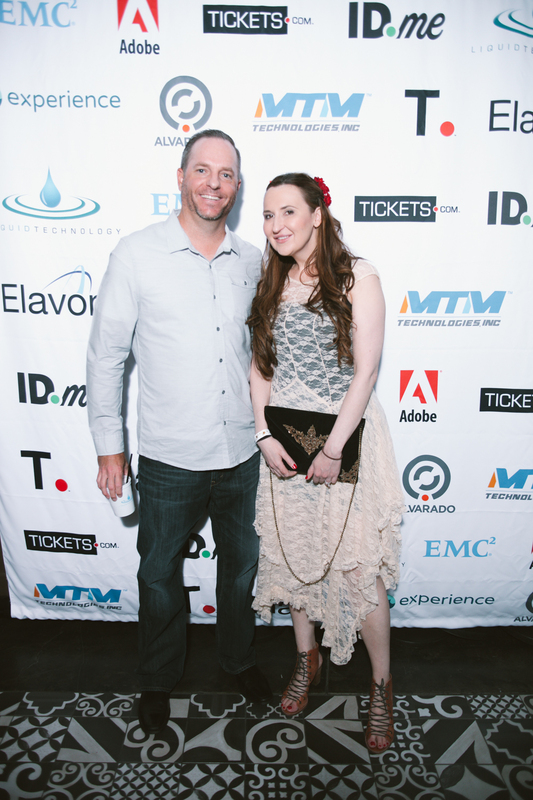 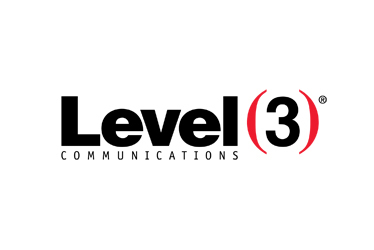 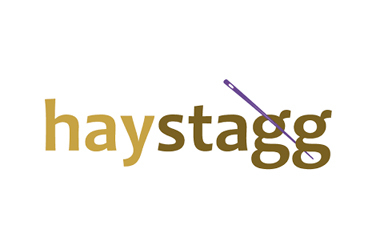 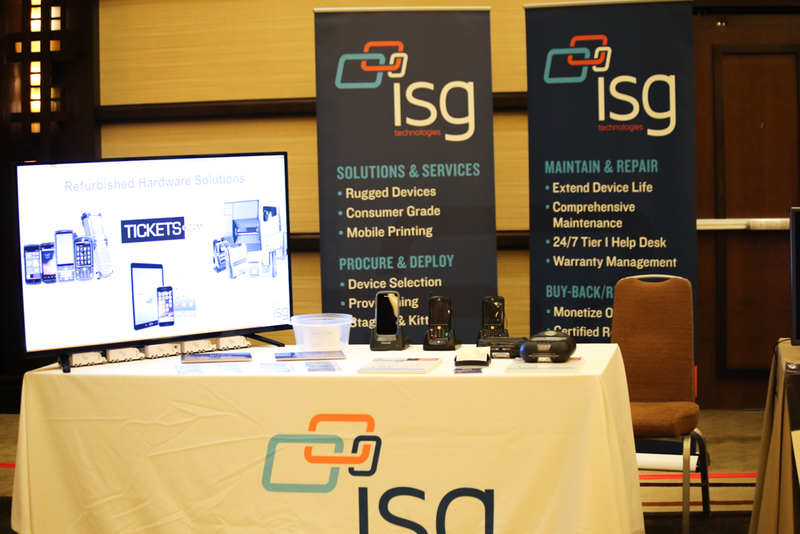 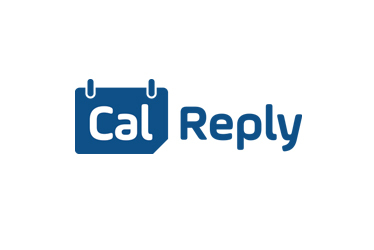 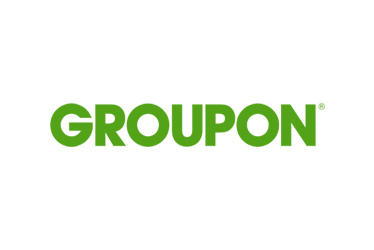 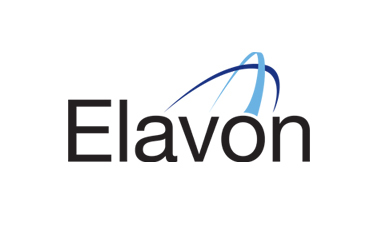 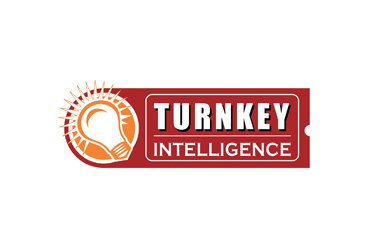 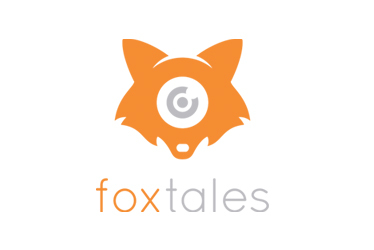 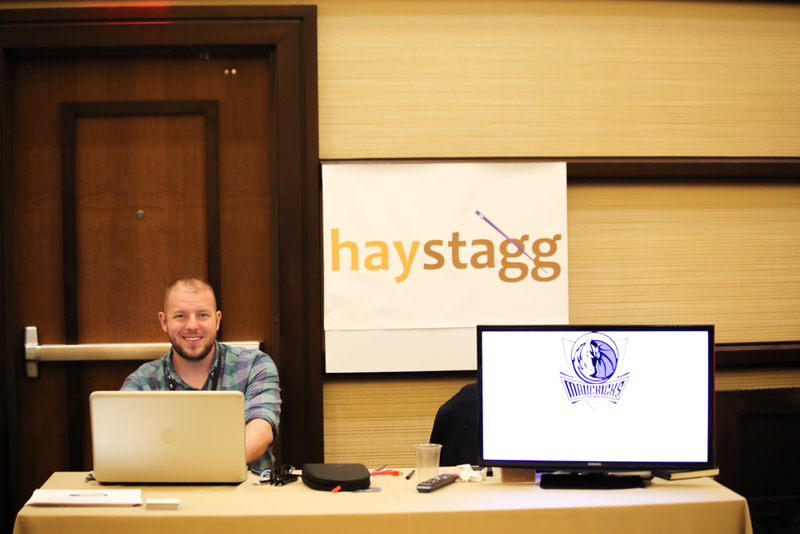 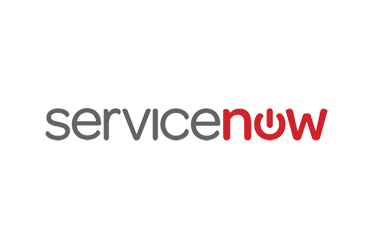 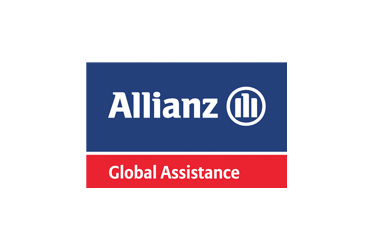 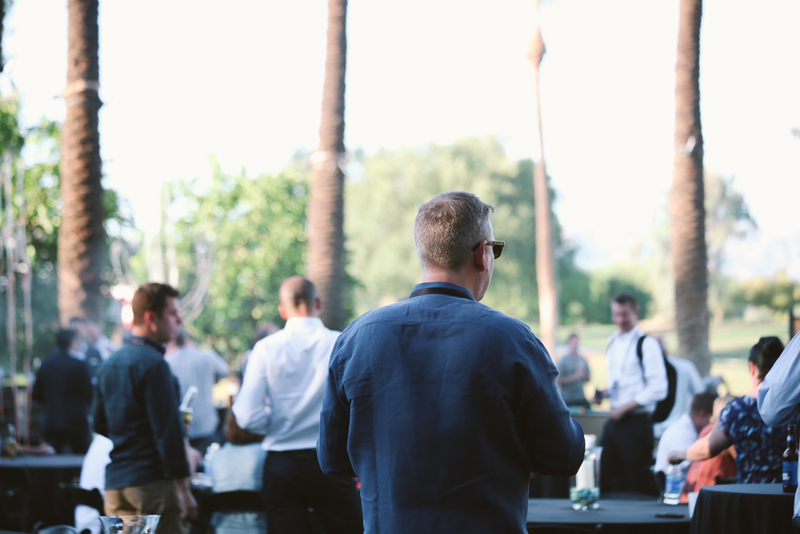 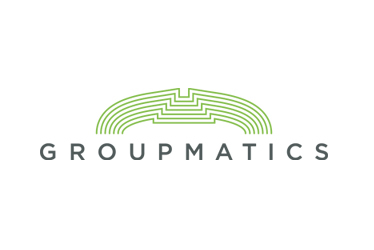 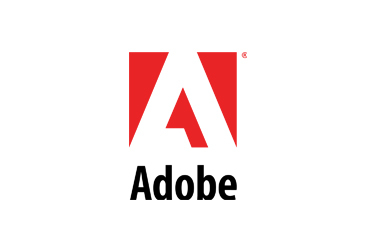 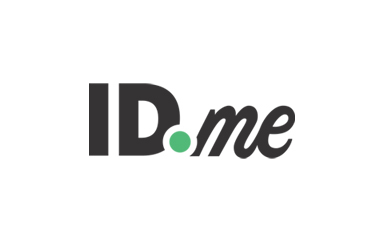 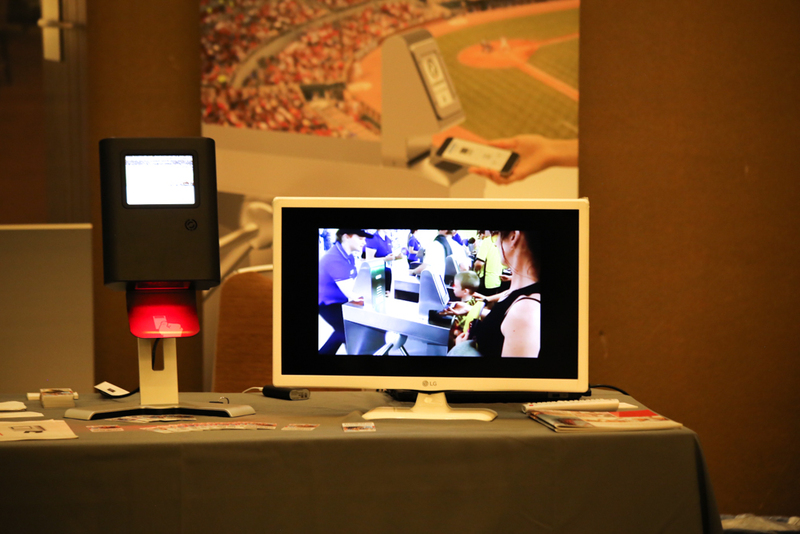 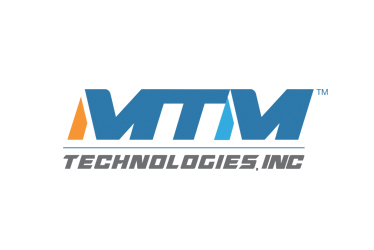 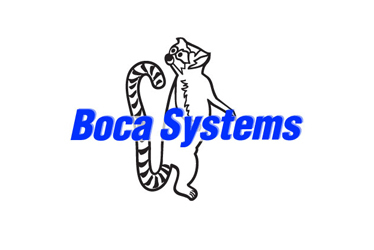 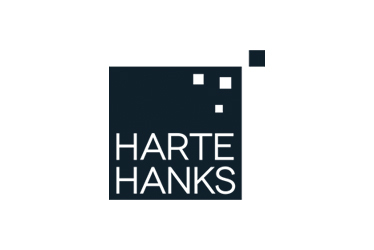 "Was great to connect with similar venues and share ticketing solutions. 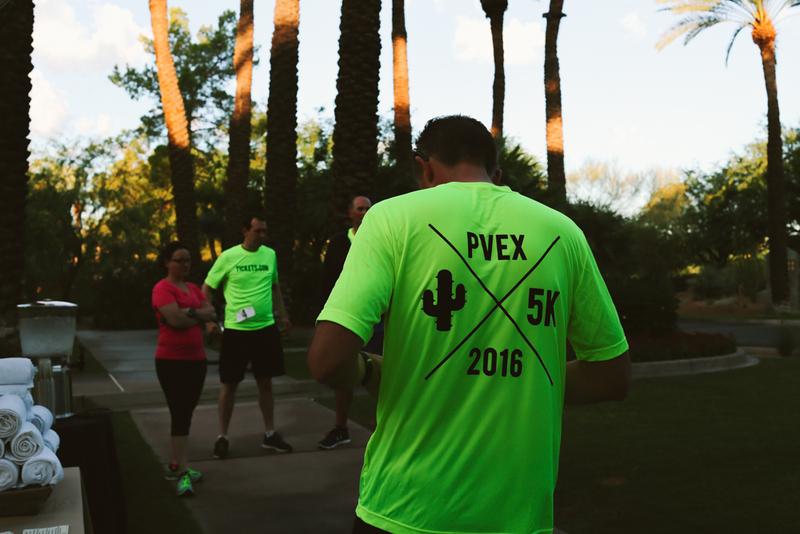 Excited to see PV grow to match our demands. 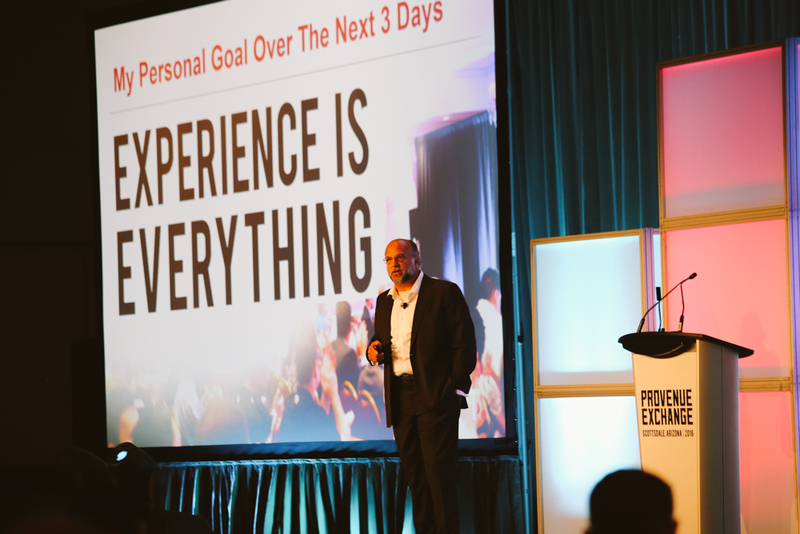 We’re small in size, but not in expectations." 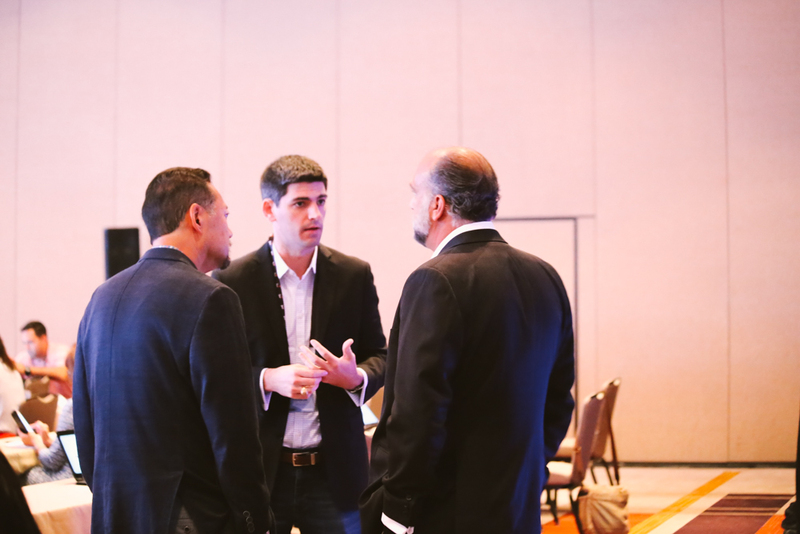 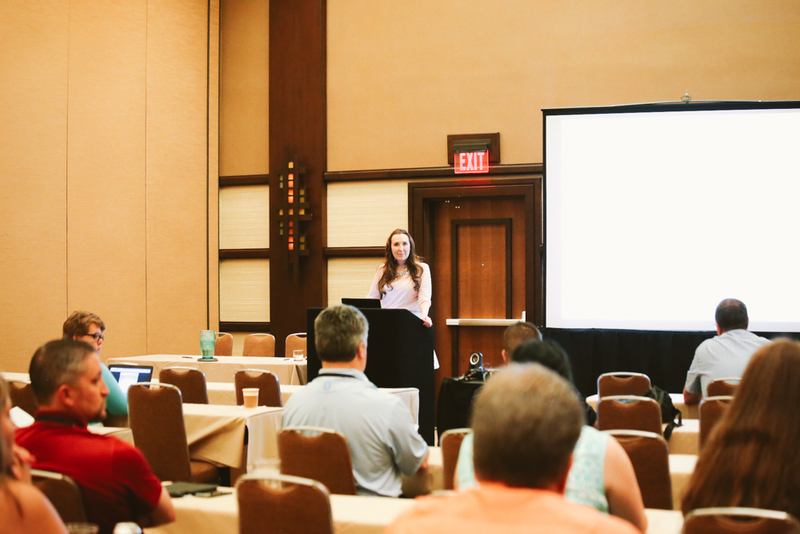 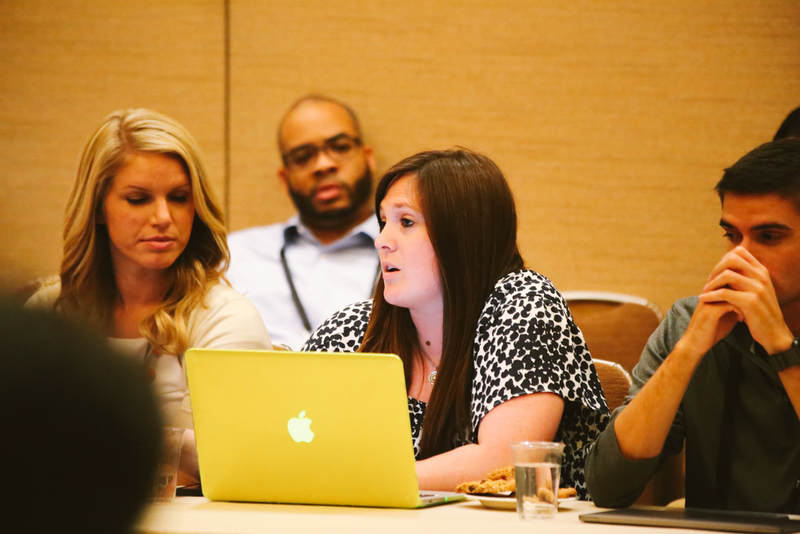 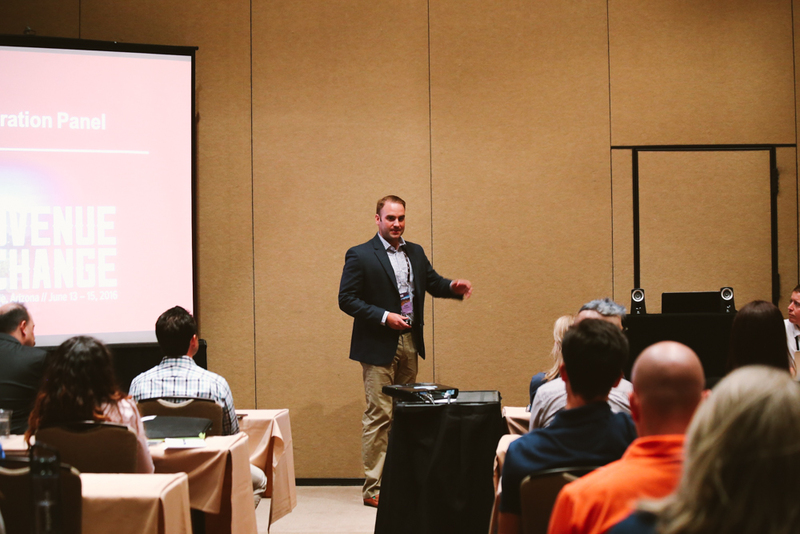 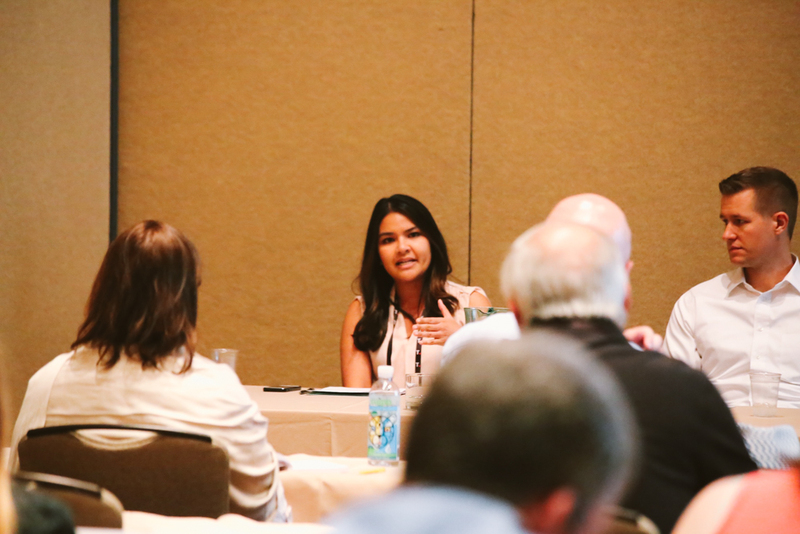 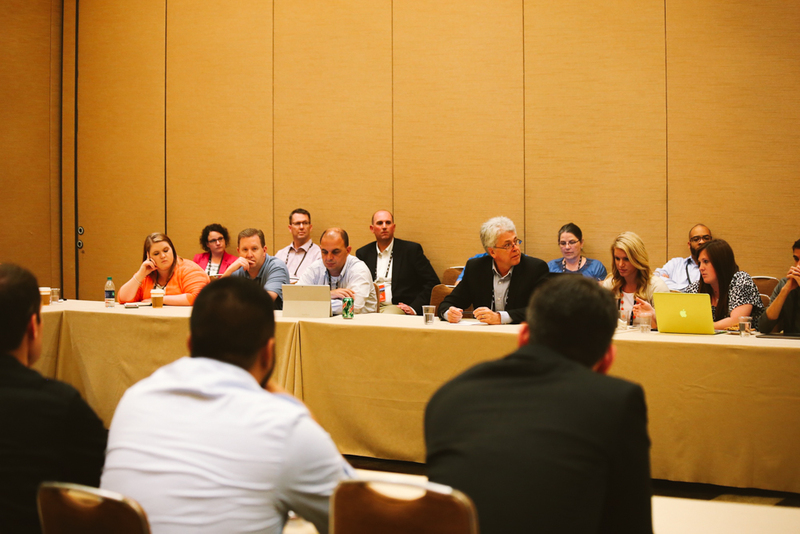 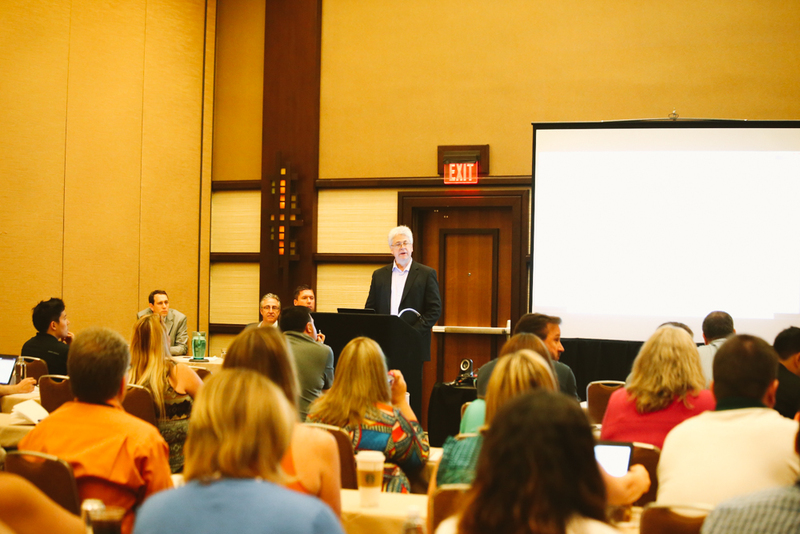 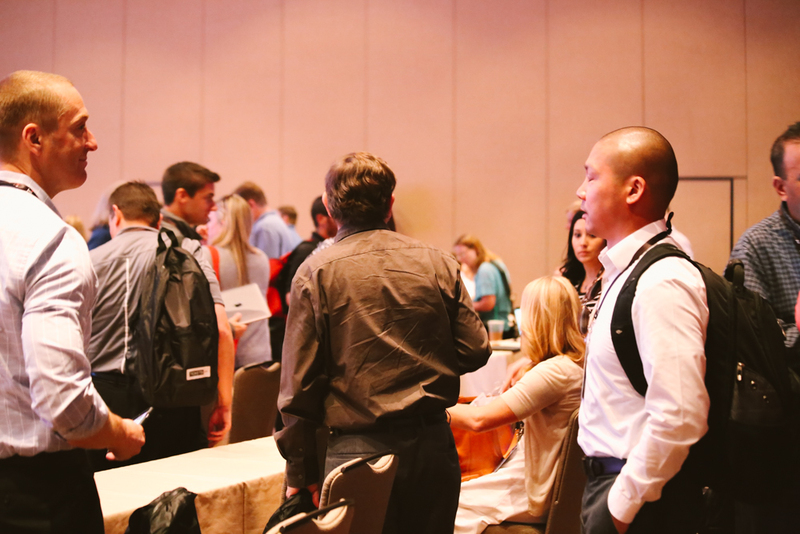 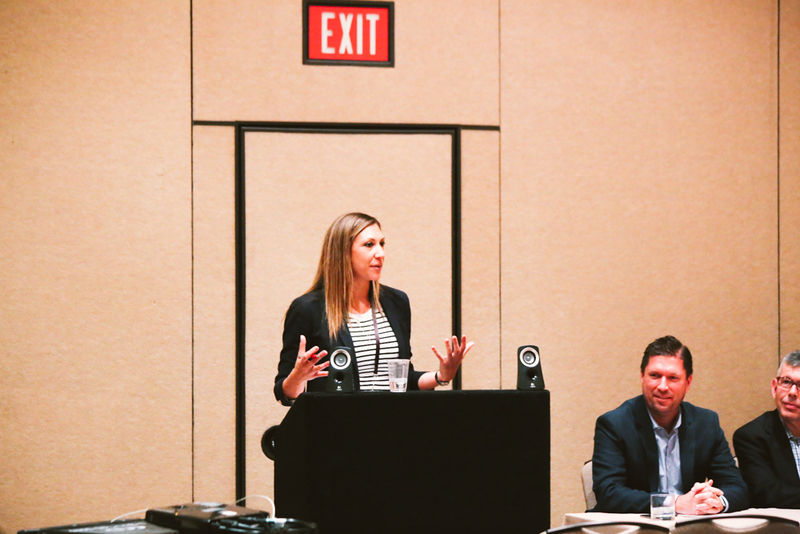 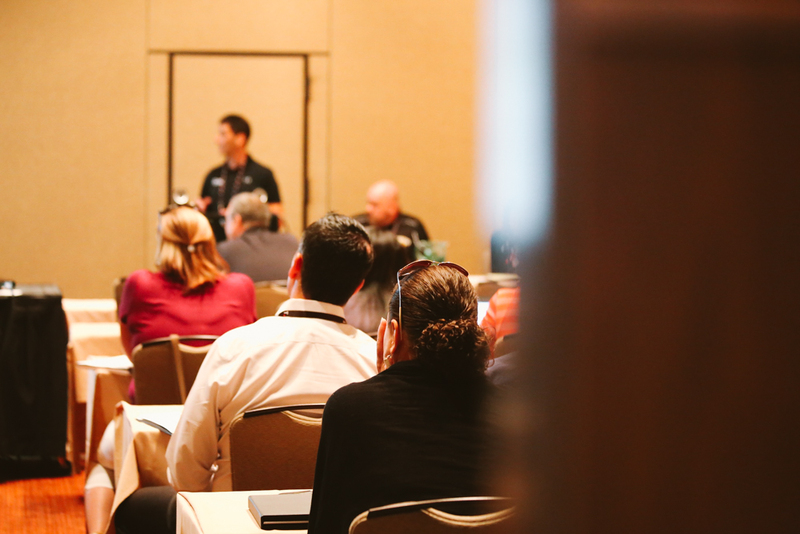 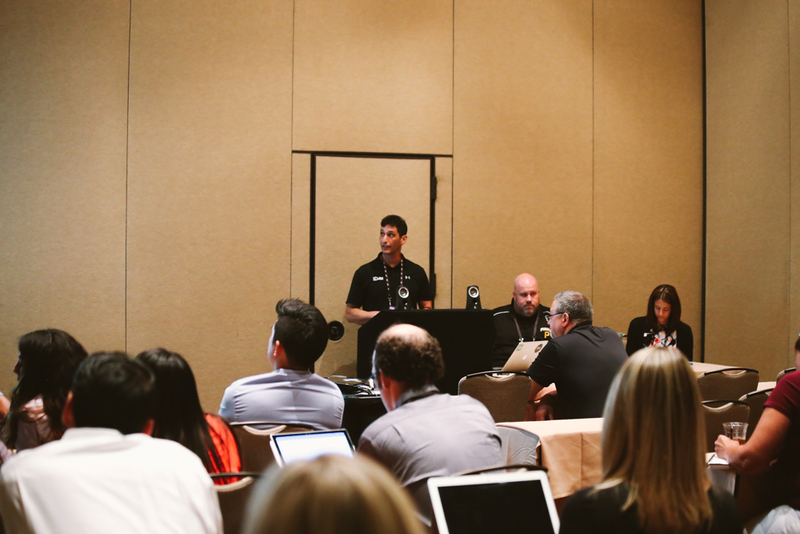 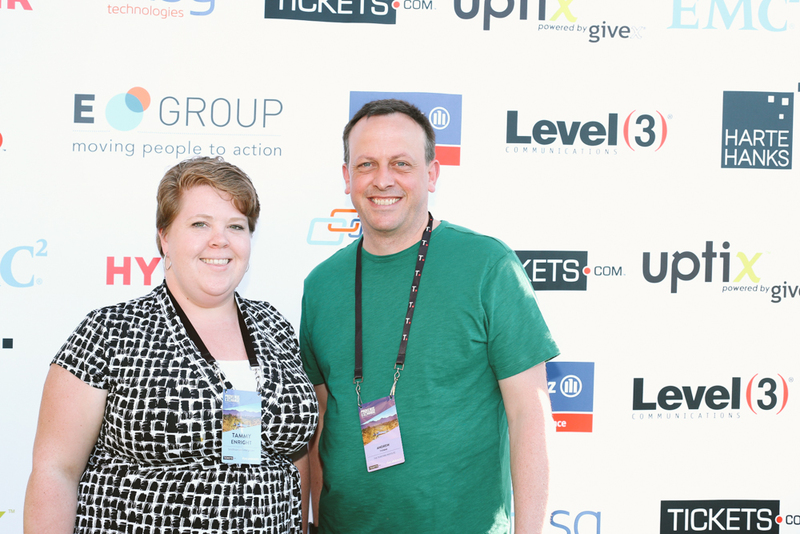 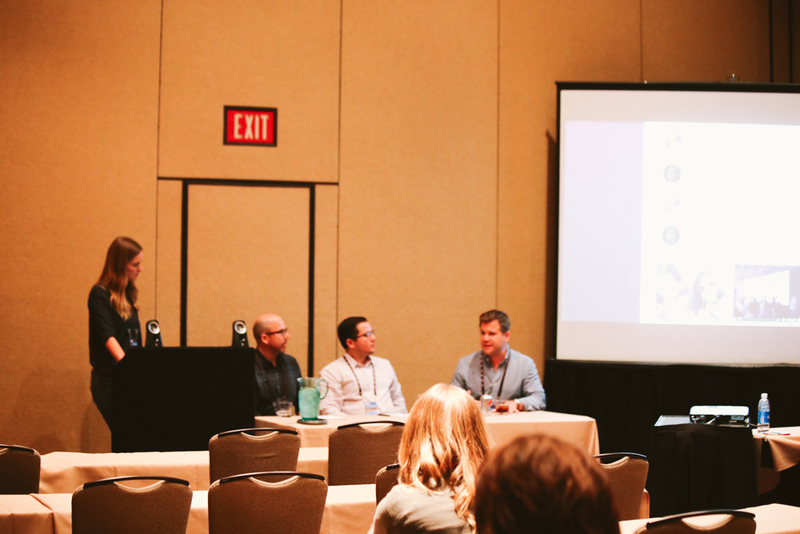 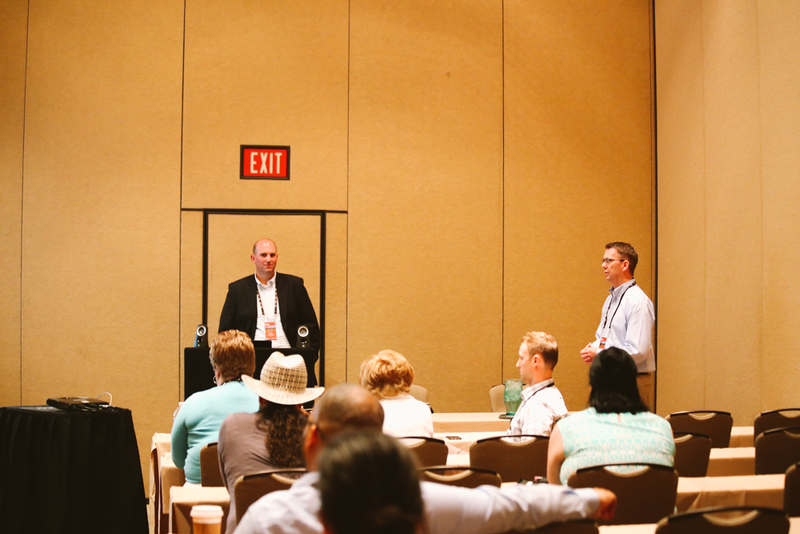 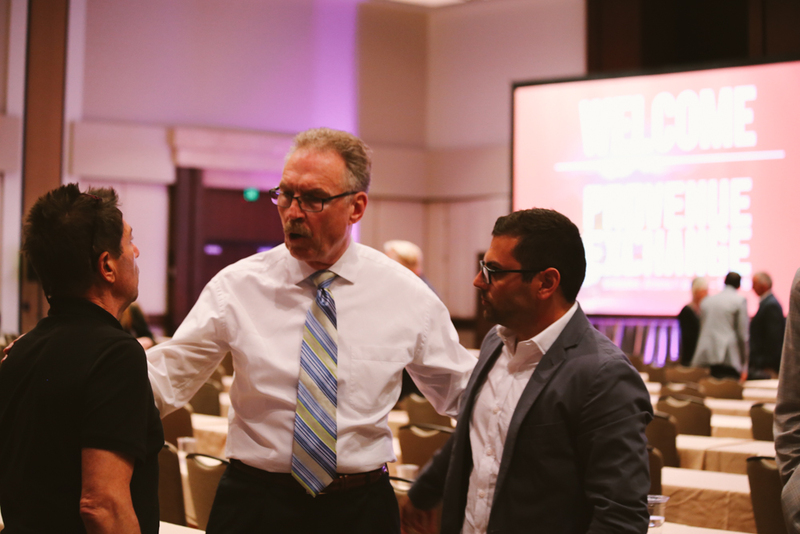 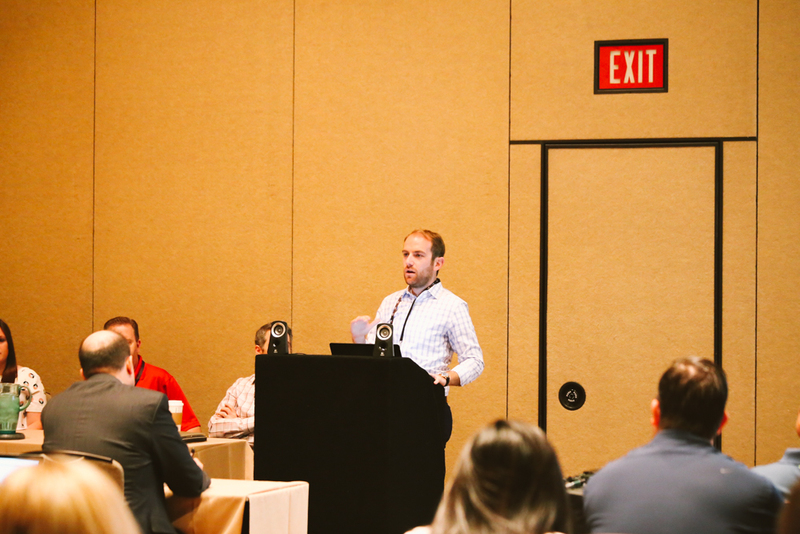 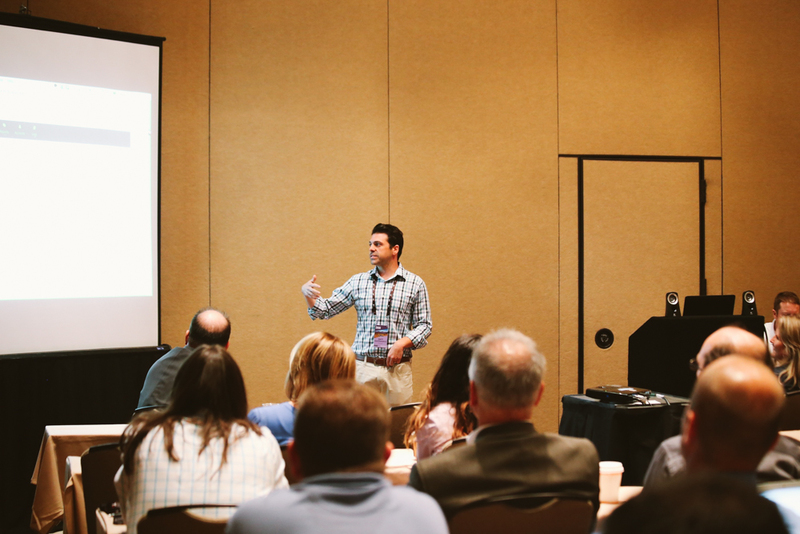 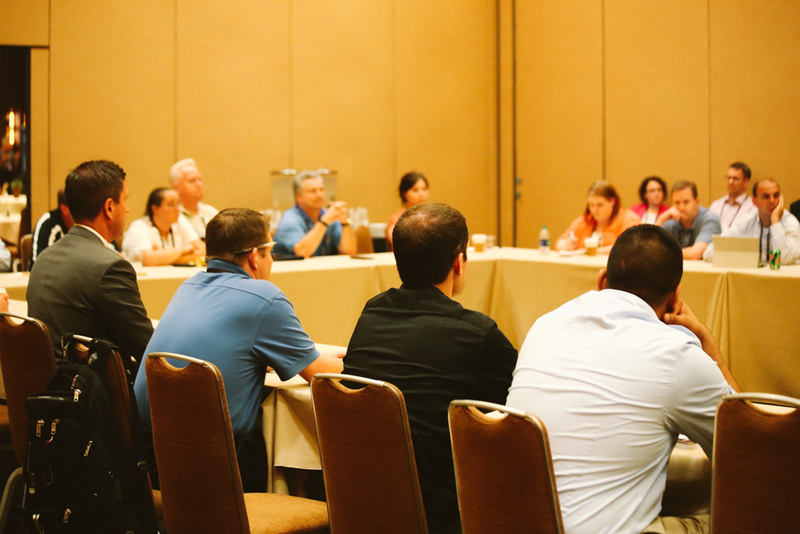 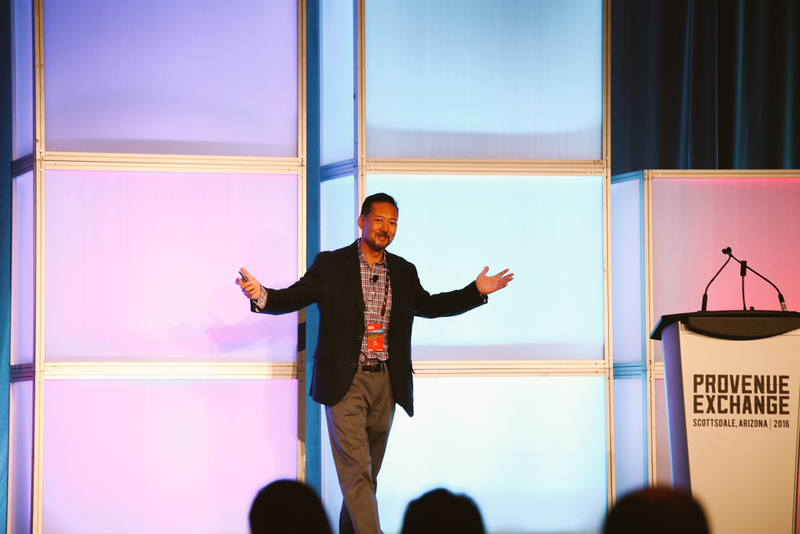 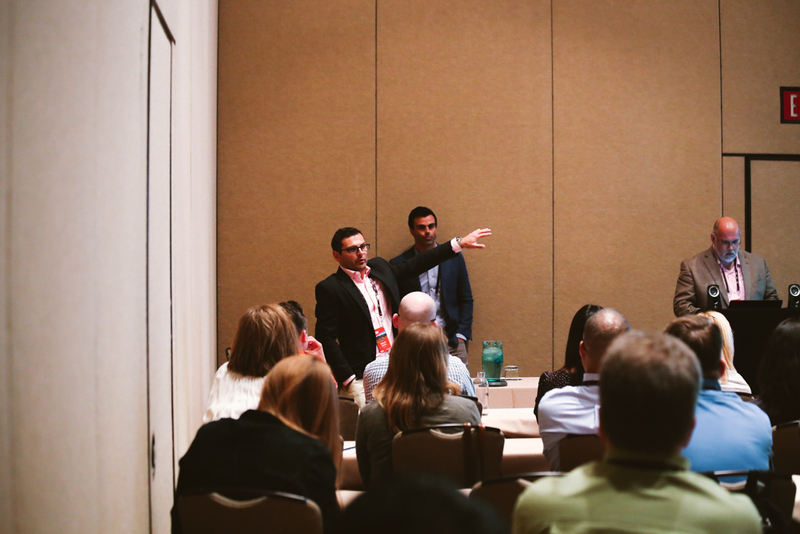 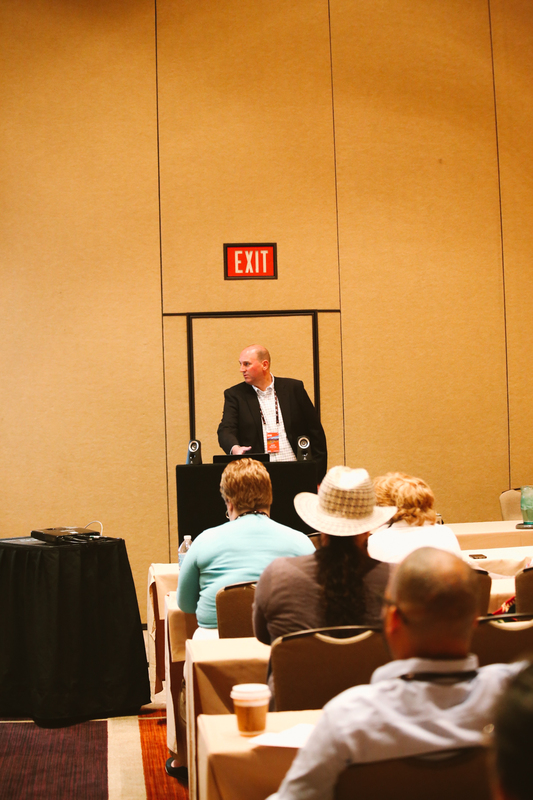 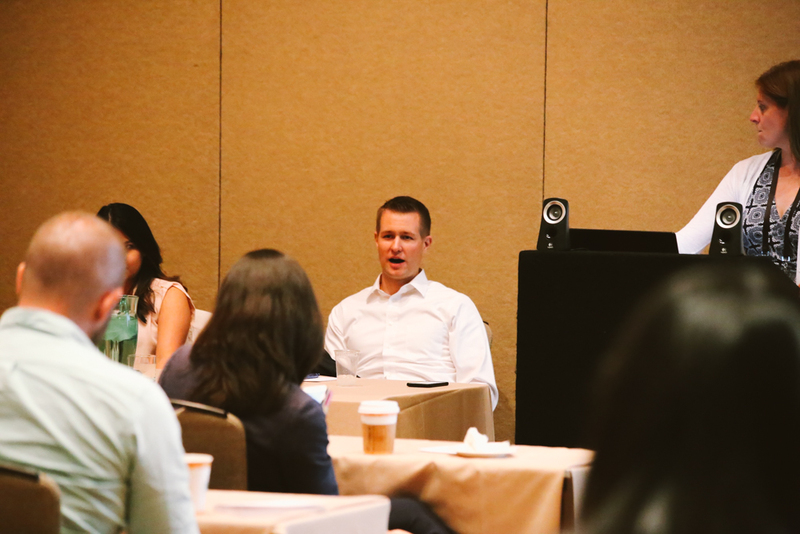 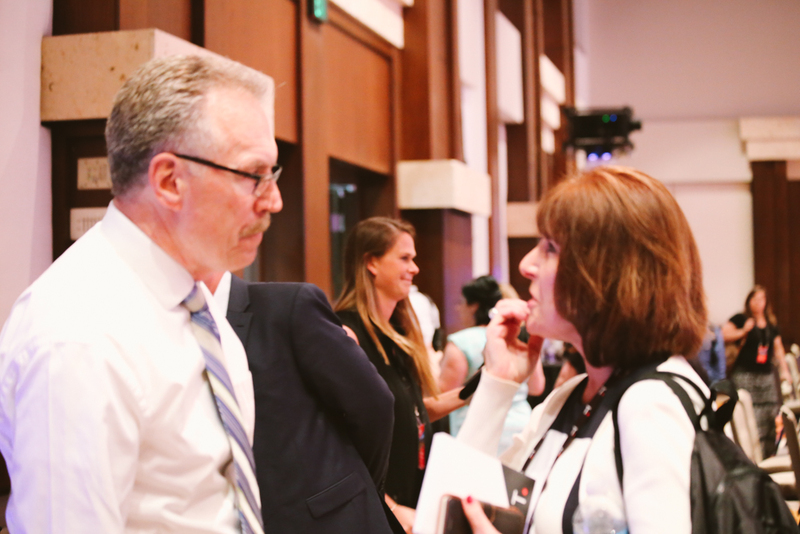 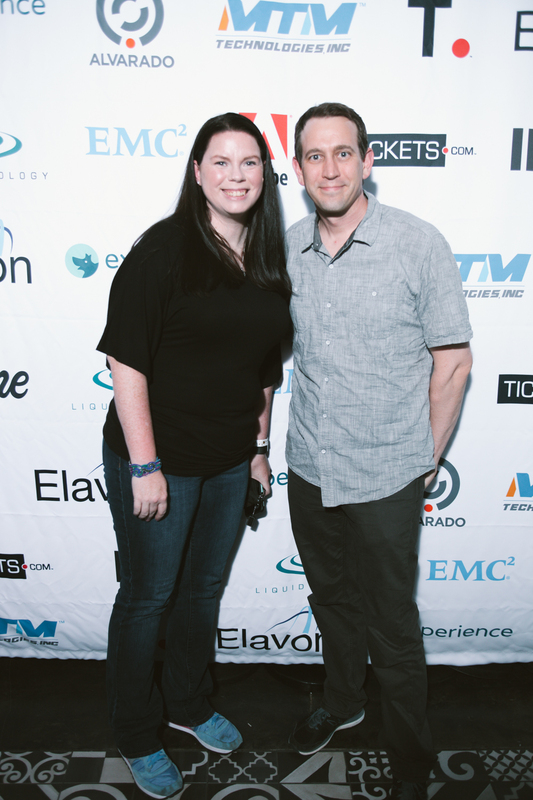 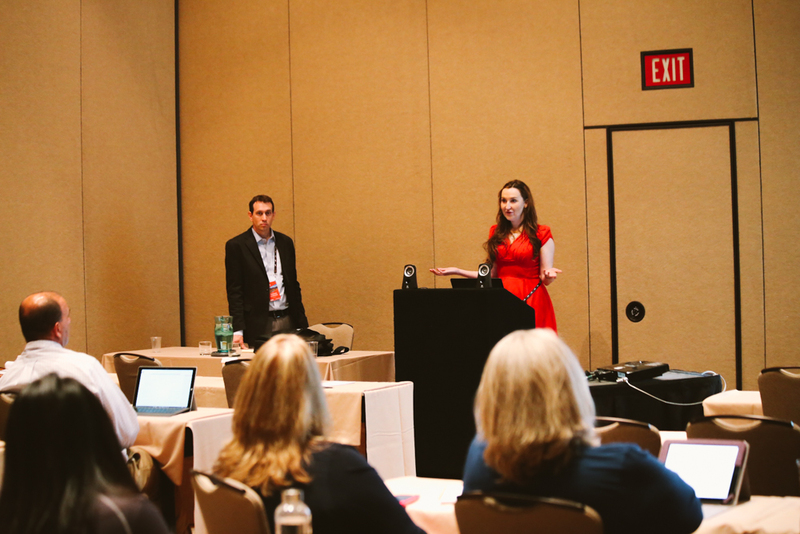 "The one-on-one marketing sessions at PVEX 2016 allowed me to get expert and organization-specific answers about new and existing marketing components." 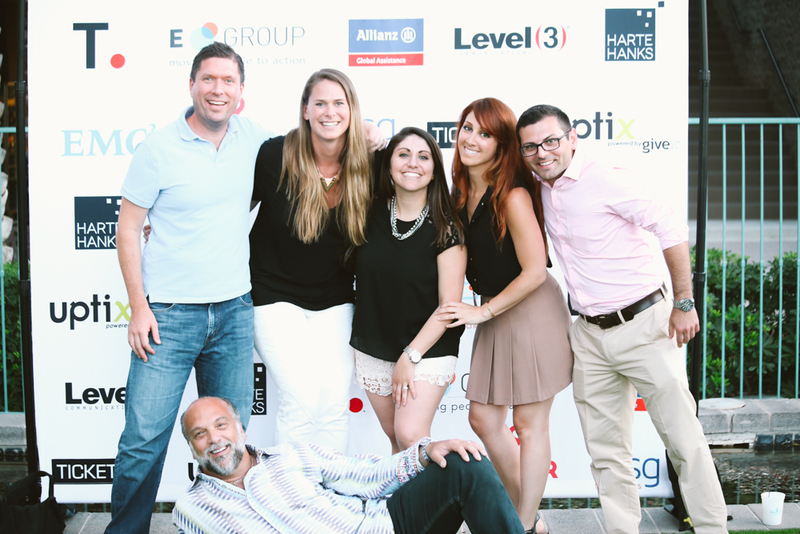 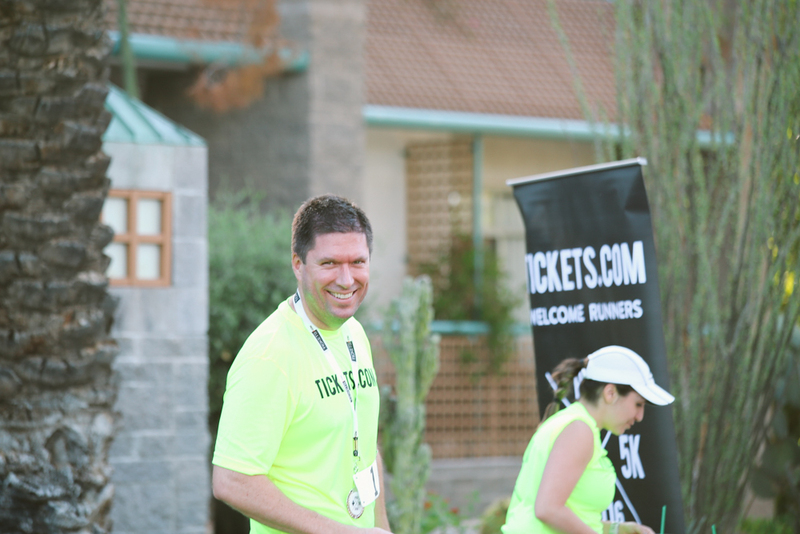 Core to our corporate culture at Tickets.com is the T.Cares program where we strive to make a difference not only in the ticketing industry, but also within the community. 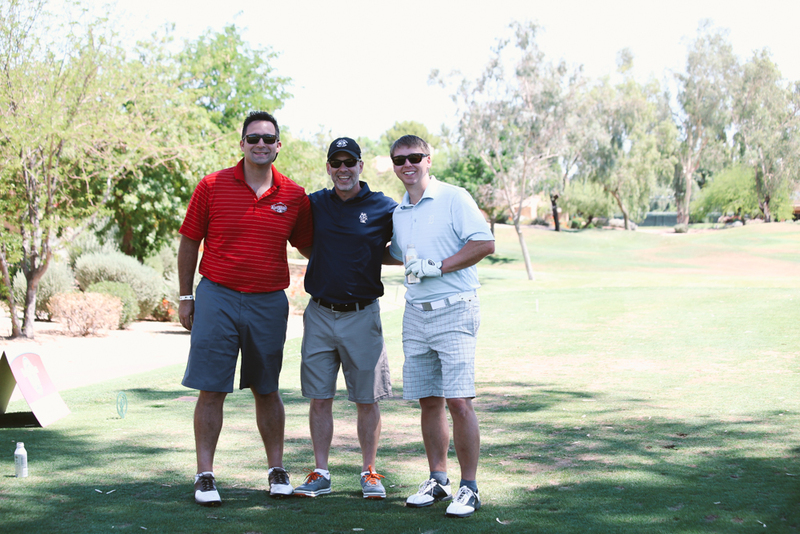 The T.Cares Program seeks to foster giving and building community by partnering with various nonprofits to provide remarkable experiences for individuals and their families who are supported by organizations such as IAVA, Shriners and others. 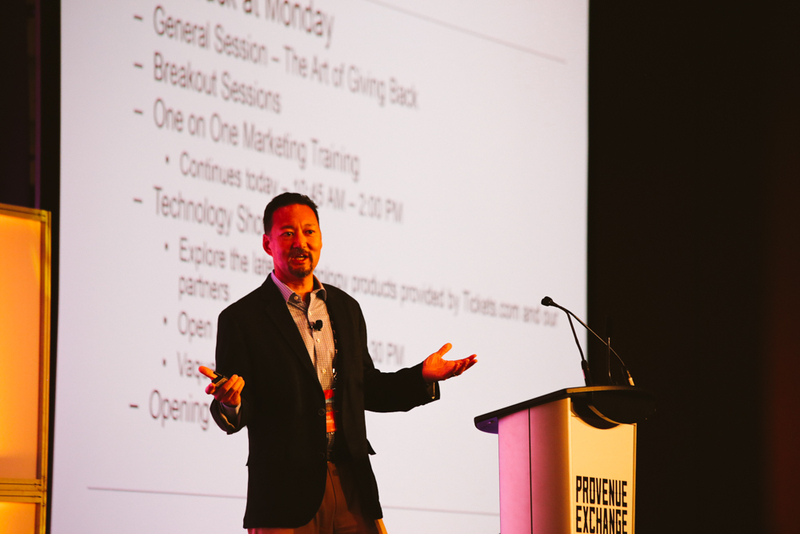 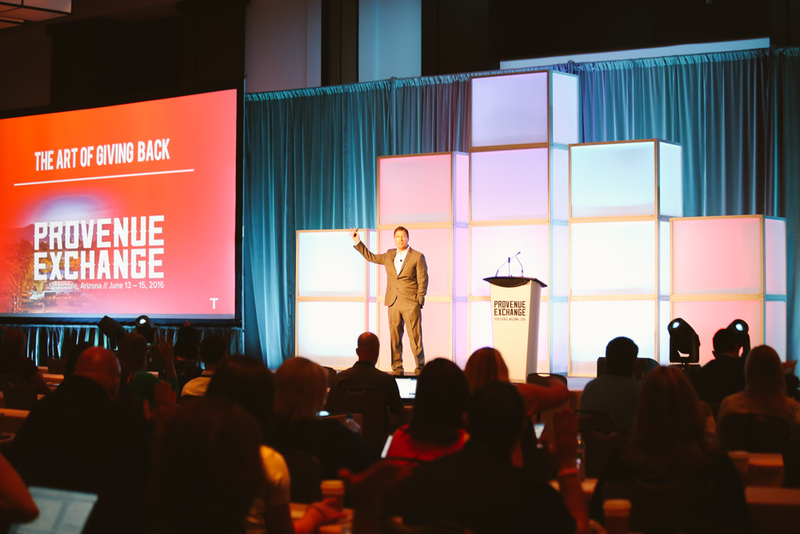 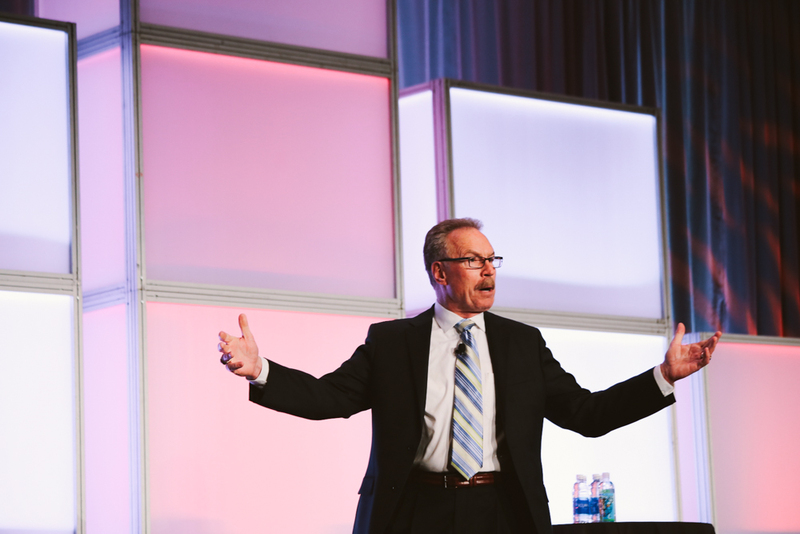 Michael Babcock, Senior Regional Director of Public Relations & Communications for Shriners Hospital, spoke at ProVenue Exchange about the organization’s incredible and inspiring work. 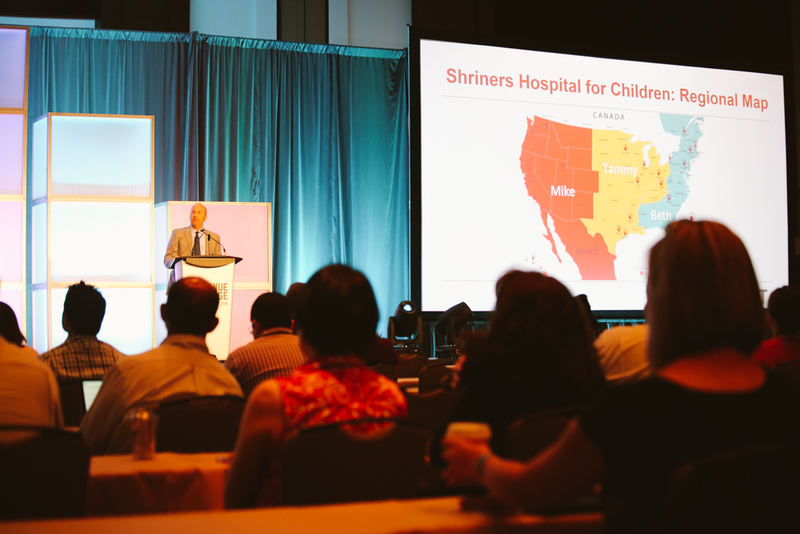 With 22 facilities throughout the US, Shriners specializes in the treatment of orthopedics, spinal cord injury, burns, and more providing the highest quality care to children. 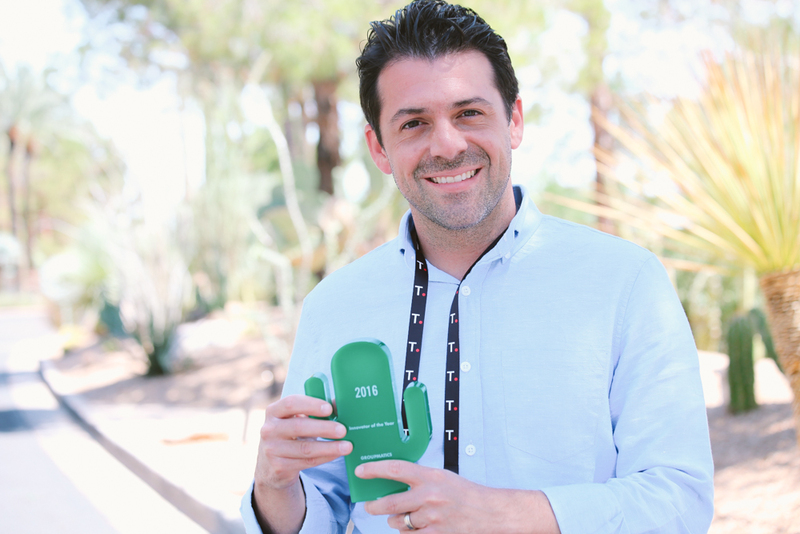 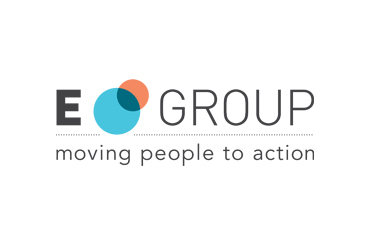 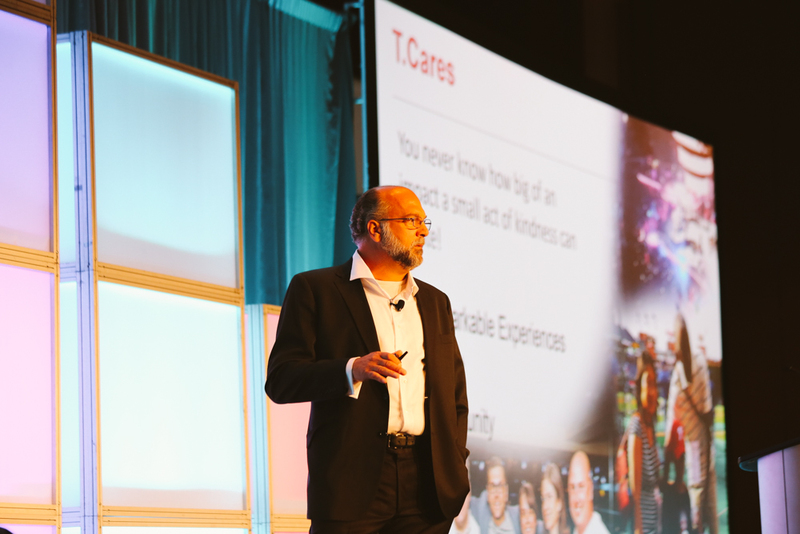 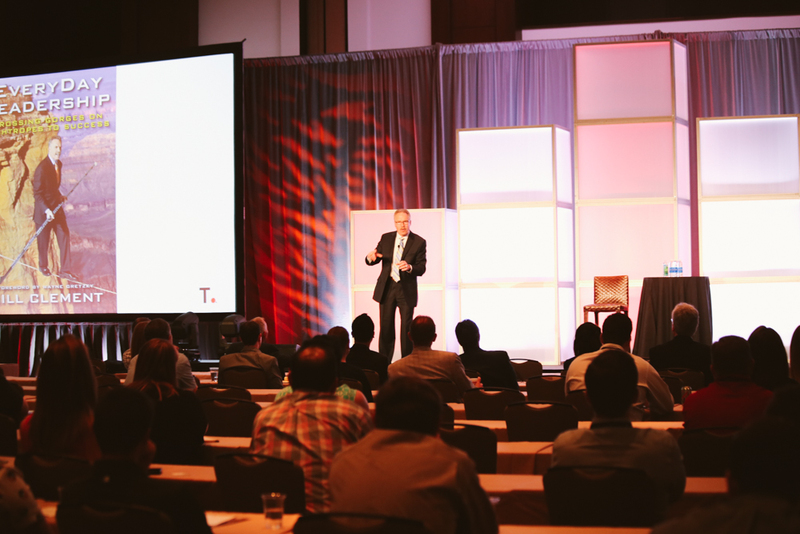 During the morning kick-off of ProVenue Exchange, Derek Argobright, CTO, highlighted the Tickets.com’s “T.Cares” initiative, which shapes technology while providing value to clients and partners. 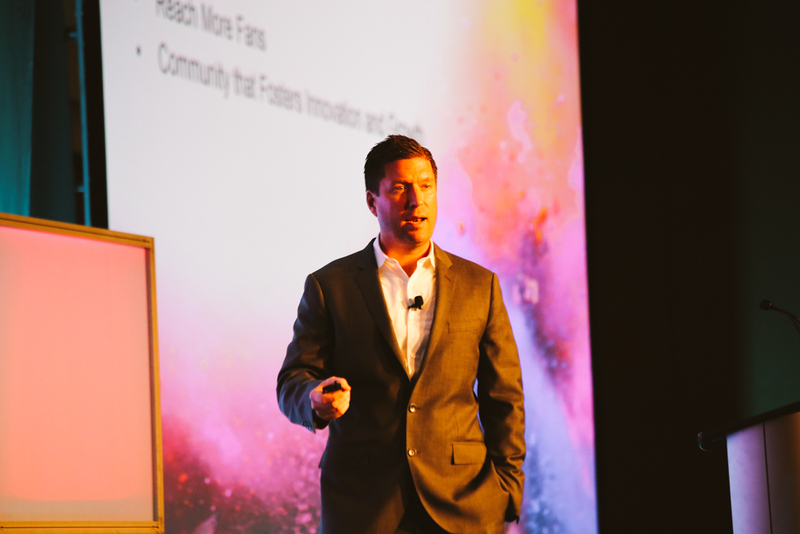 Highlighting execution against last year’s roadmap and the stability of the platform, Derek noted that “…what we decide to do here over the next 2.5 days matter. 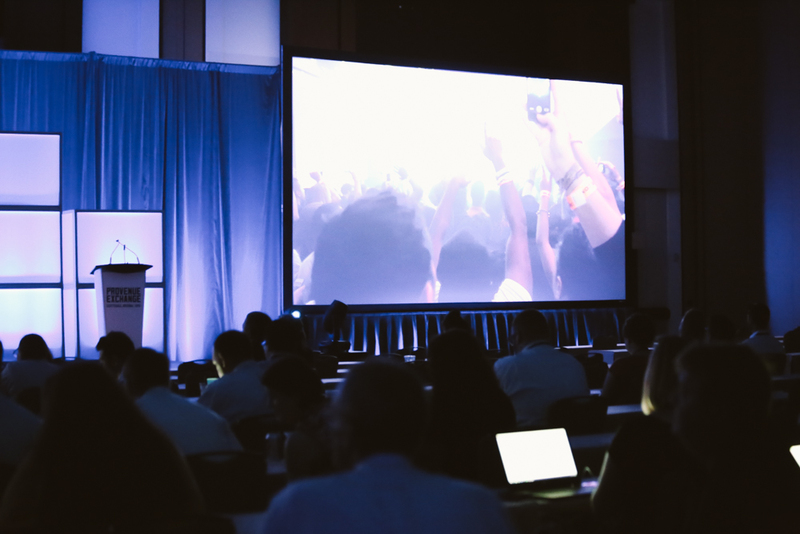 We can set the goals that we want to achieve.” He encouraged an open dialogue with Tickets.com staff and attendees to raise concerns and discuss challenges in order to solve them. 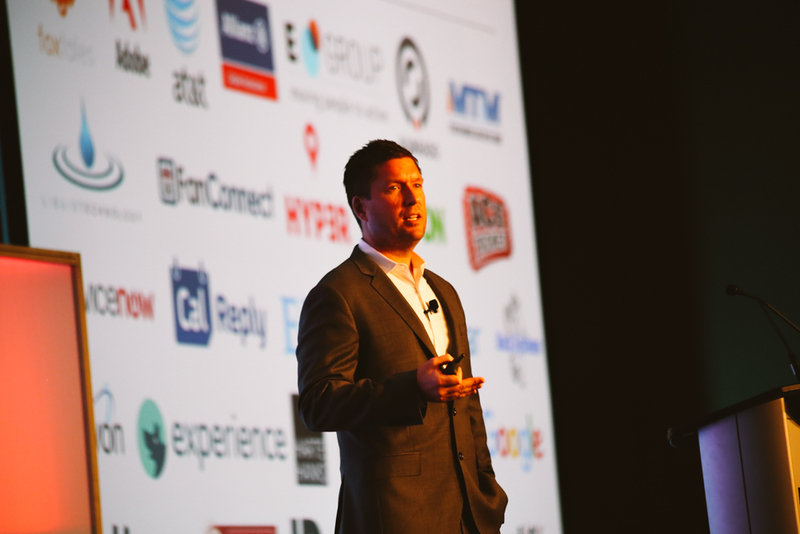 He also focused on a challenge facing the ticketing industry today: good design, self-service, and ease of use for the box office and their patrons. 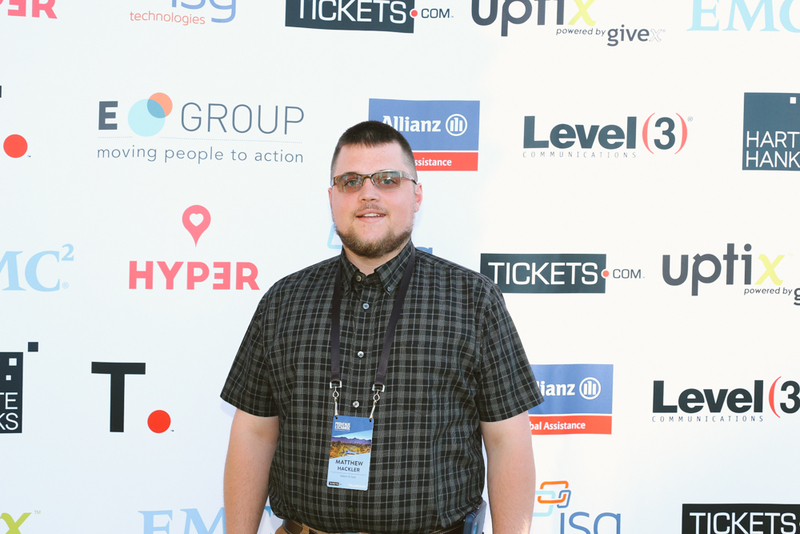 Derek noted how Tickets.com efforts in these areas will directly impact an organization’s ability to solve business challenges, service their patrons, and make a positive impact in the community to create amazing experiences and memories as well as generate value. 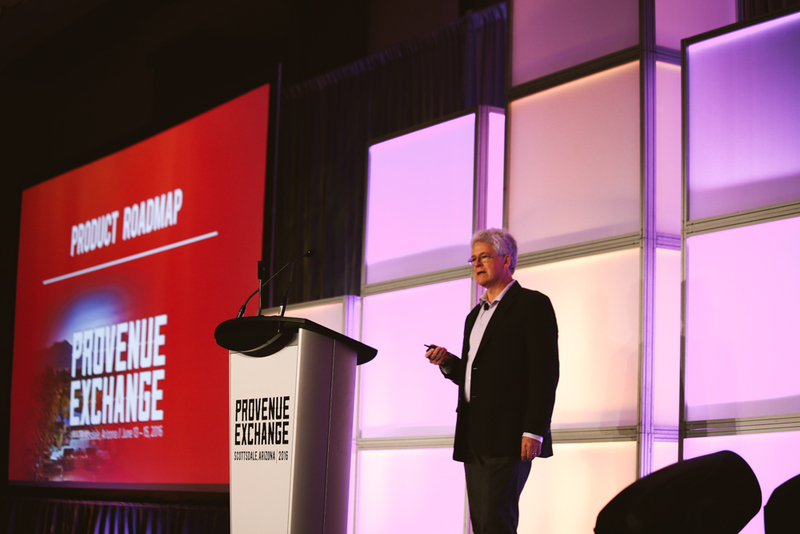 Bob McClintock, VP of Product Management, walked attendees through the ProVenue product roadmap, highlighting new and exciting features for the ticketing platform, and important over-arching themes, such as mobile-first development and continued progress on self-service setup for consumer-facing products. 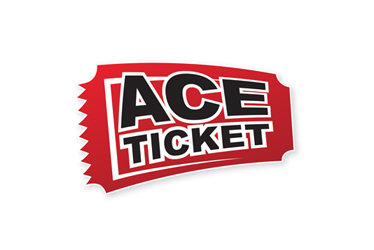 Reinforcing Joe and Derek’s themes from the day before, Bob provided the specifics on how Tickets.com would execute to provide value, impact, and experiences for each organization, their communities, and patrons. 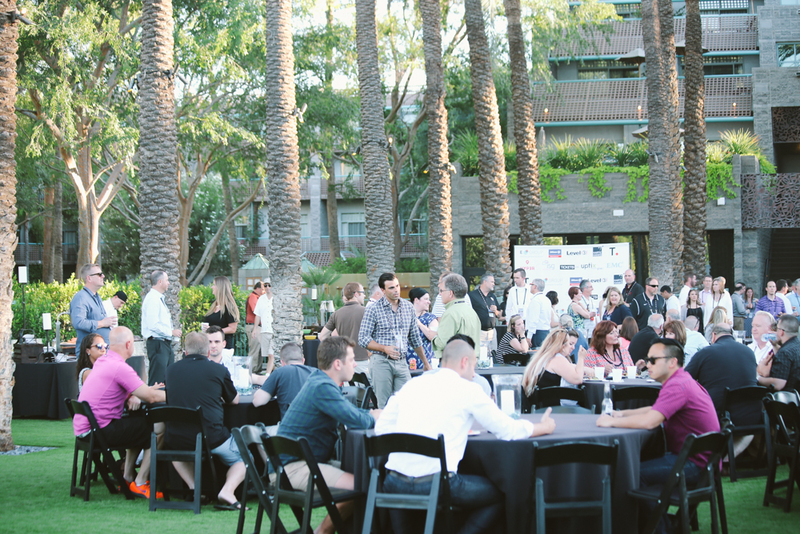 Tickets.com kicked off the first evening of the conference with a night of food, games, networking and fun at the gorgeous Palm Grove at the Hyatt Regency Scottsdale. 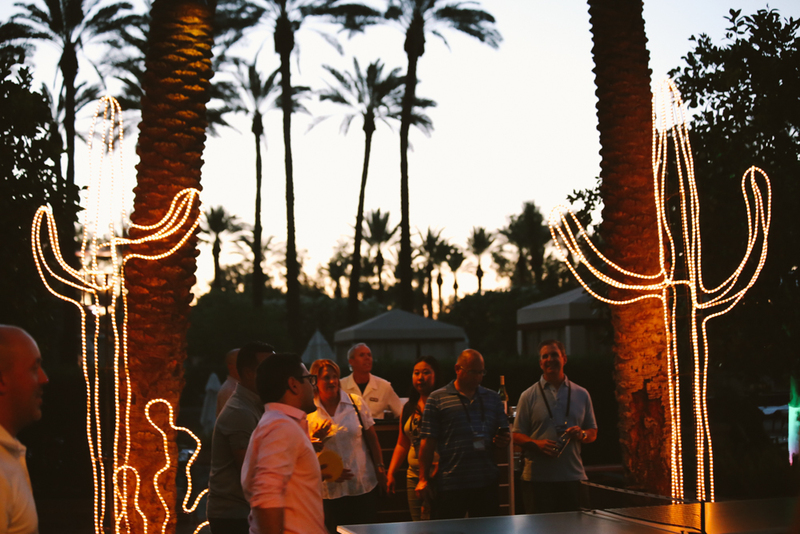 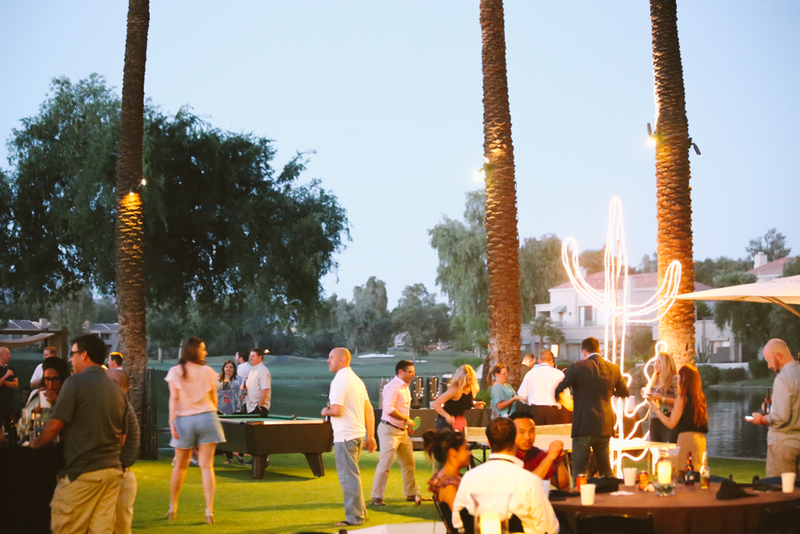 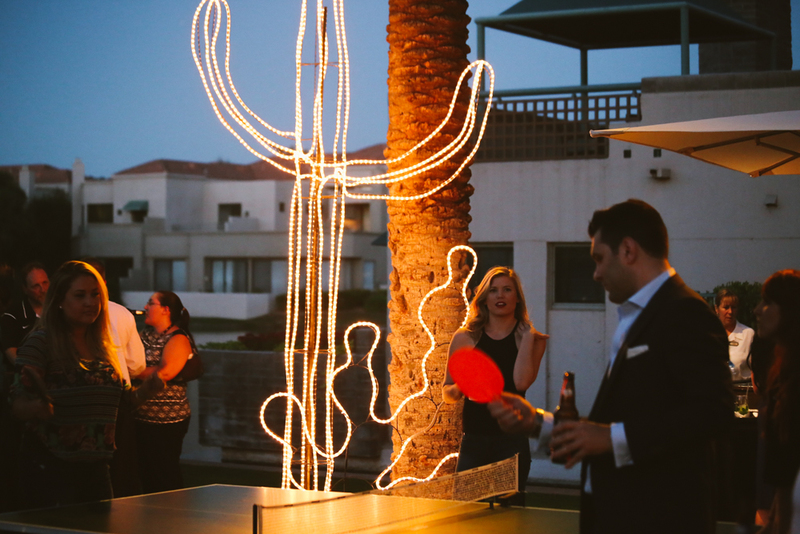 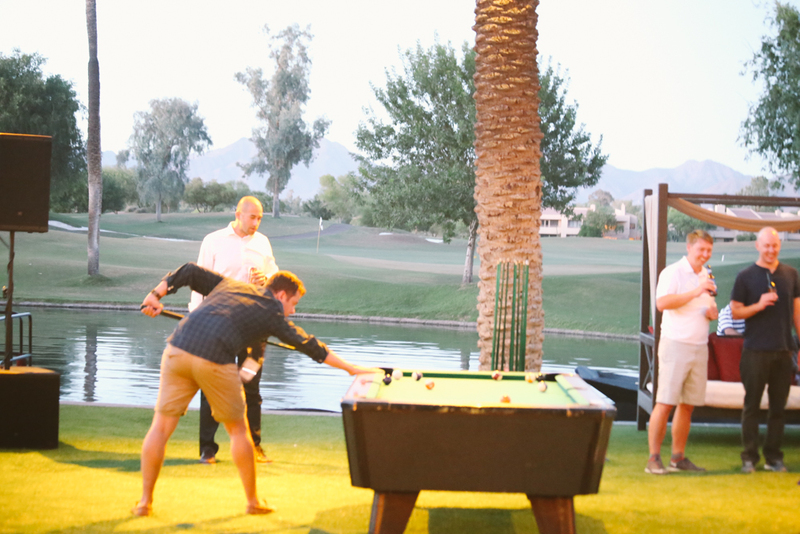 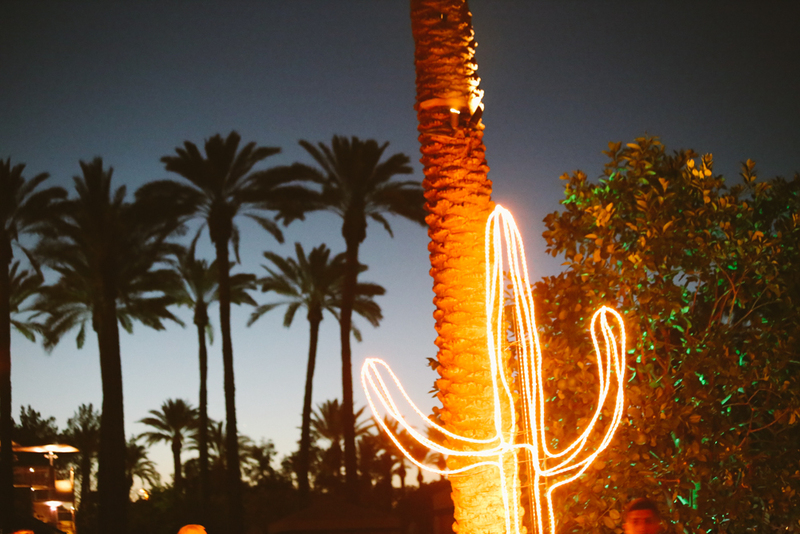 Guests enjoyed ping pong and various outdoor games surrounded by palm trees and a breathtaking view of Arizona mountains at sunset. 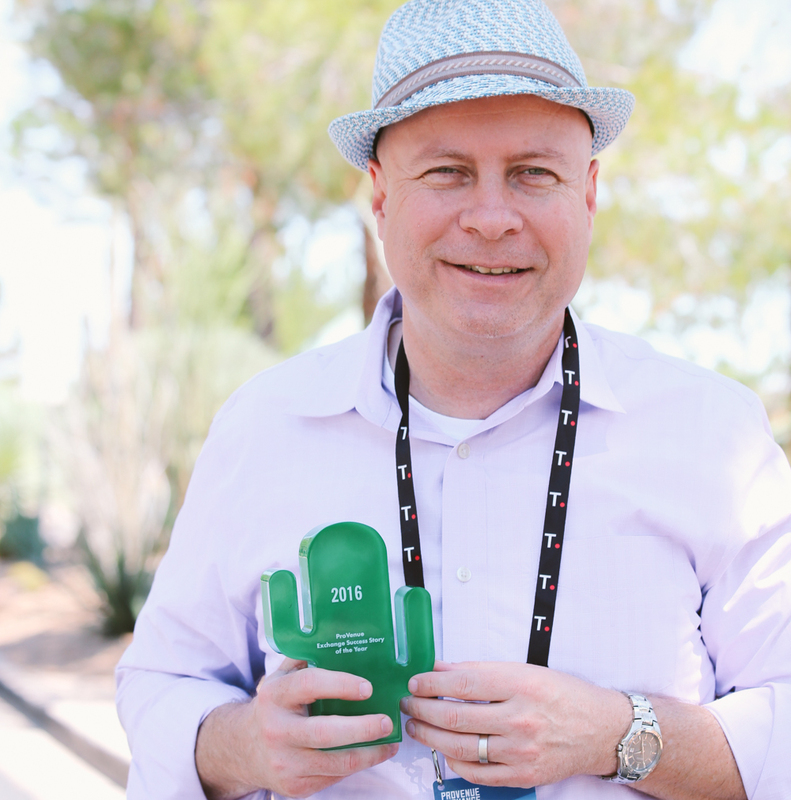 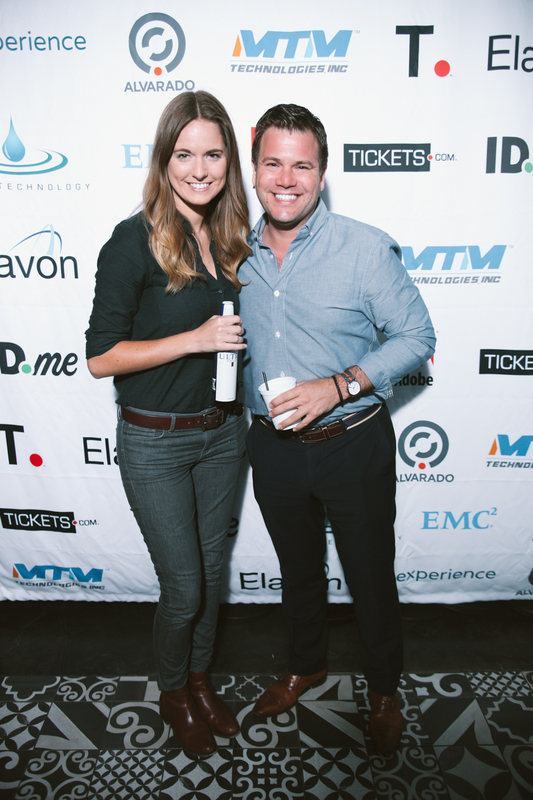 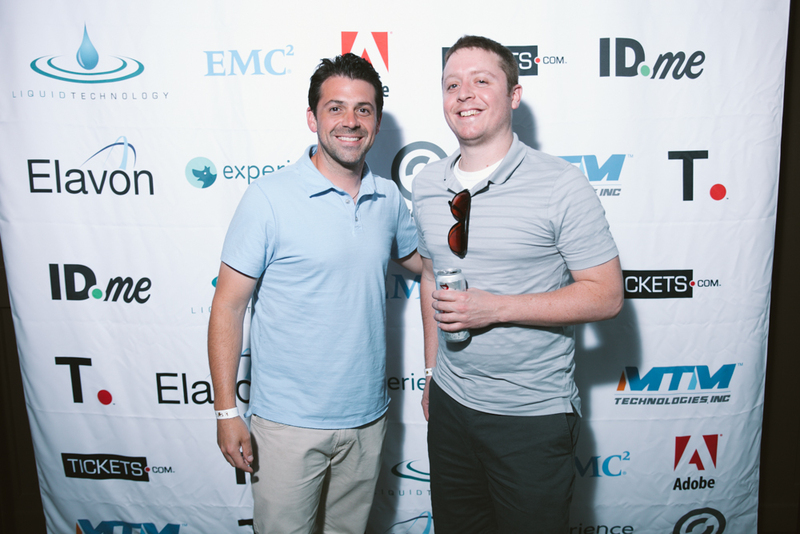 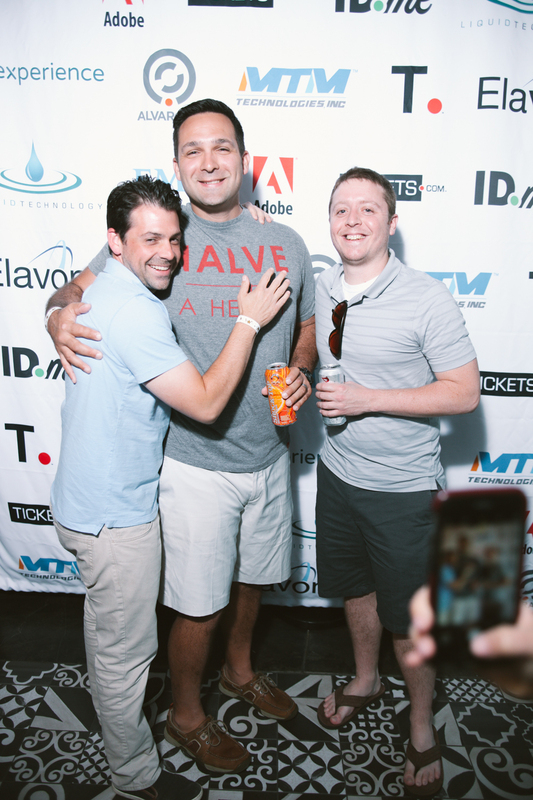 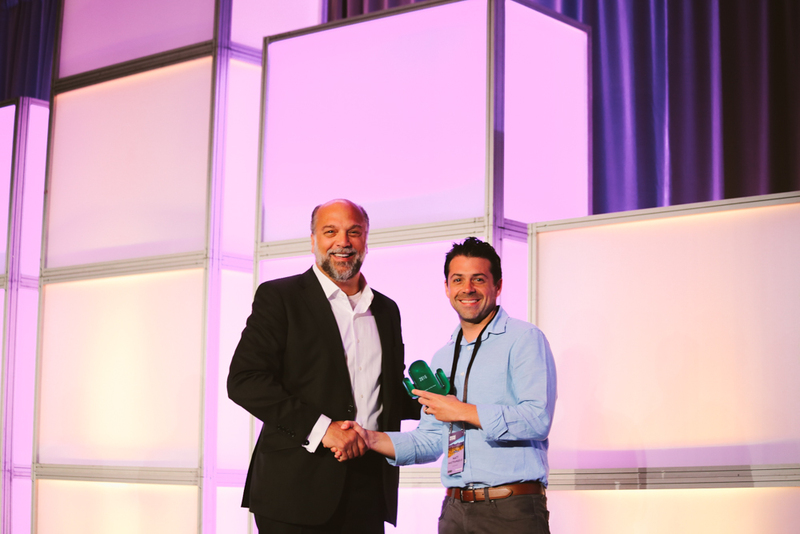 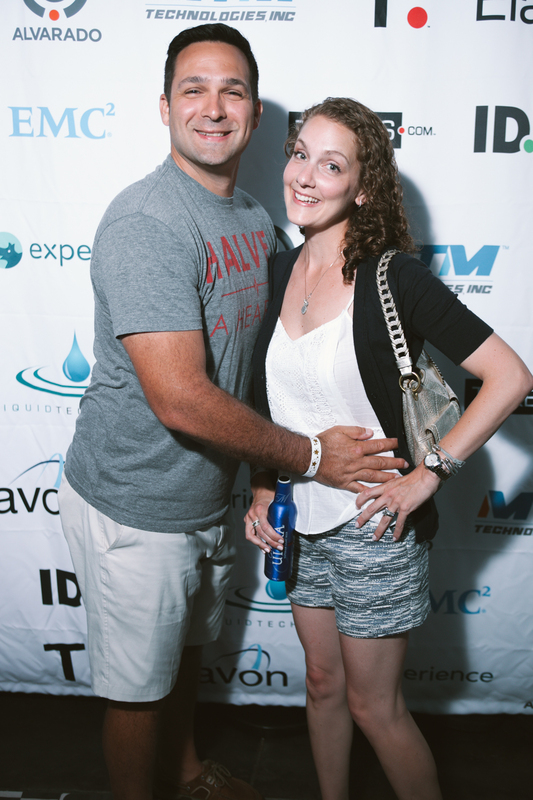 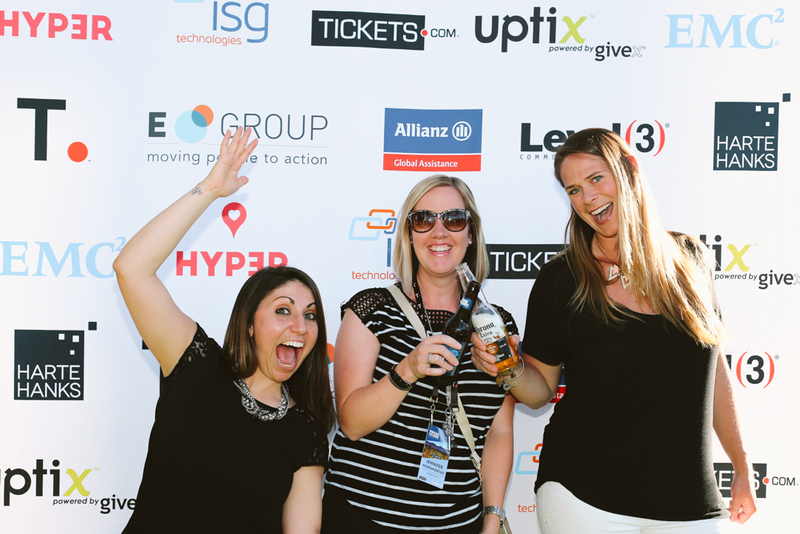 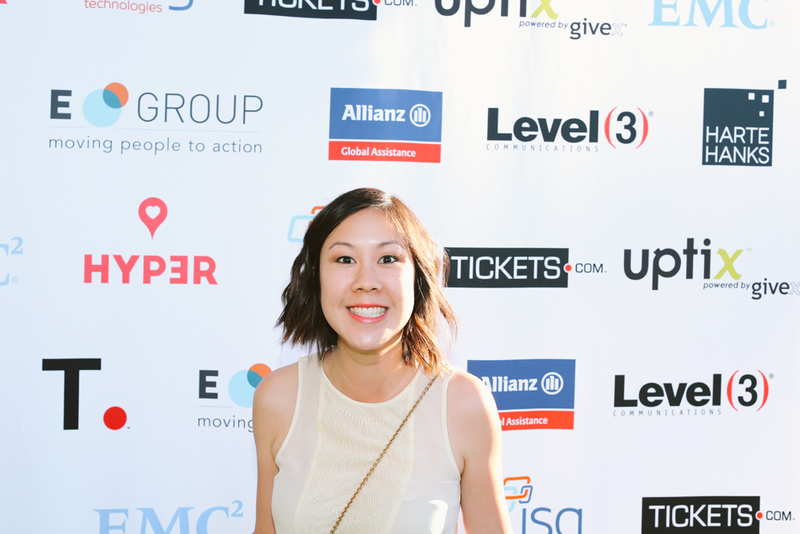 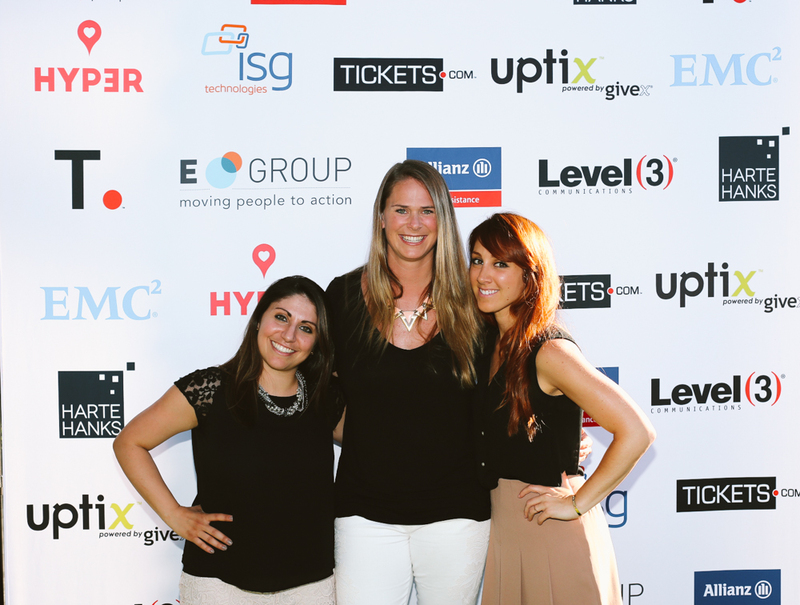 Every year, Tickets.com takes a moment to recognize some of its clients’ finest achievements. 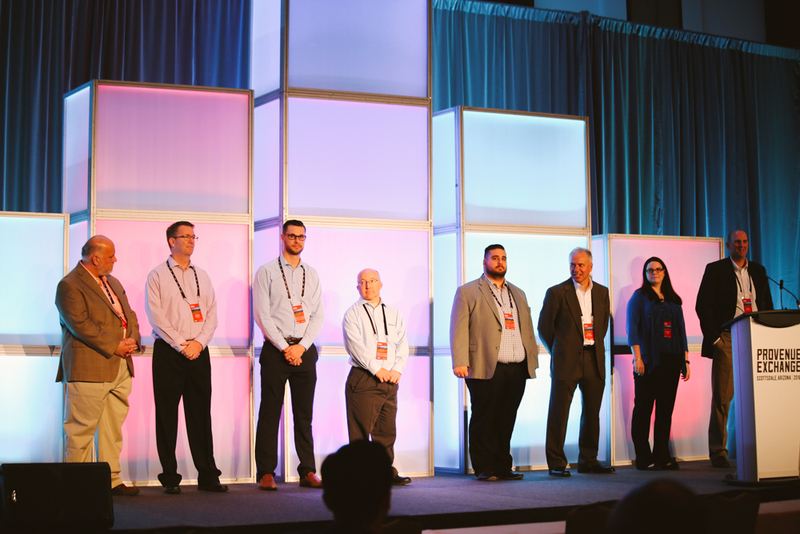 Congrats to this year’s winners! 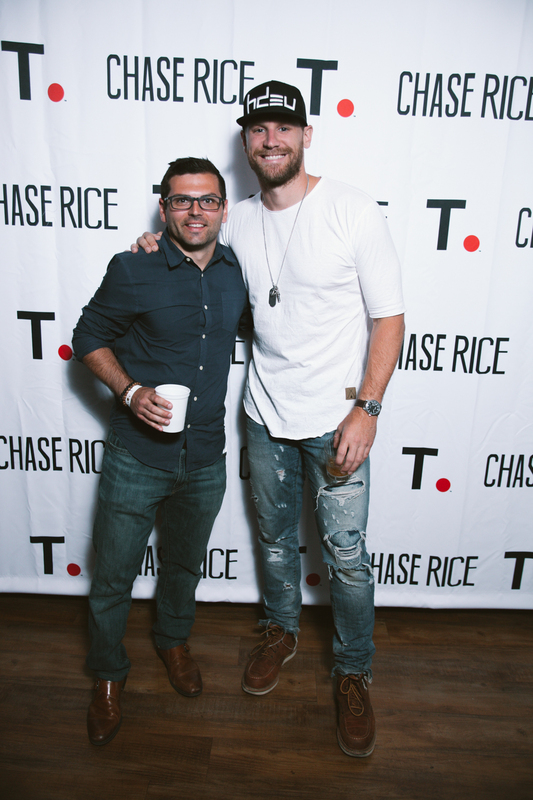 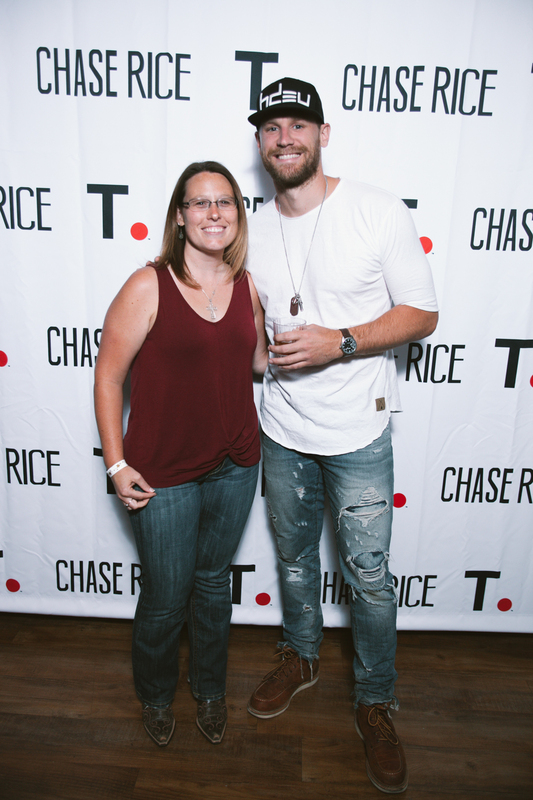 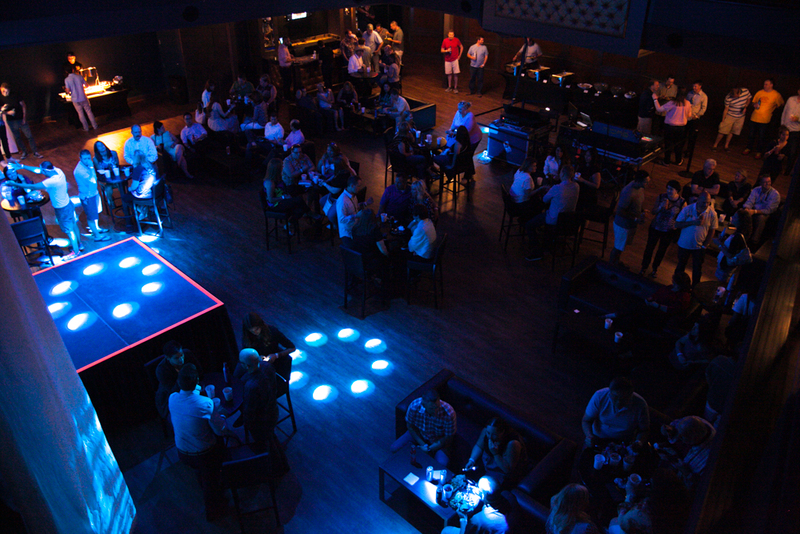 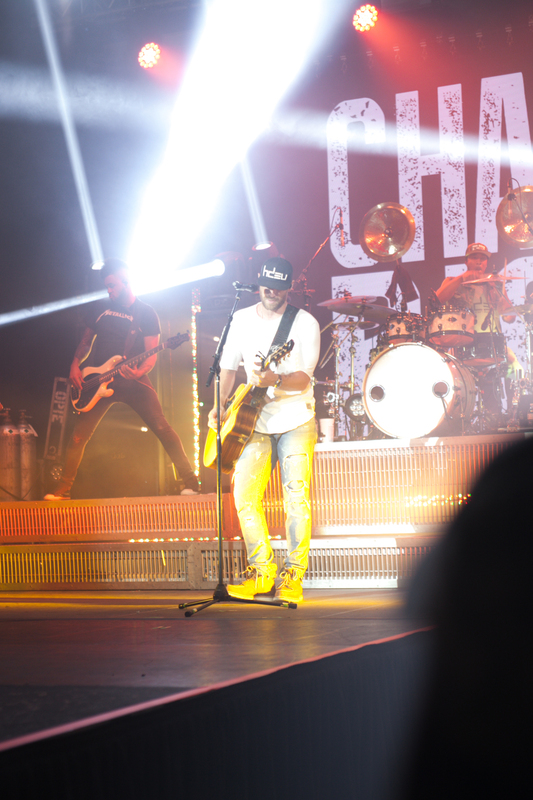 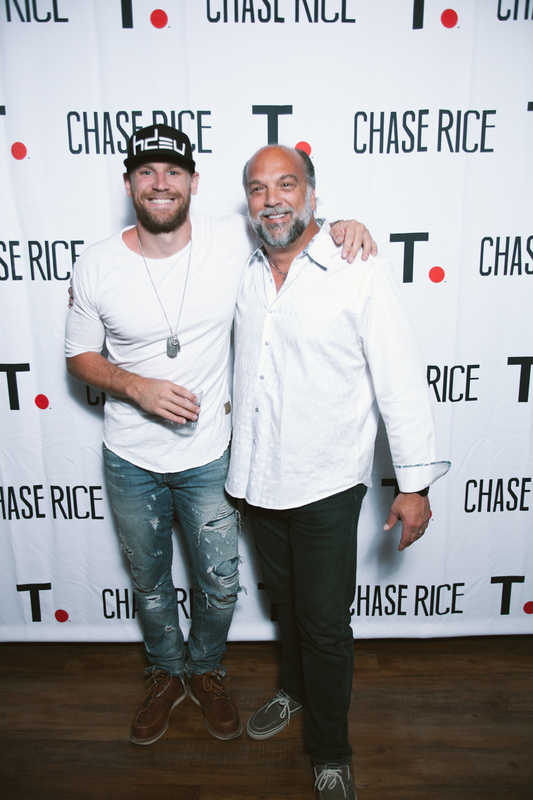 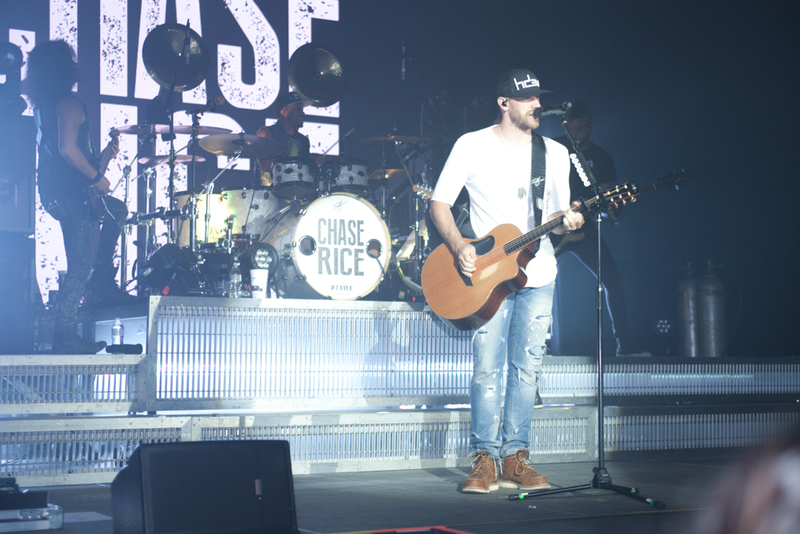 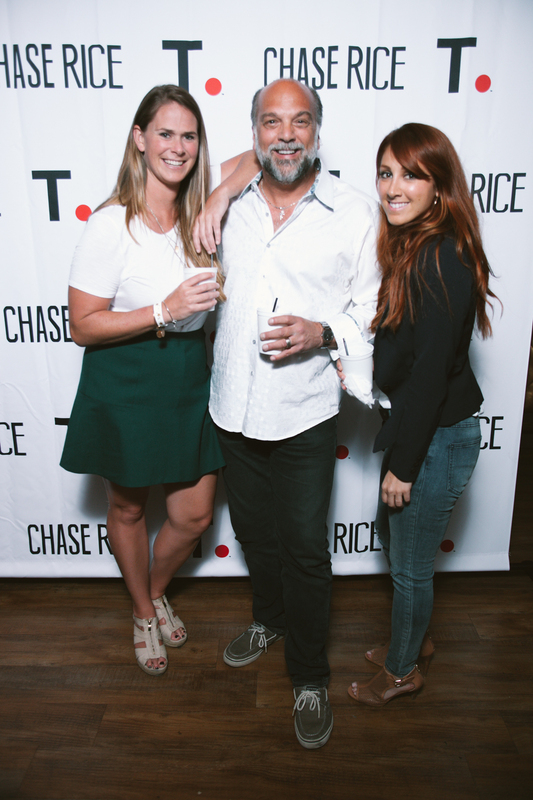 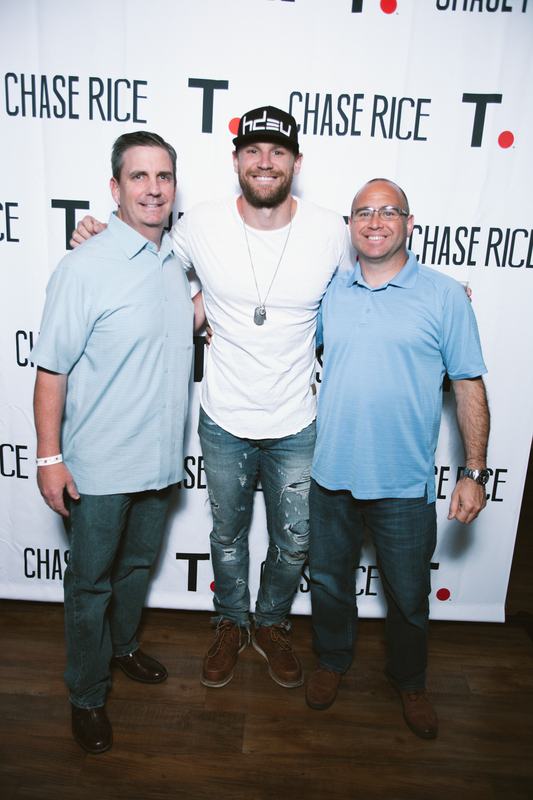 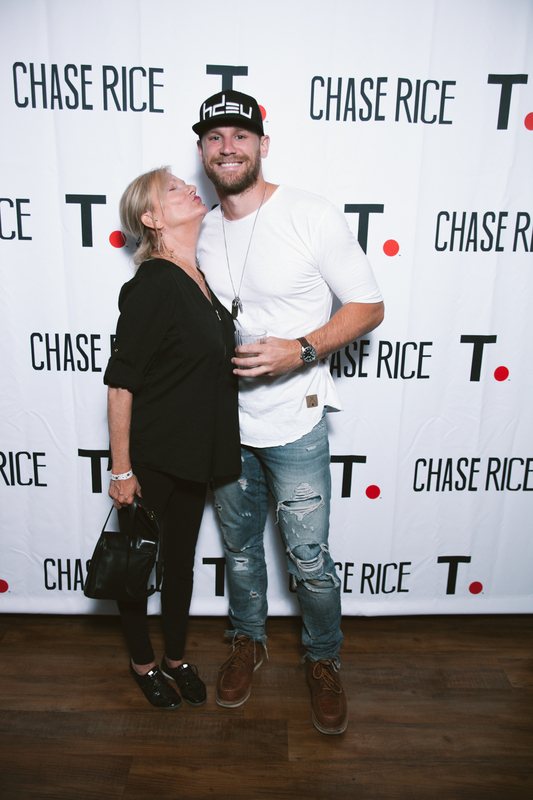 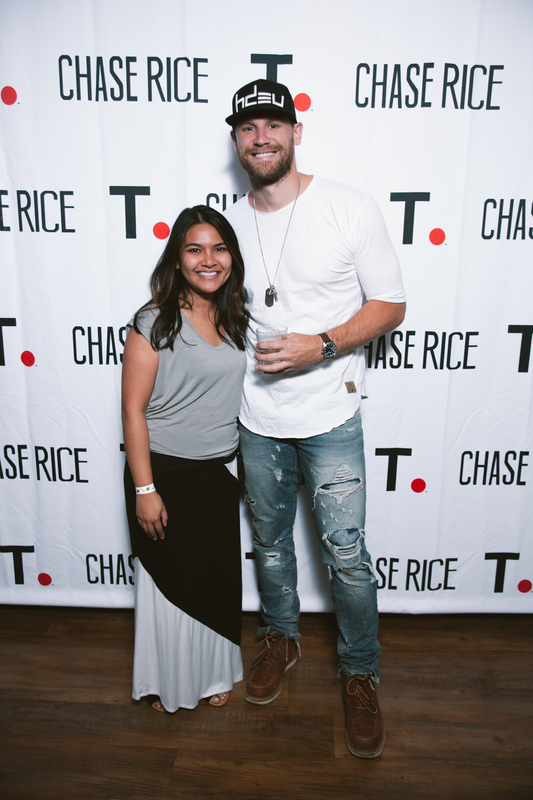 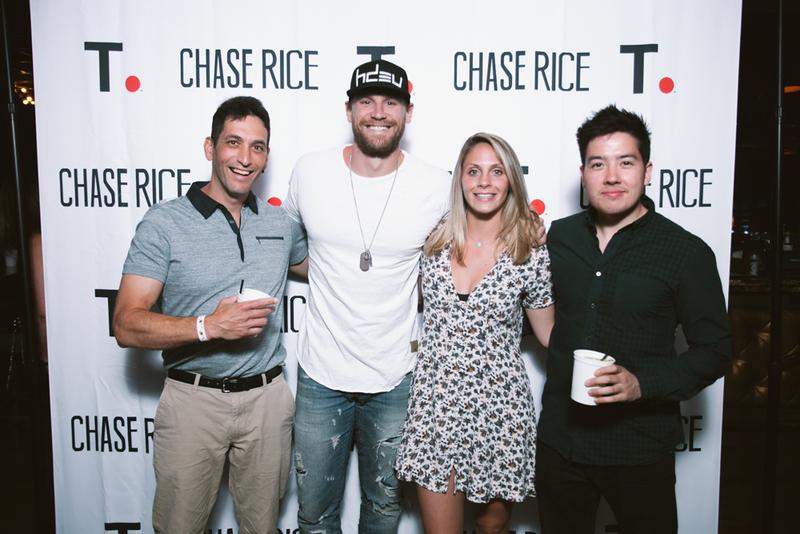 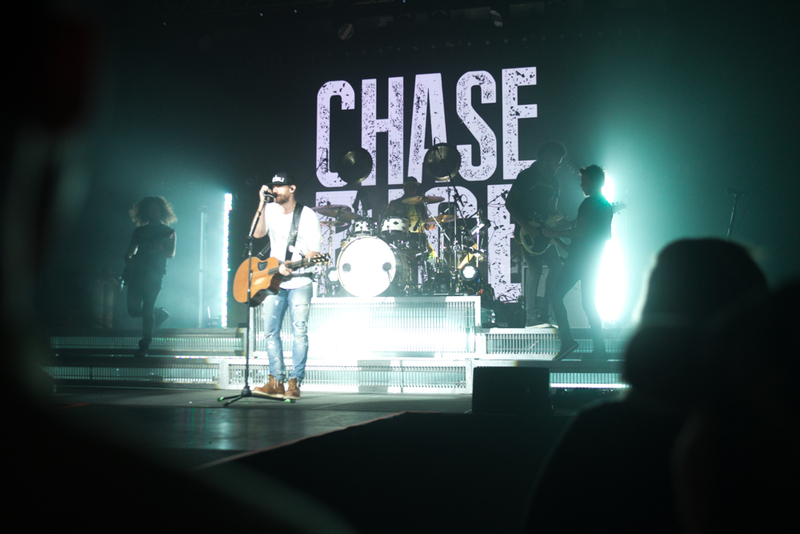 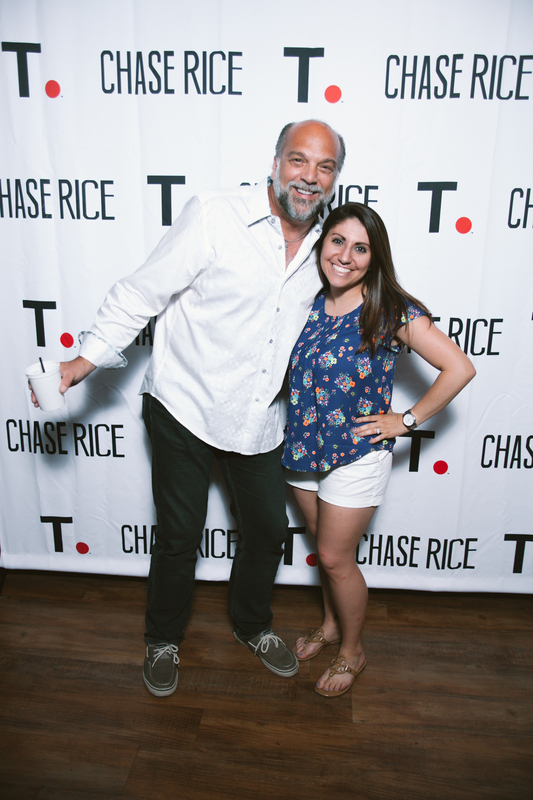 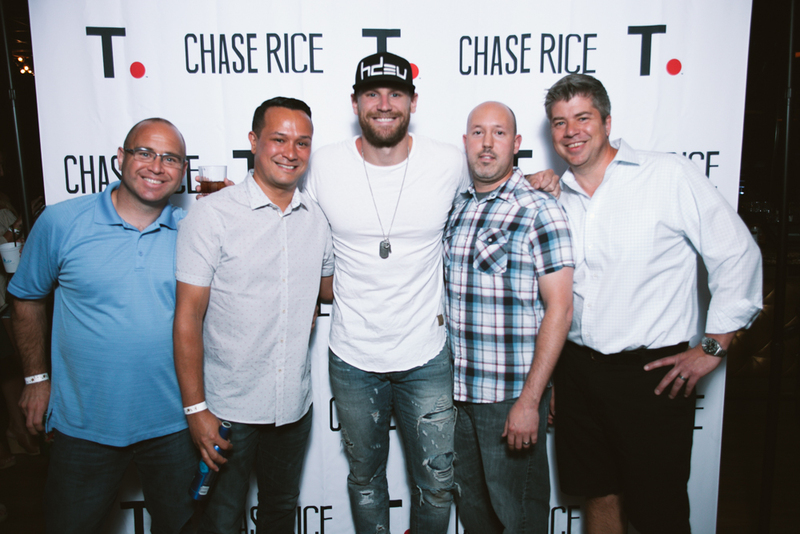 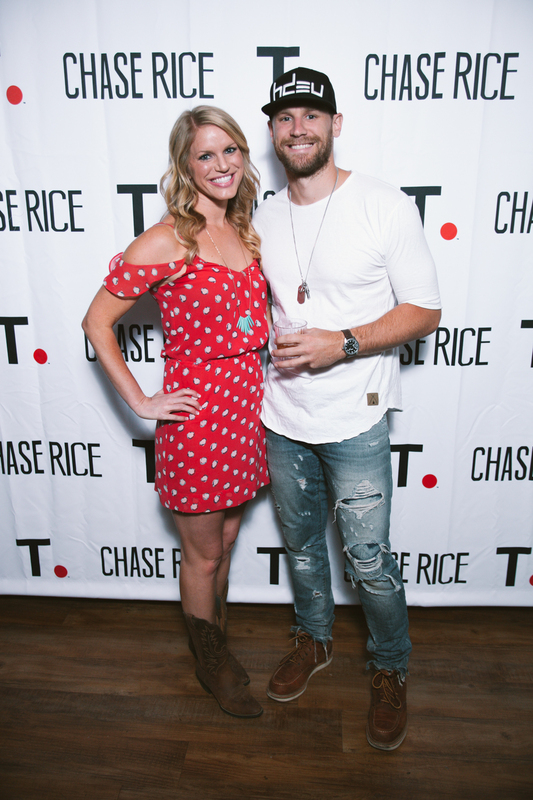 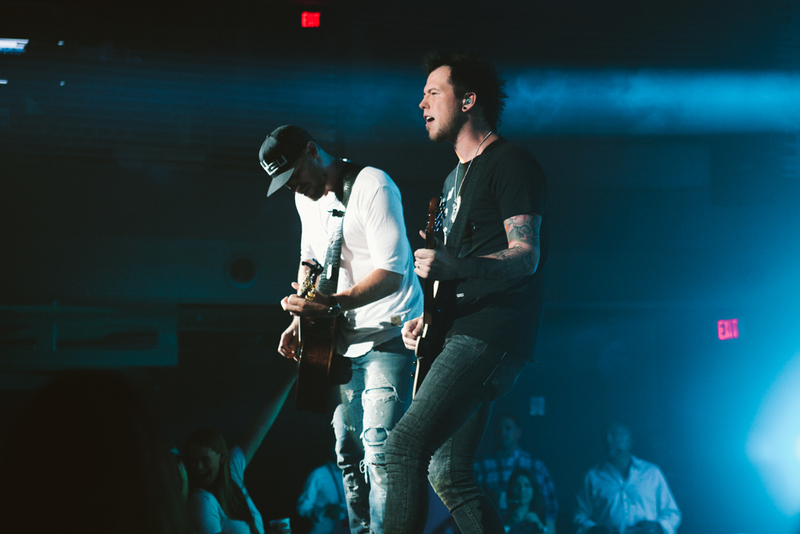 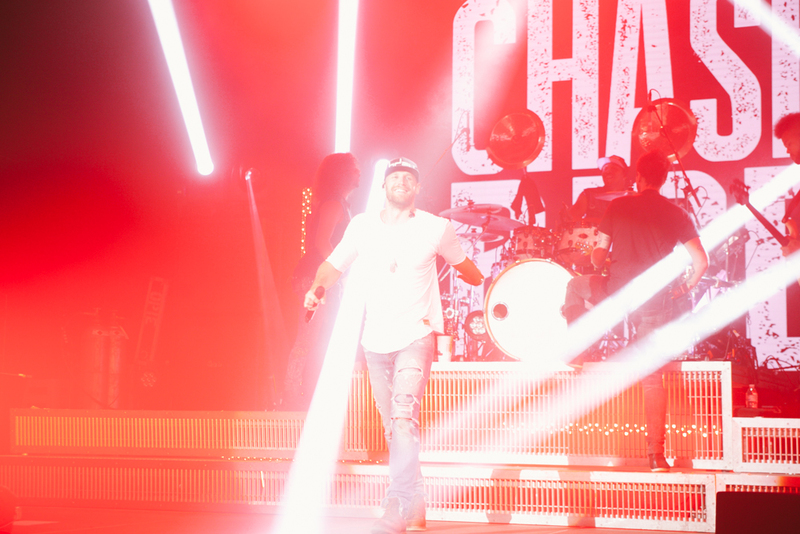 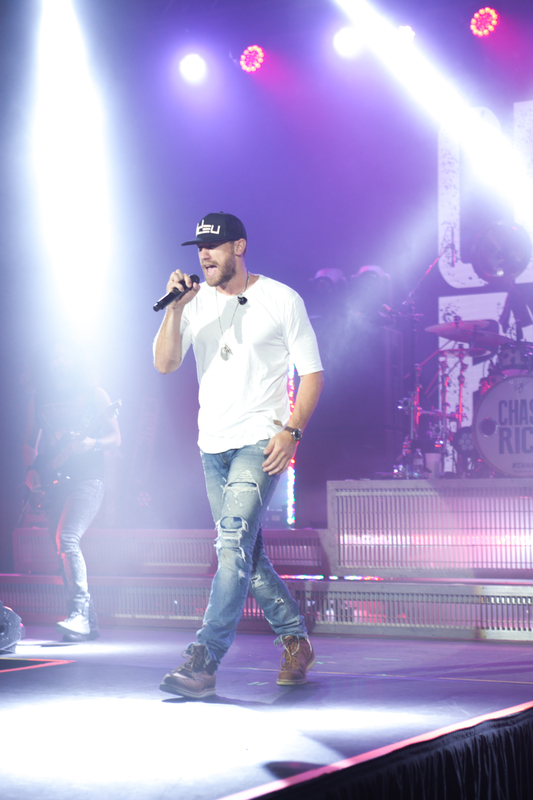 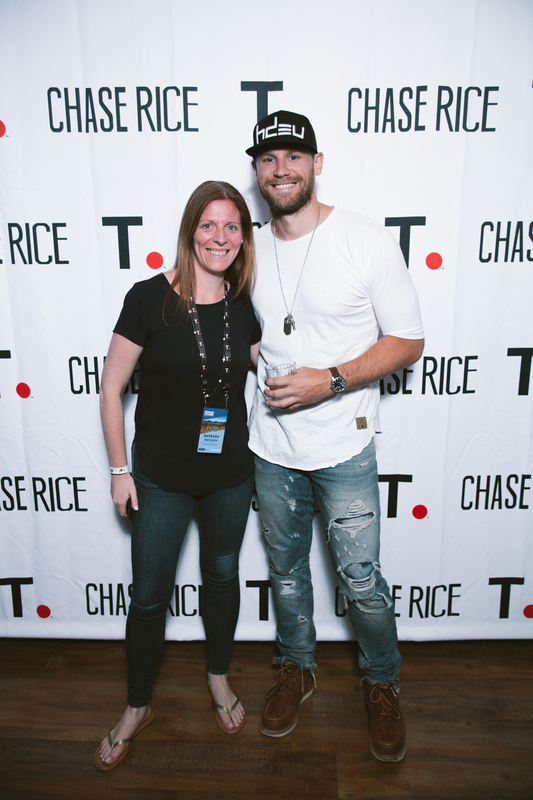 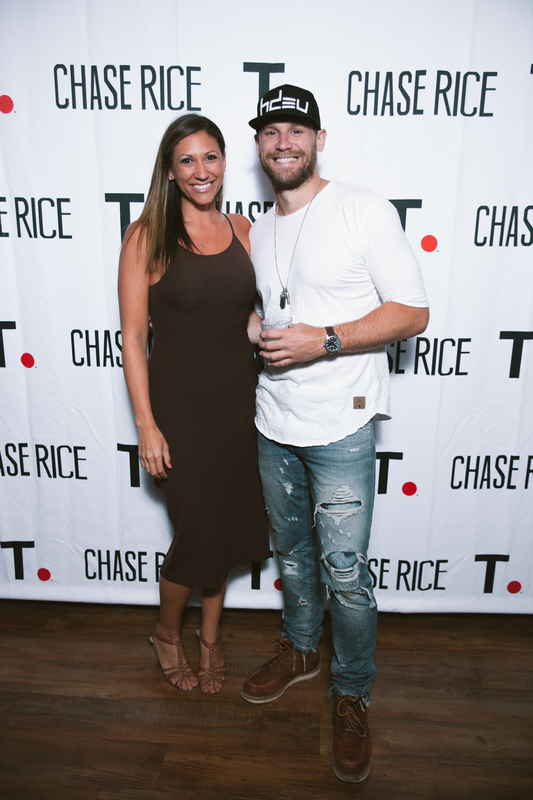 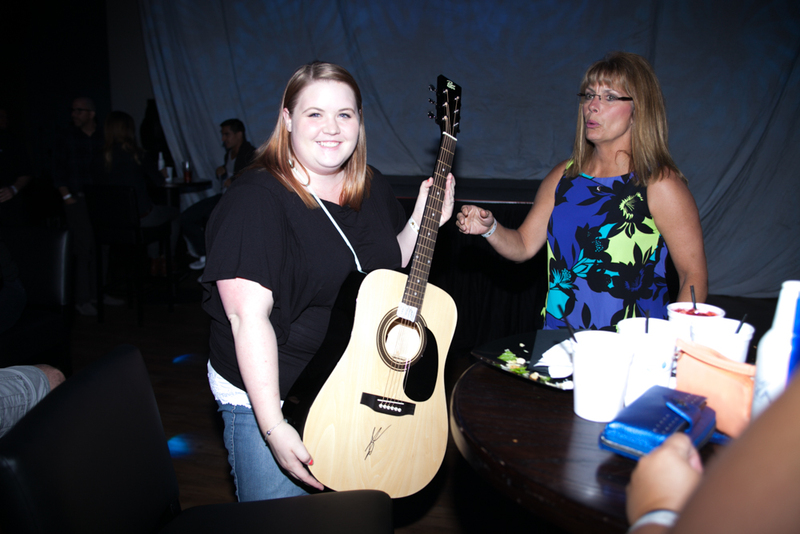 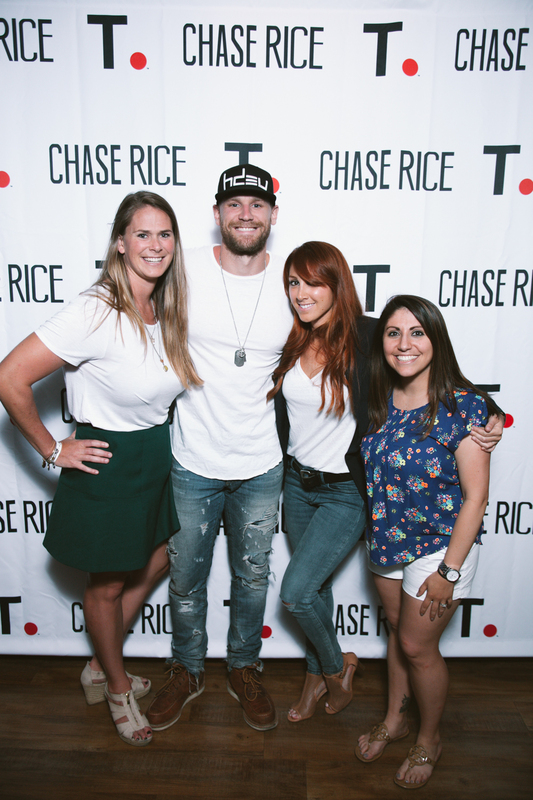 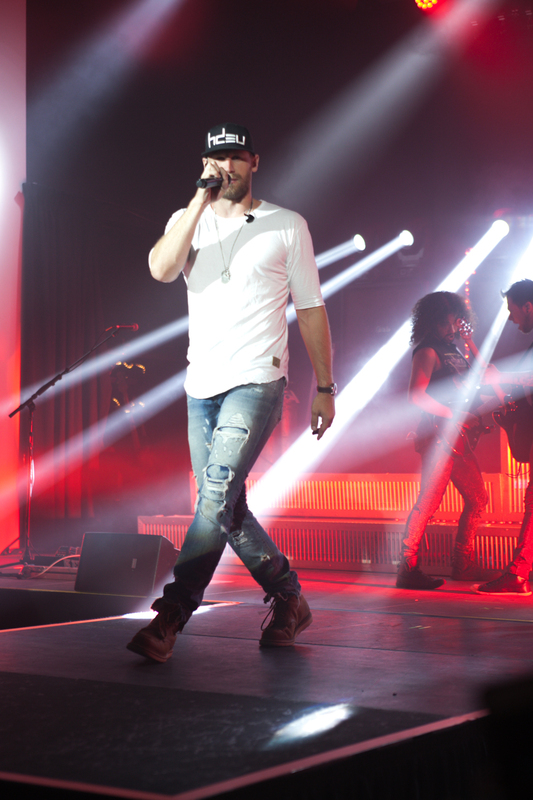 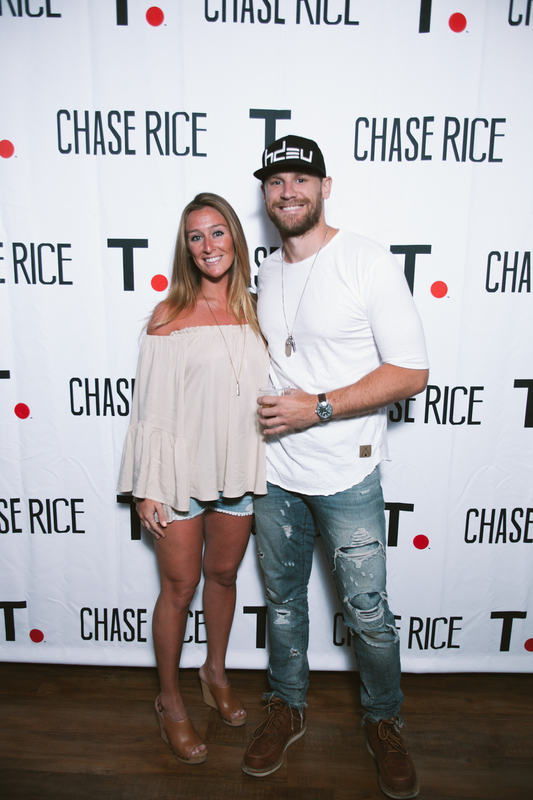 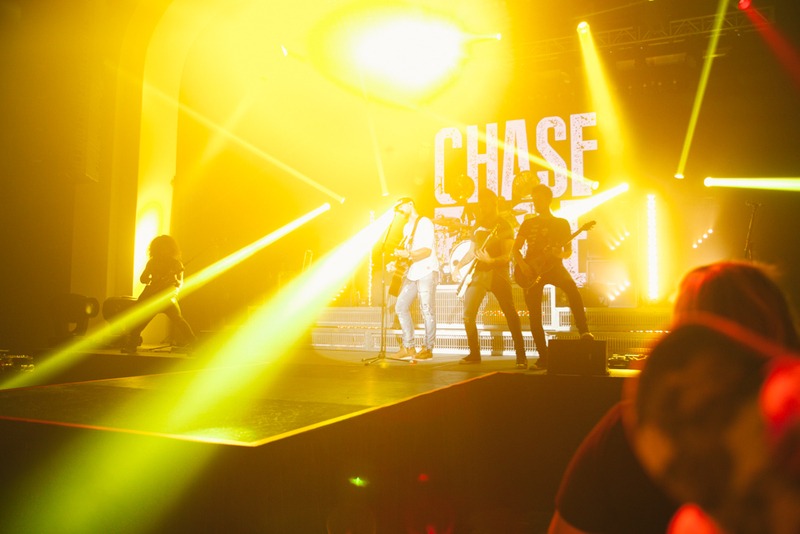 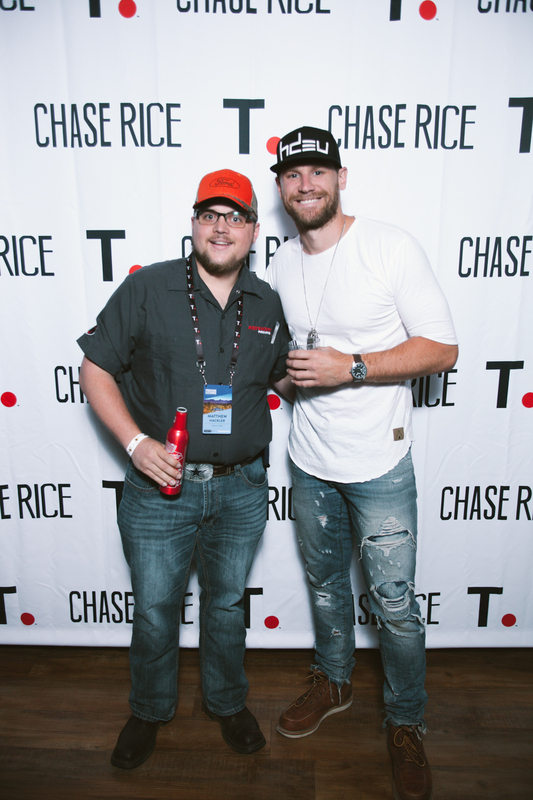 Country music singer and songwriter Chase Rice lit up the Entertainment District of Scottsdale during the ProVenue Exchange private concert at Livewire. 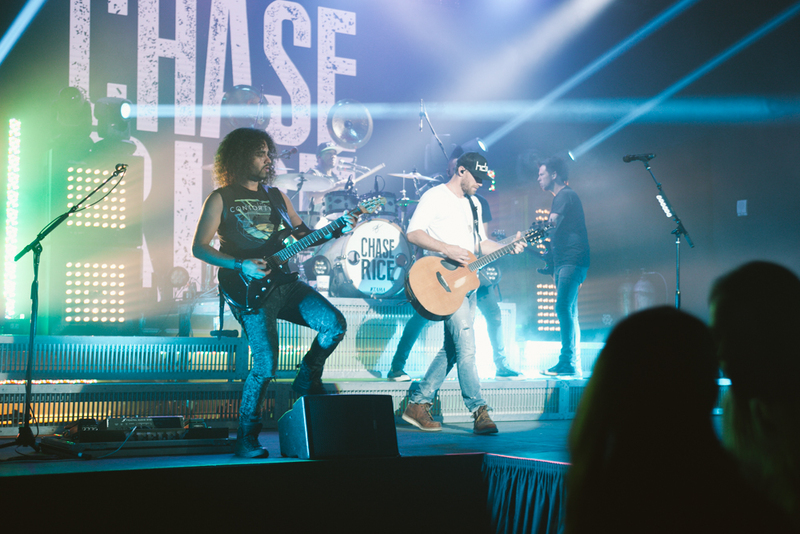 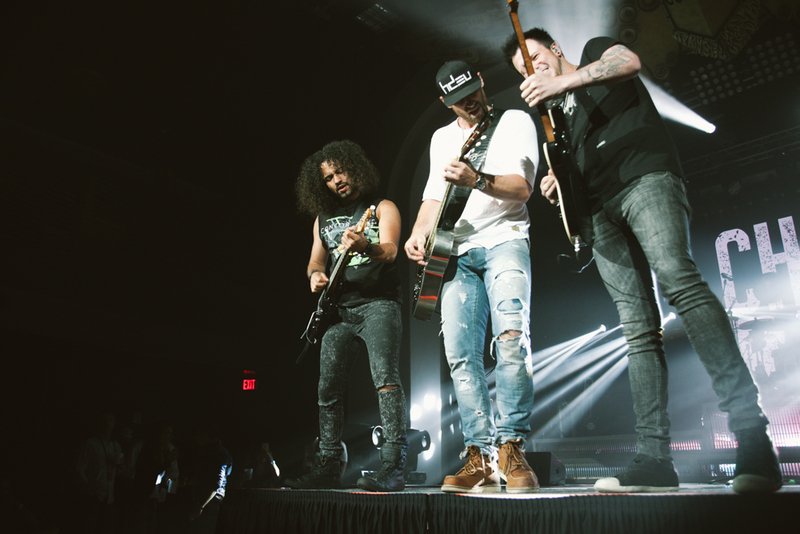 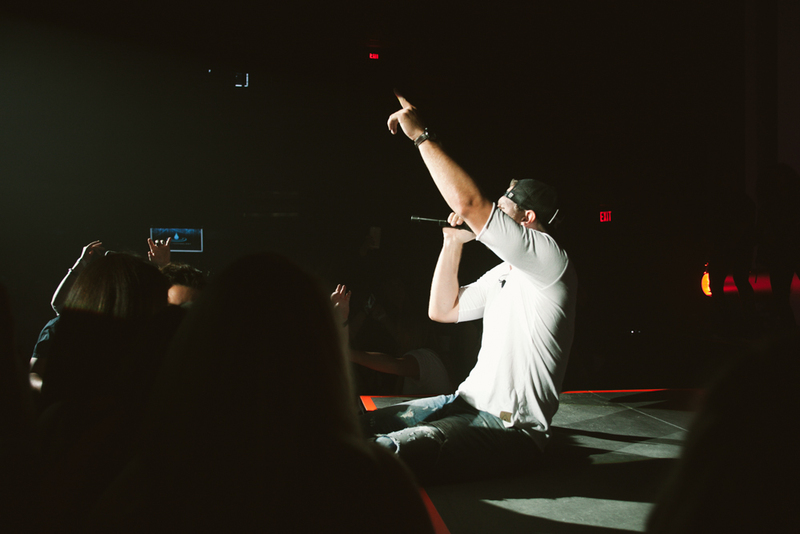 The entire performance was exhilarating and had the crowd on their feet singing and dancing to Chase Rice originals along with country and rock classics. 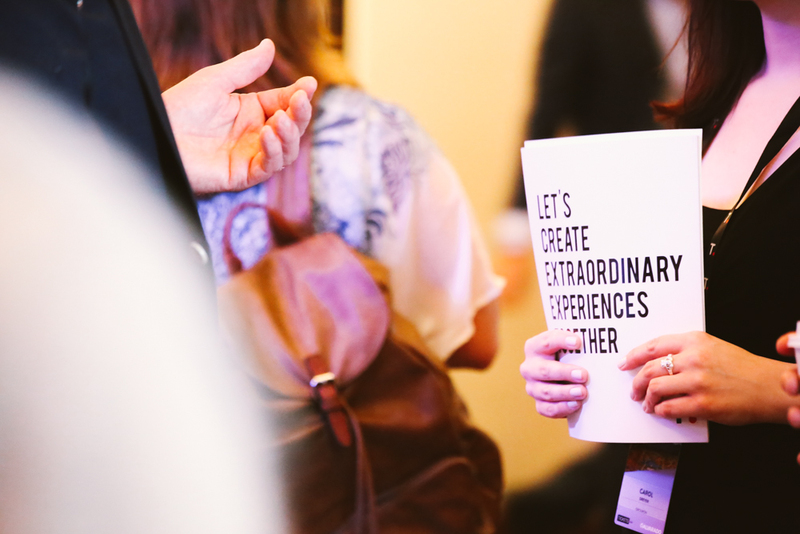 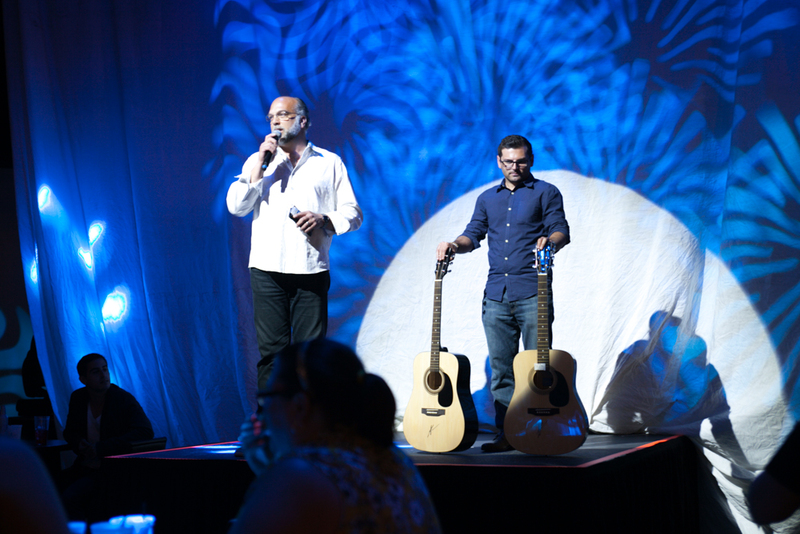 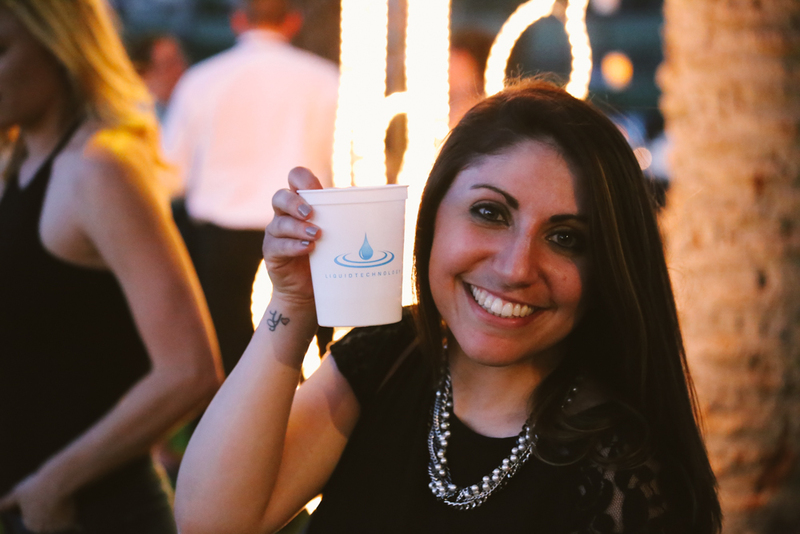 Every attendee would agree – it was an unforgettable night! 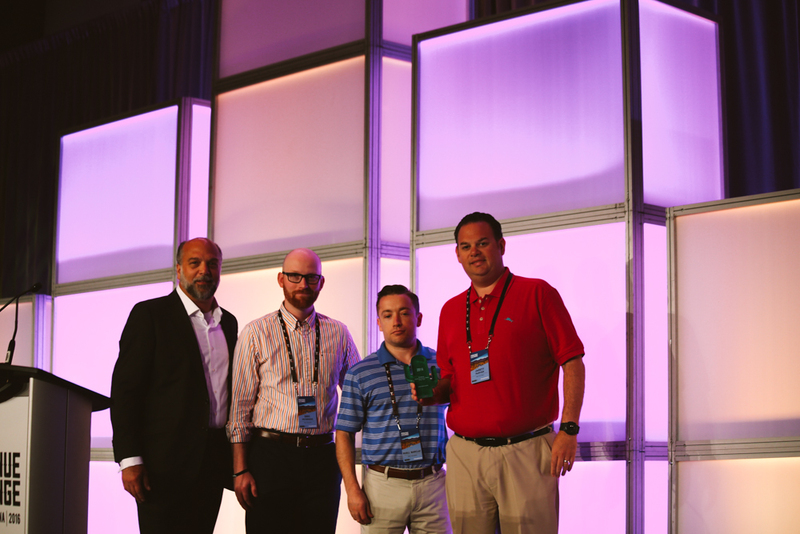 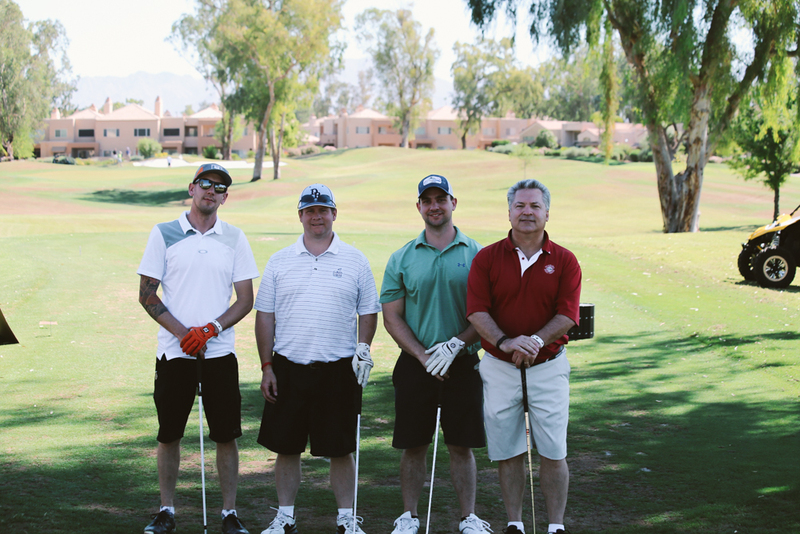 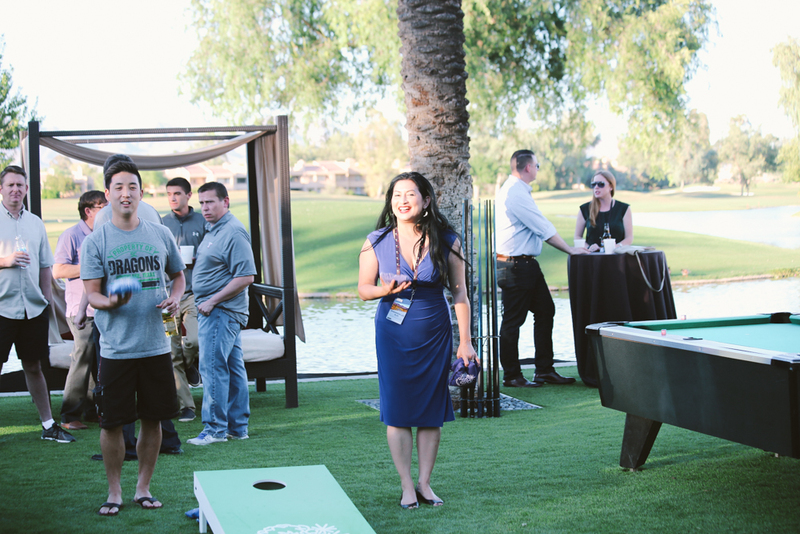 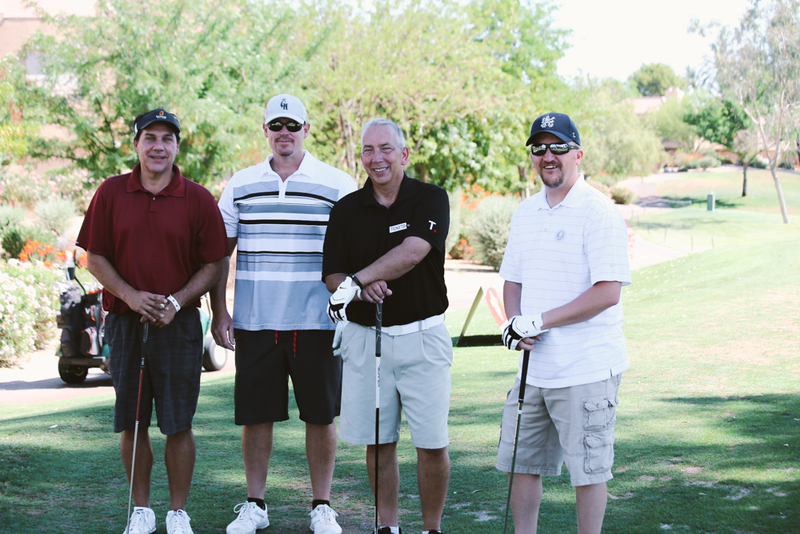 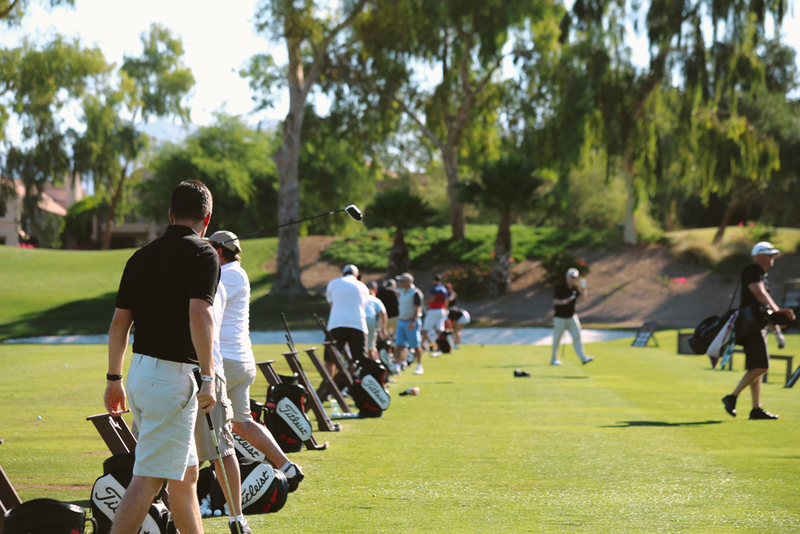 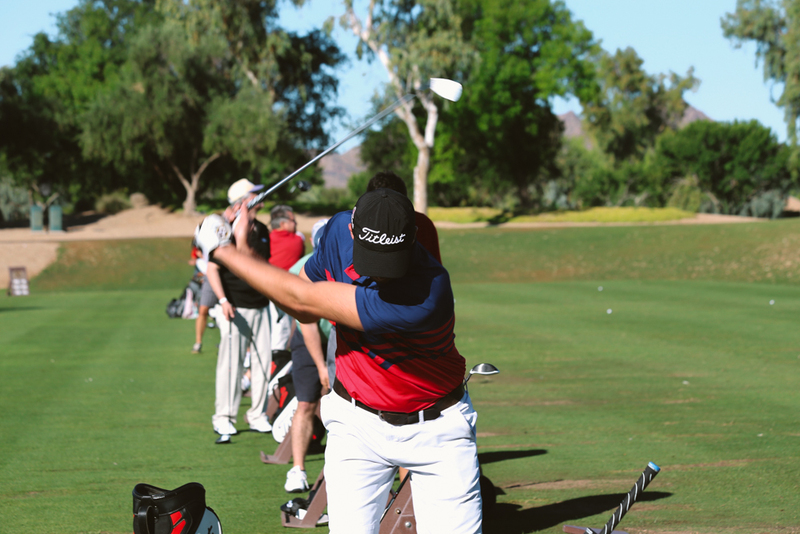 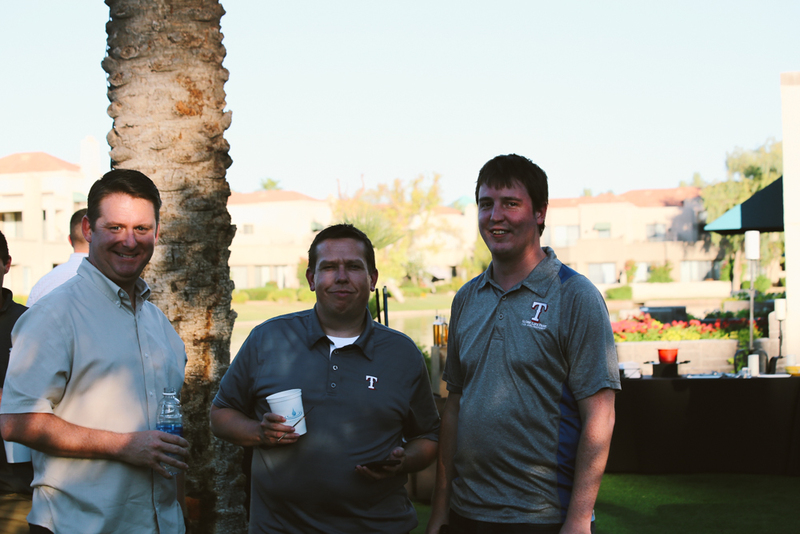 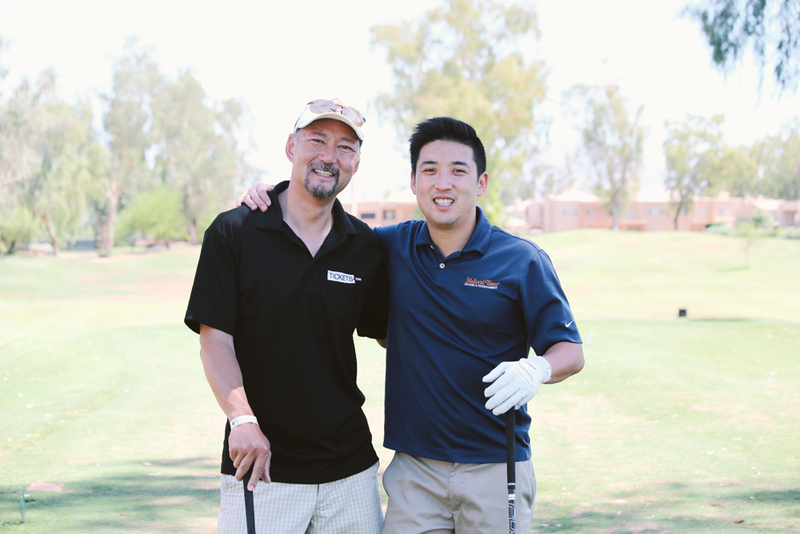 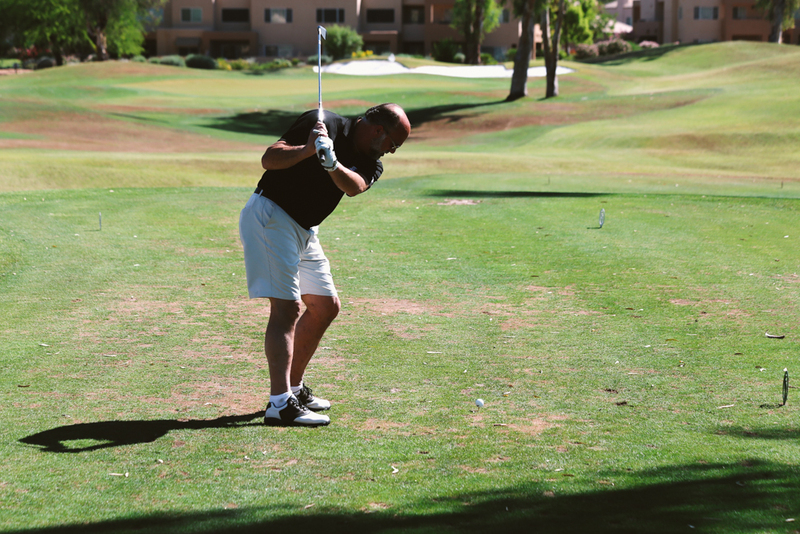 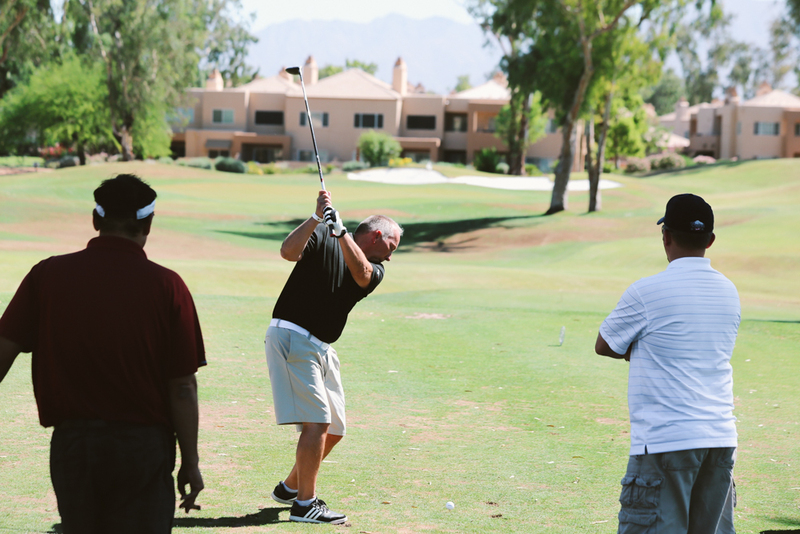 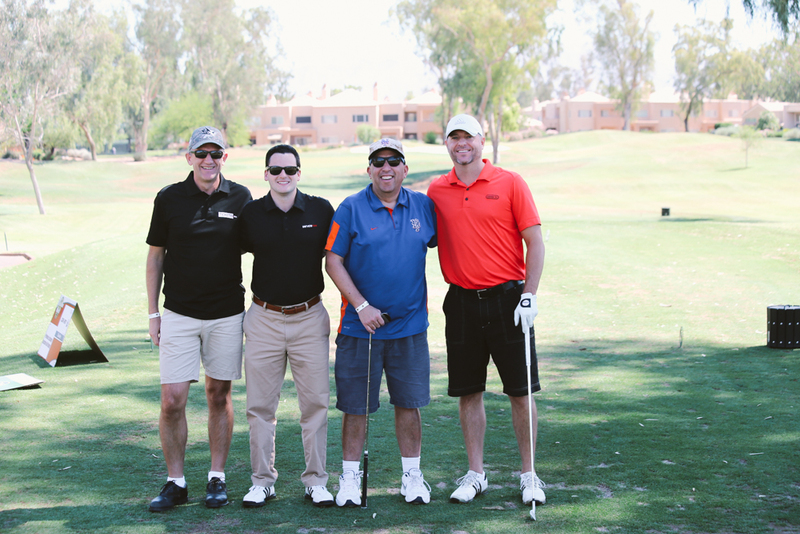 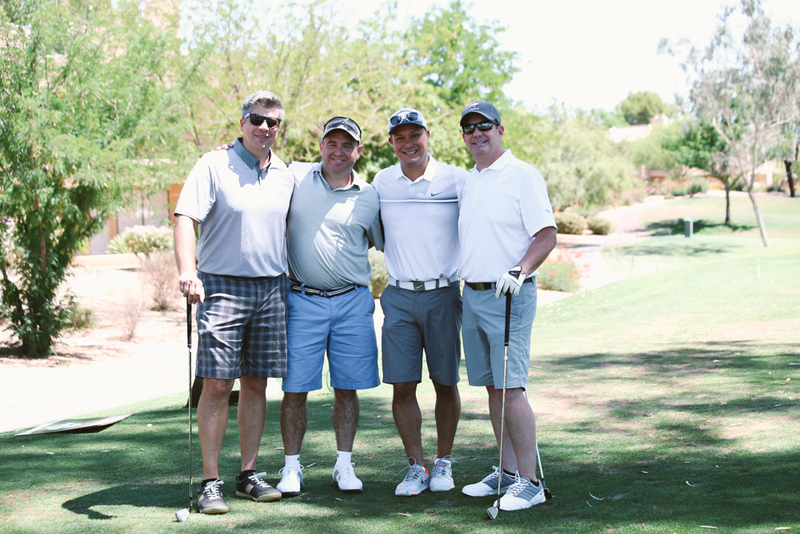 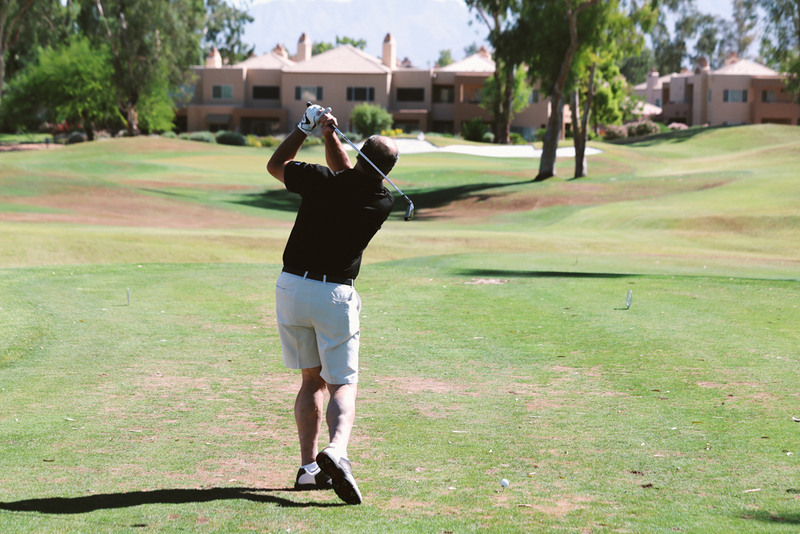 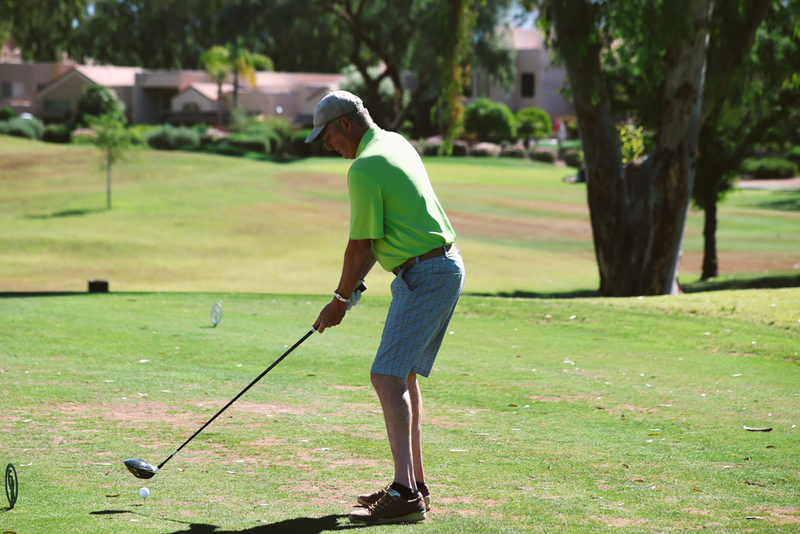 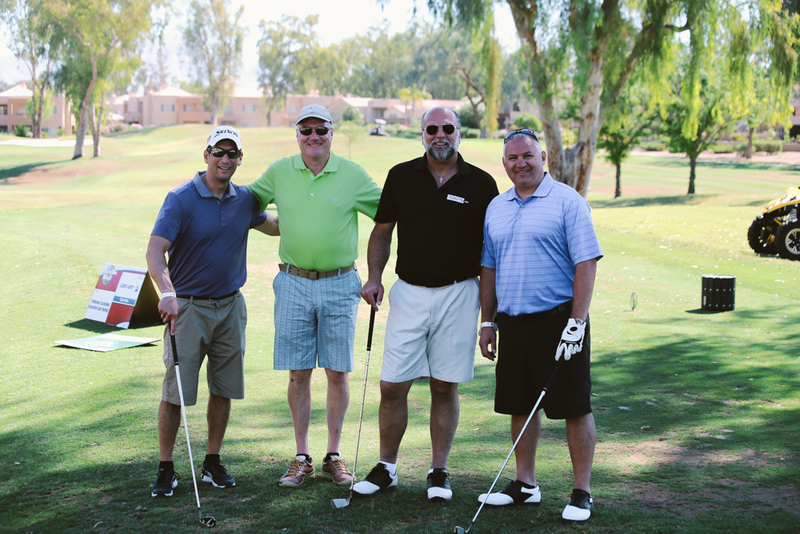 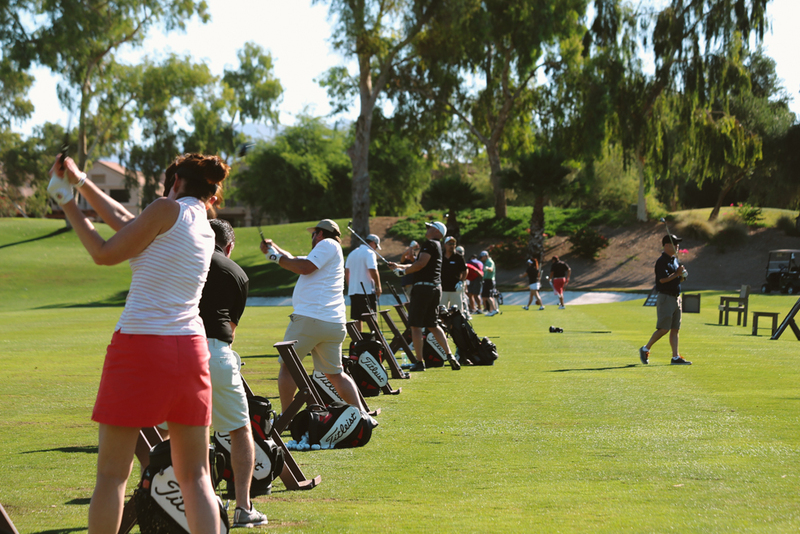 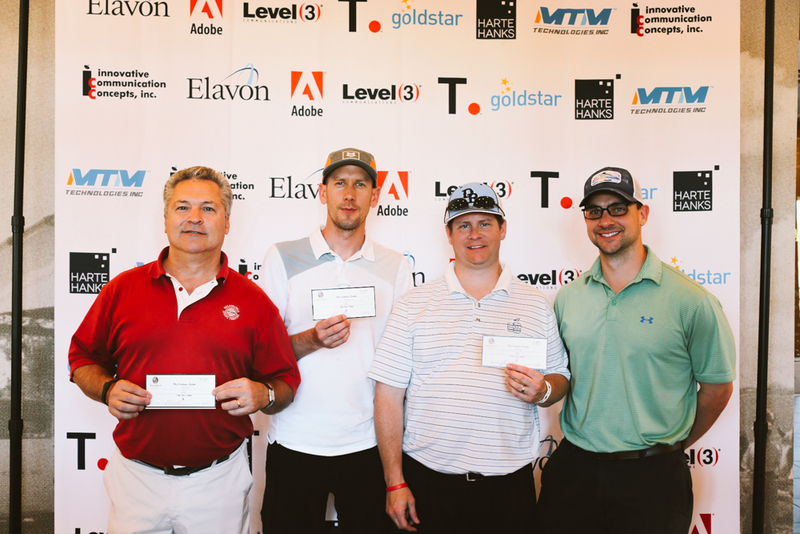 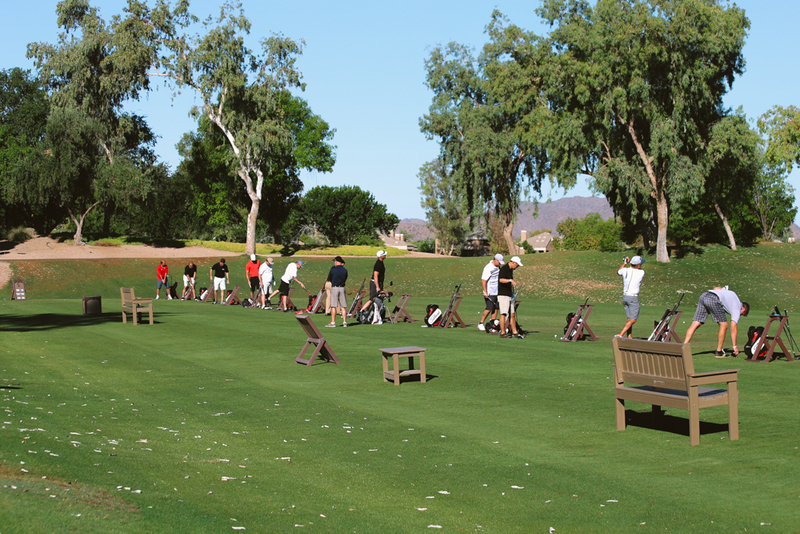 On the last day of the conference, attendees enjoyed an early game of golf at Gainey Ranch, which has been recognized for its “lush greenery, sparkling waterways and spectacular waterfall at the ninth hole.” Congrats to our first and second place winners! 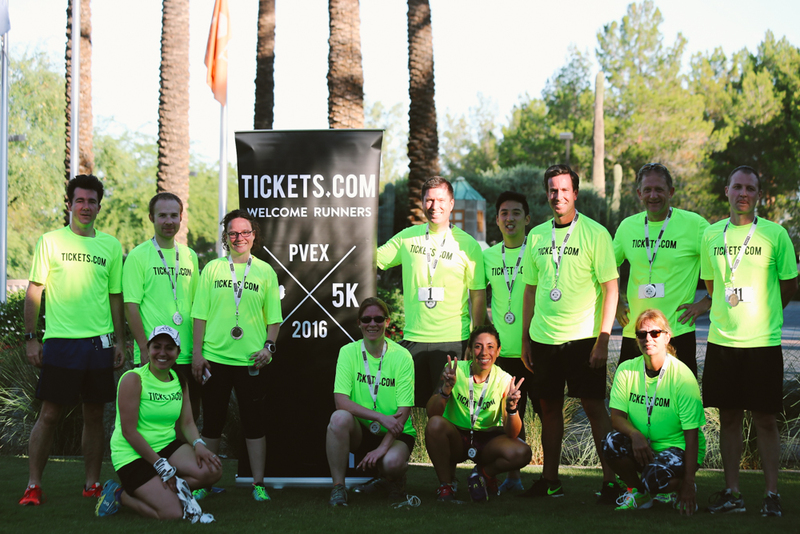 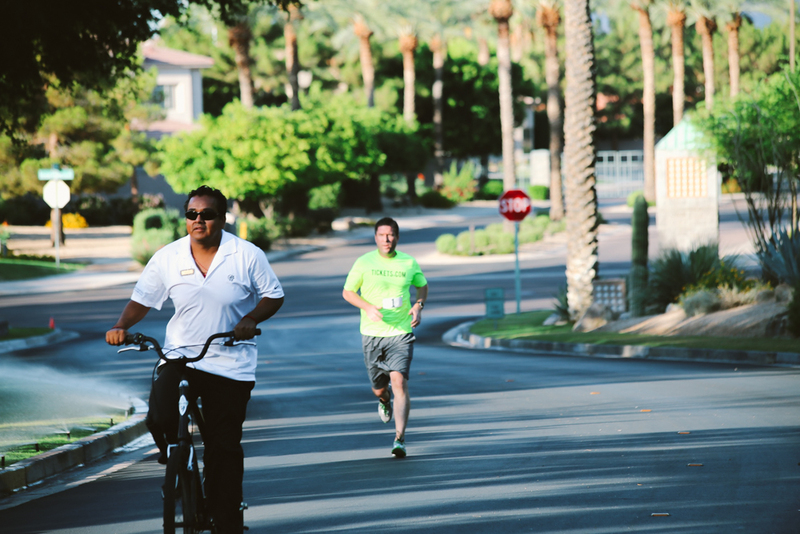 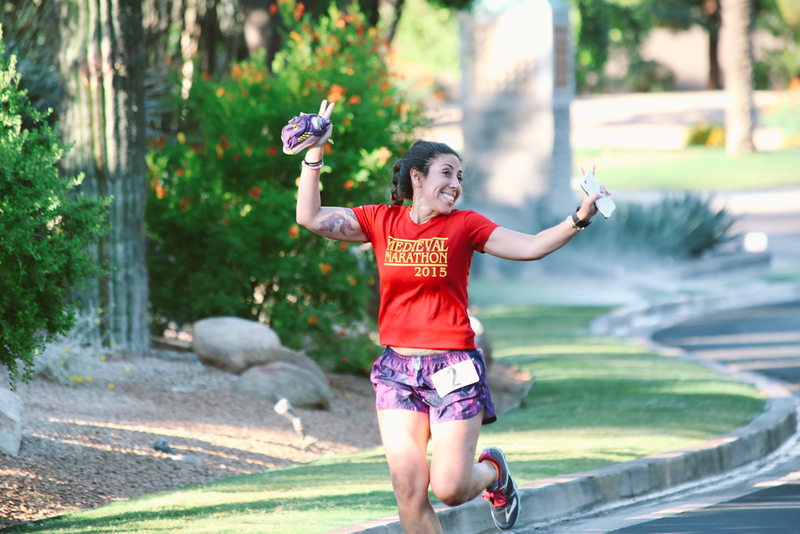 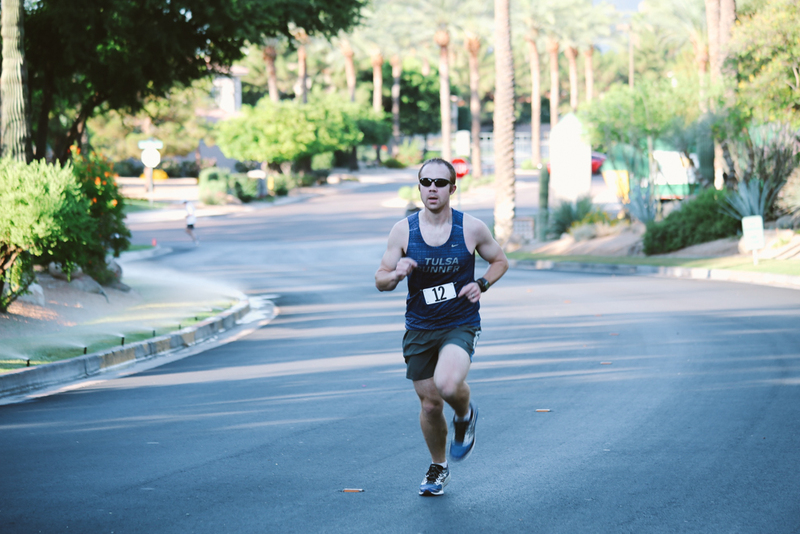 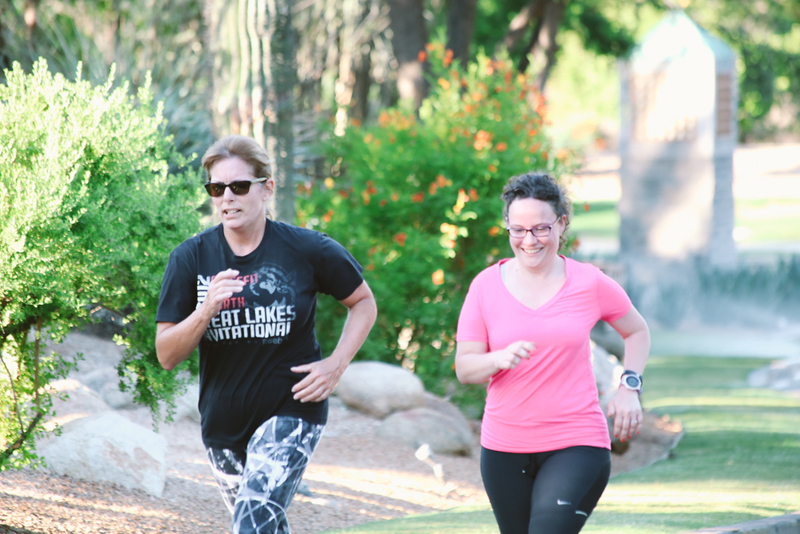 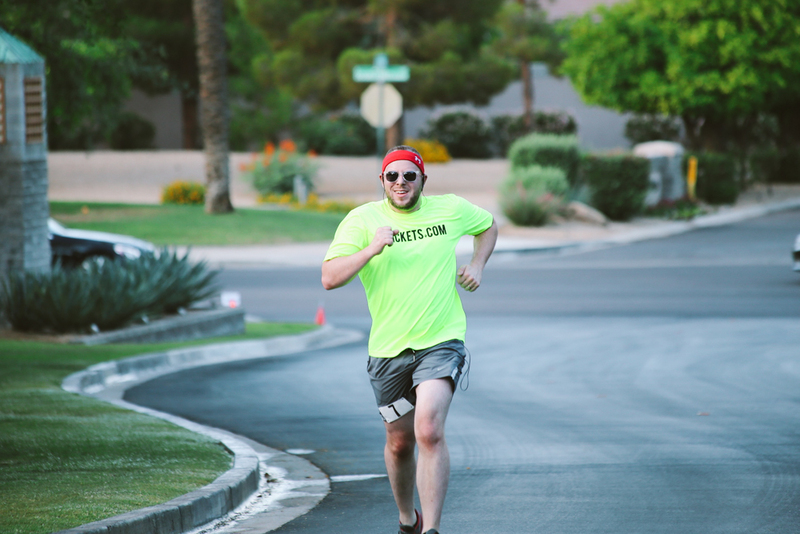 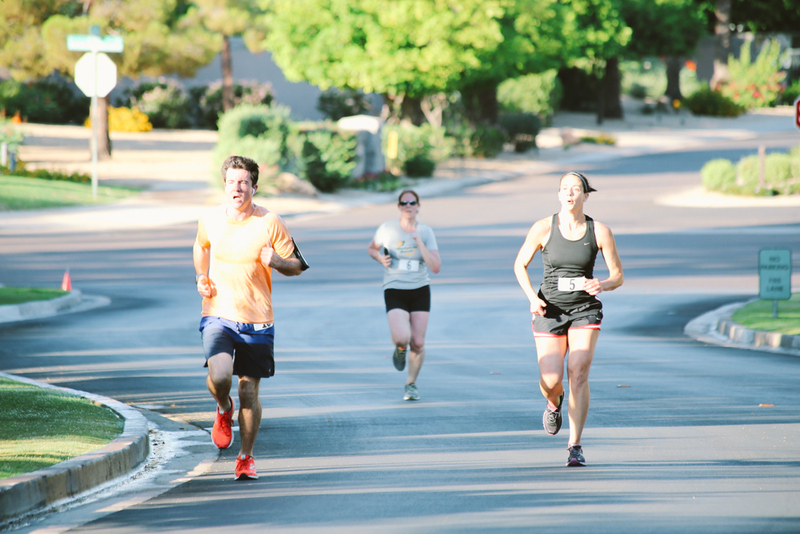 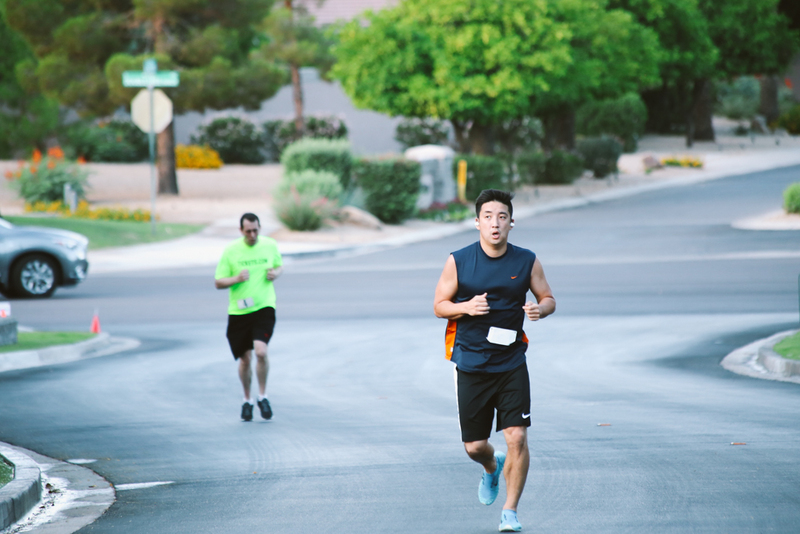 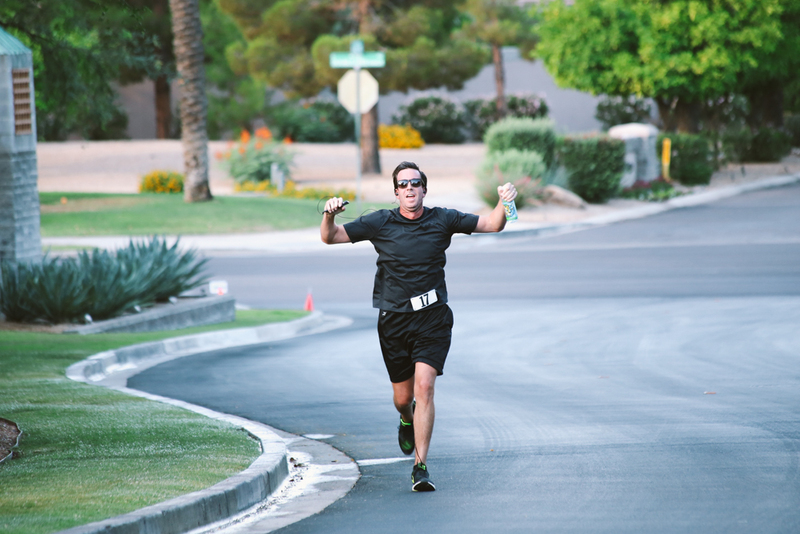 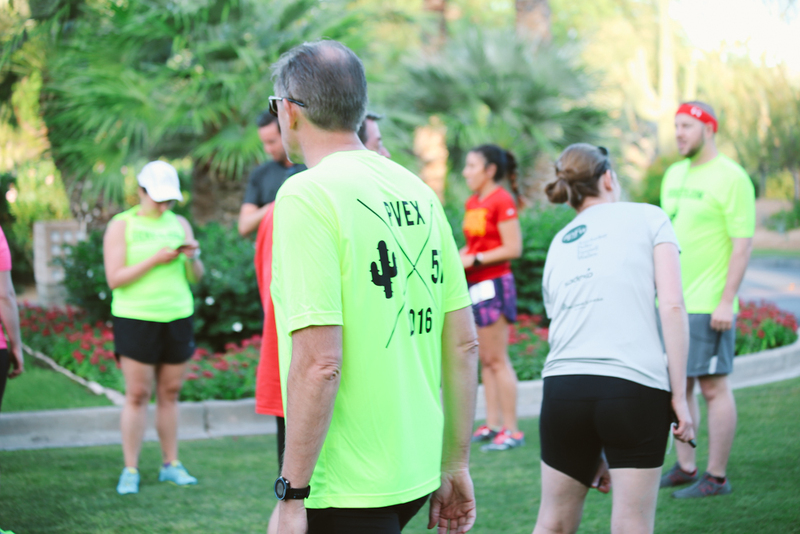 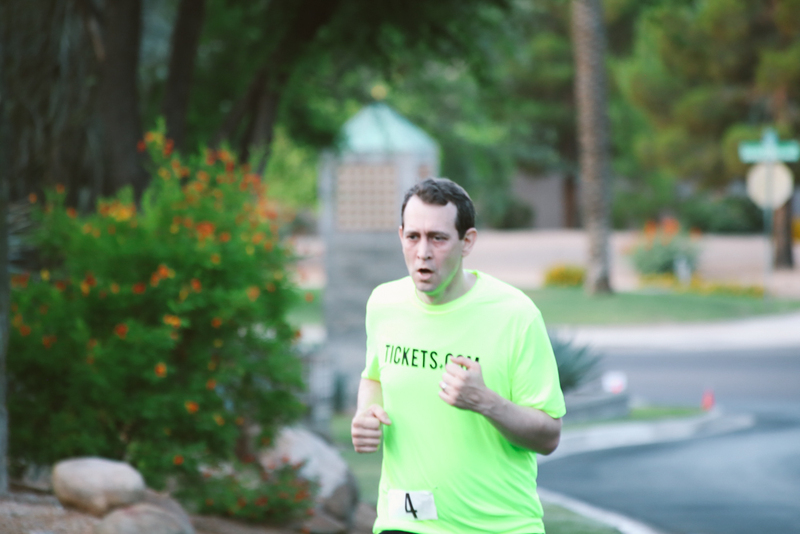 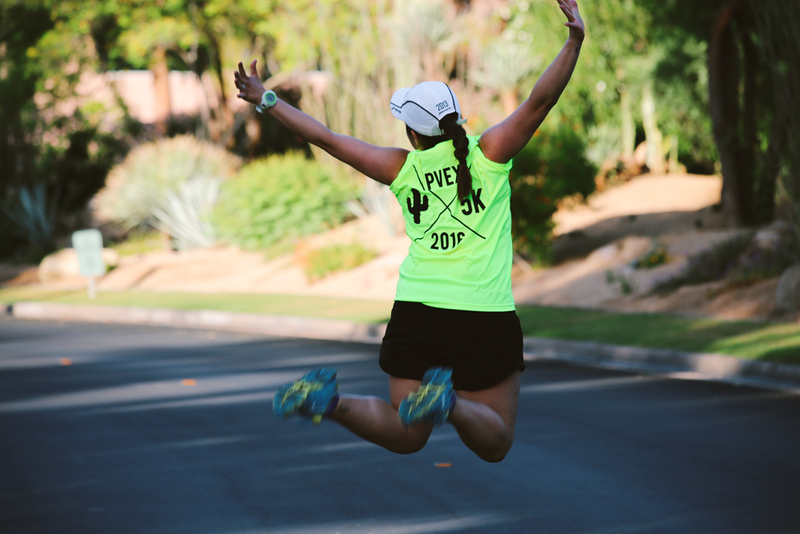 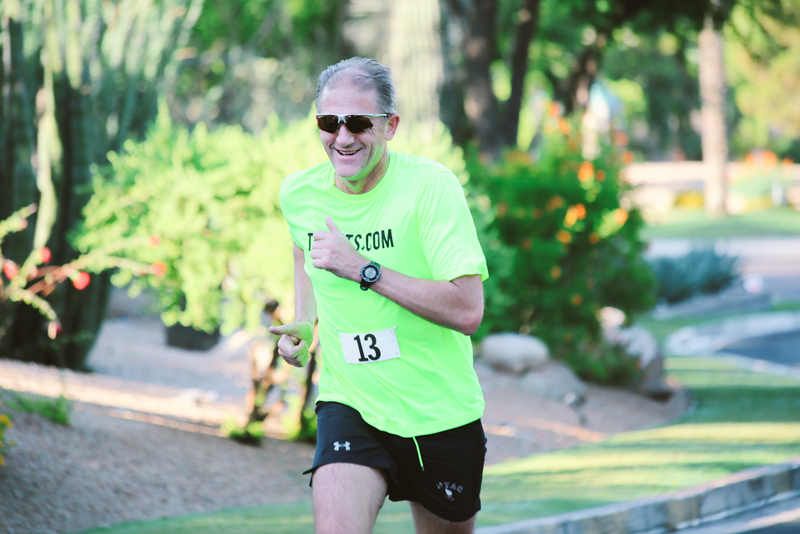 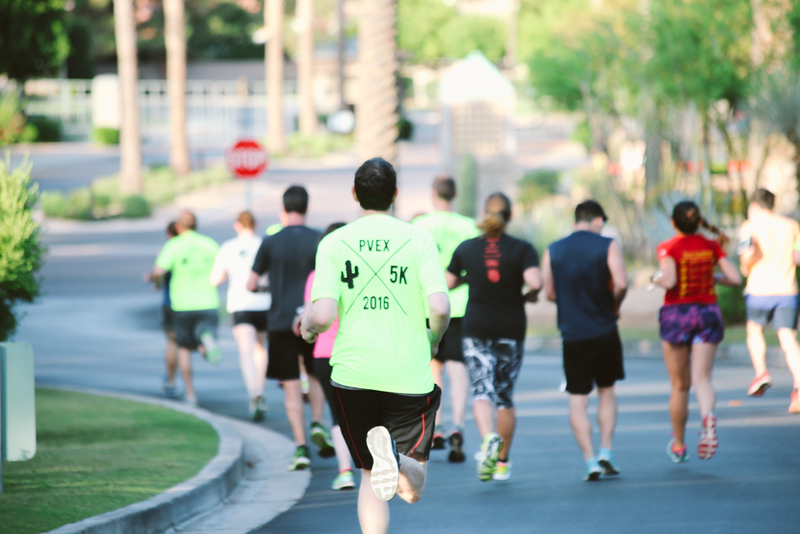 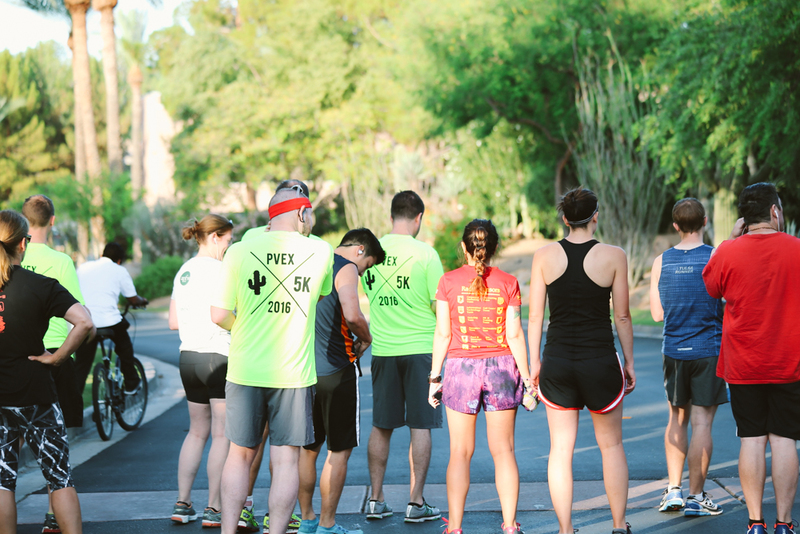 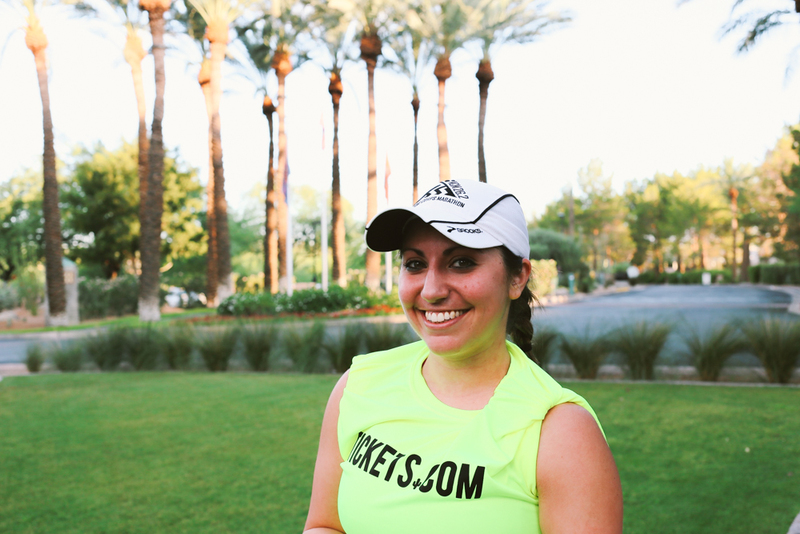 Our first official 5K race took place on Monday morning of June 13 in beautiful Scottsdale. 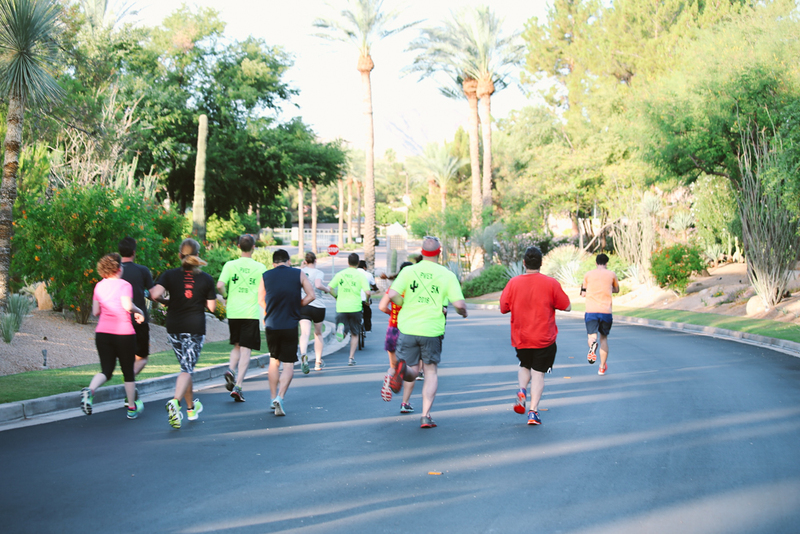 Runners from all over toed the starting line and took off in efforts to stay fit and enjoy some competitive fun! 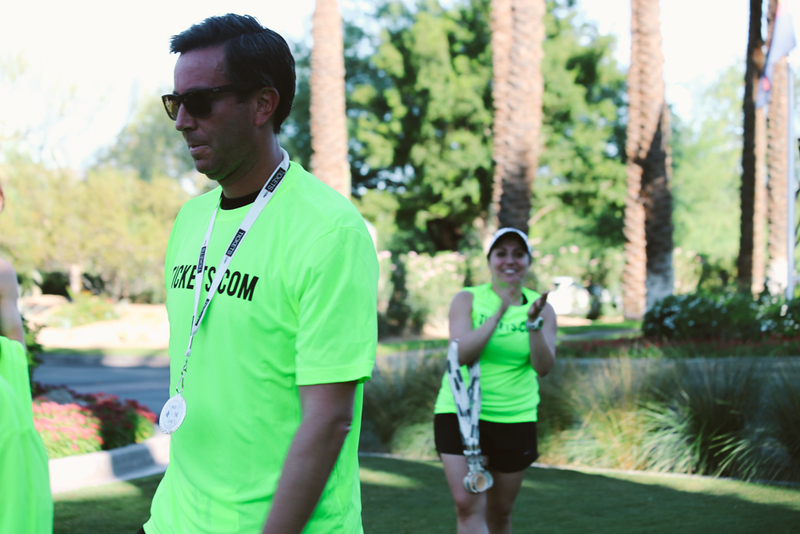 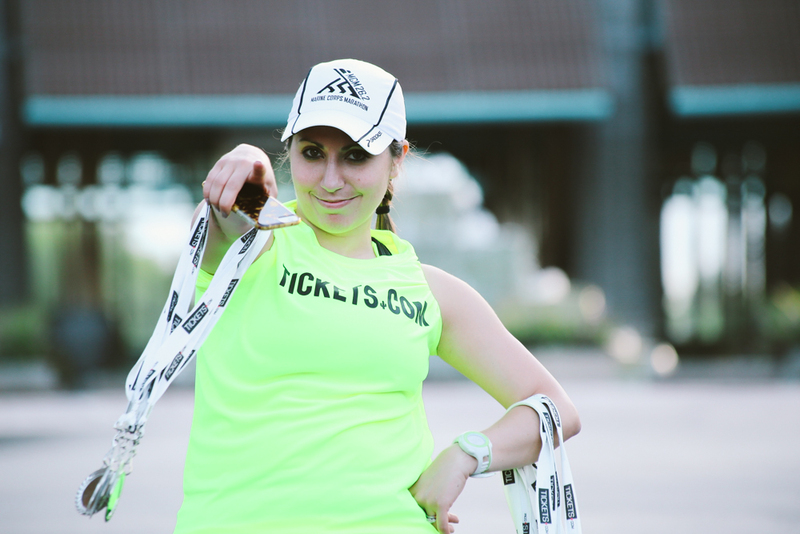 Every runner went home with a commemorative shirt and finisher medal. 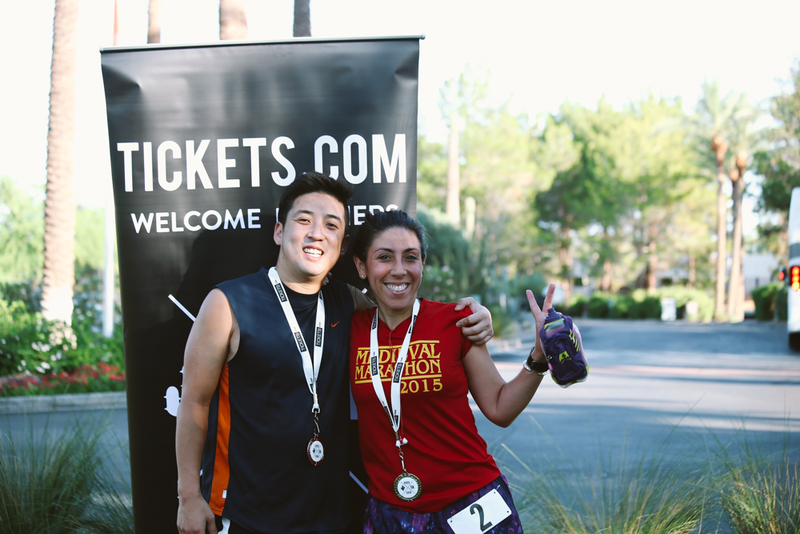 The first female and male winner each got a Tickets.com T. fitbit! 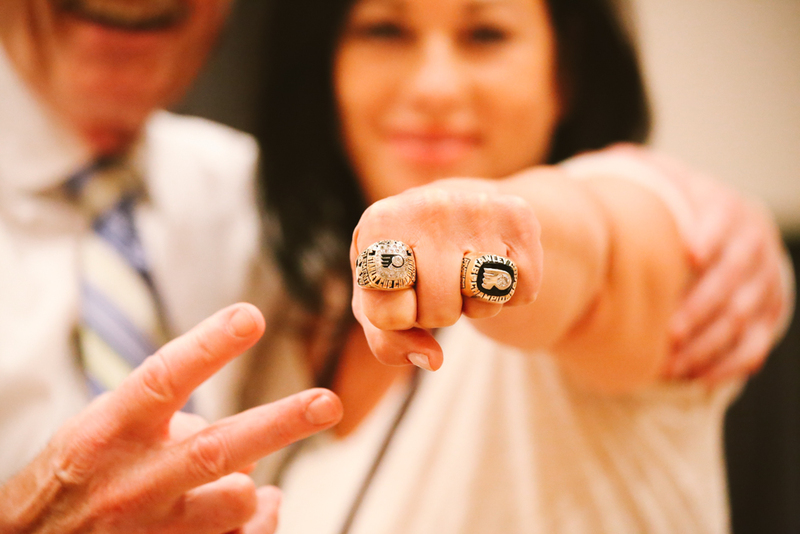 Congrats to Jeff Newsome of Tulsa Performing Arts Center and Andrea Jirousek of the Cleveland Indians! 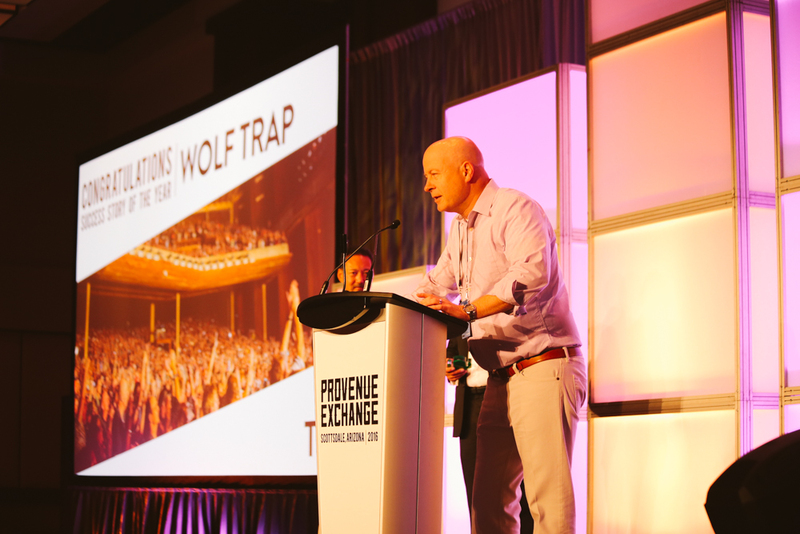 Chris Farrar, Director of Product and Partner Management, introduced the basics of integration, why they are important, and how they can benefit venues. 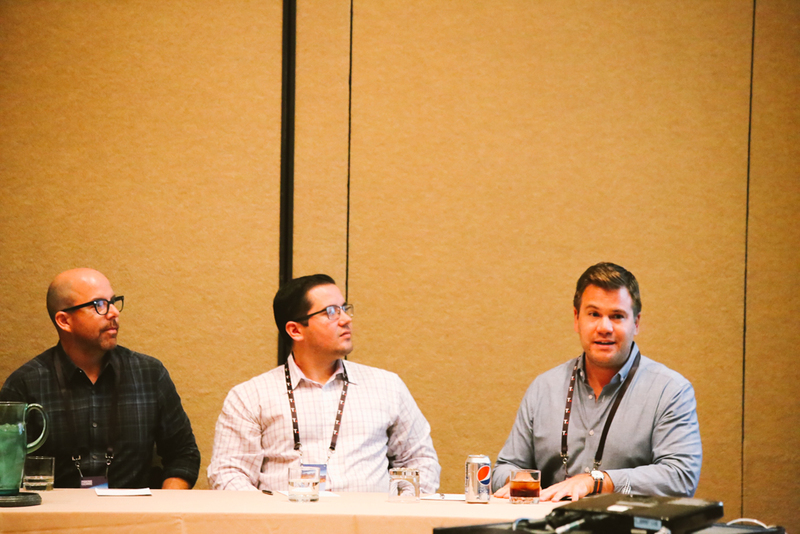 Farrar also spent time myth-busting the most common misconceptions about integrations as we understand the hesitancy to engage with integrated solutions. 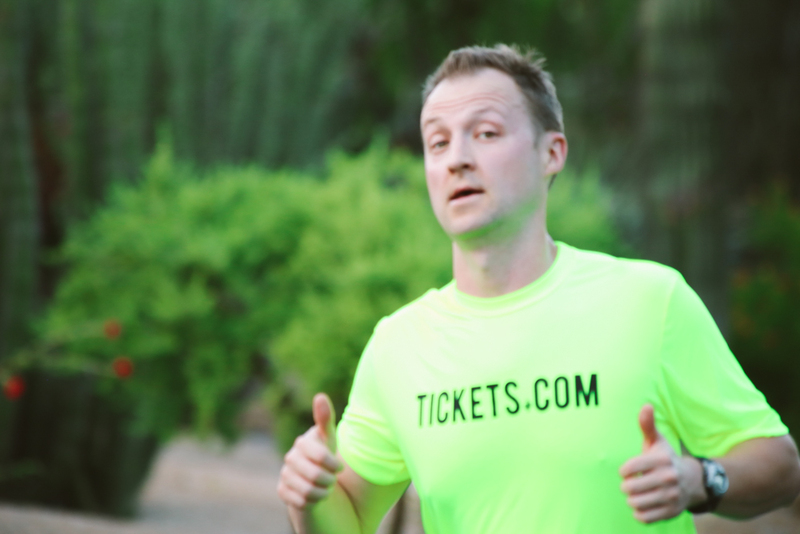 Tickets.com knows its clients need to quickly and seamlessly locate the right reports to better serve their business needs. 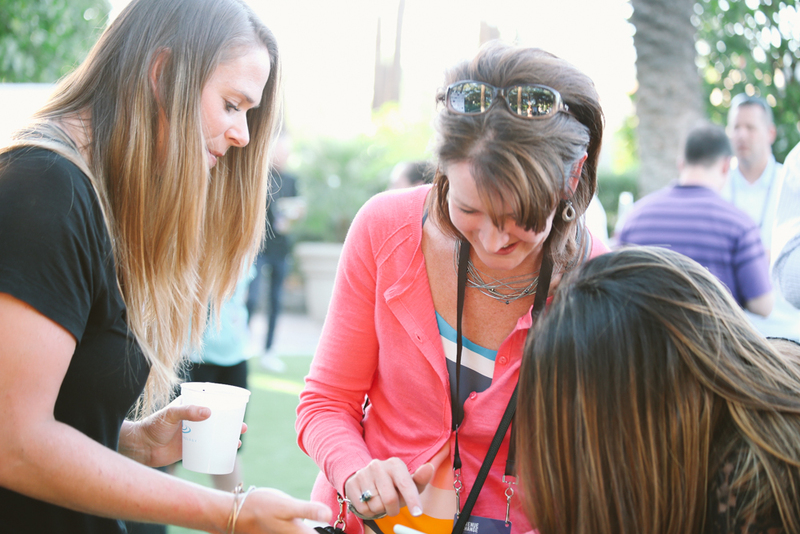 With over 200+ options at hand the search could be overwhelming. 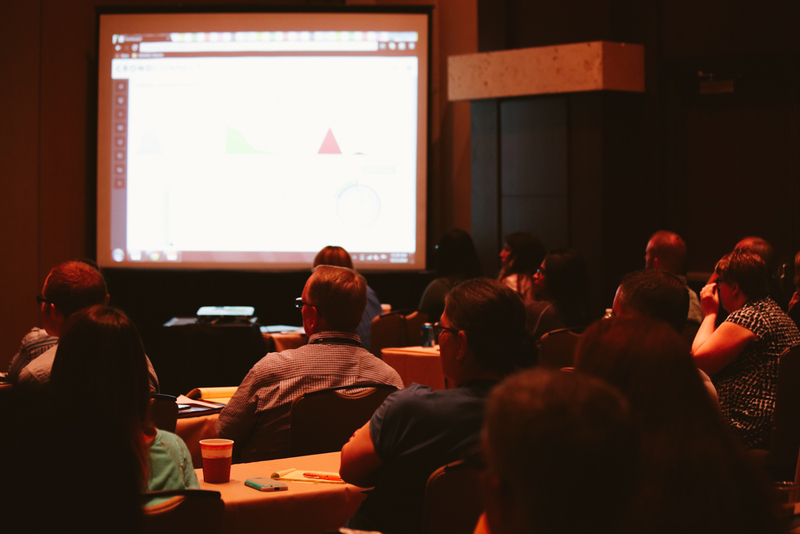 In an effort to shed light on how ProVenue calculates net sales, payment activity, and attendance, Allyson Miller, Director of Project Management and Reporting, highlighted the best reports for daily and weekly operations, including some little-known multitaskers. 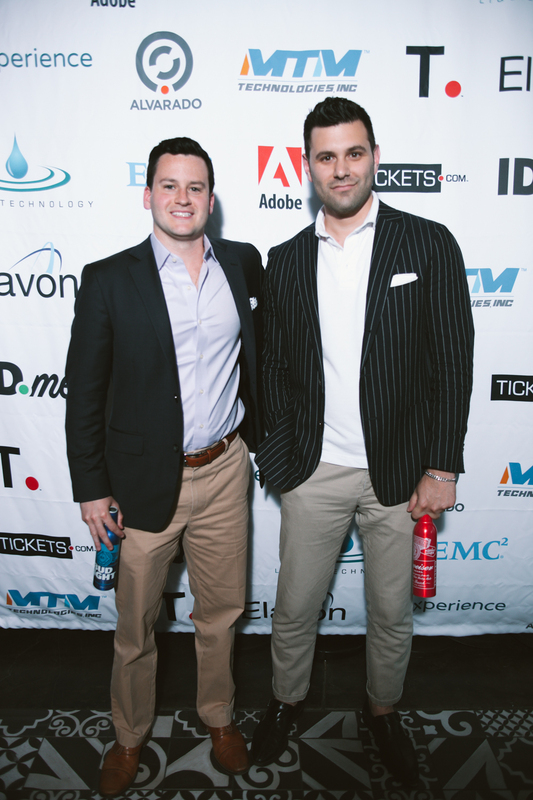 Tickets.com introduced a new purchase and ticket management experience built for exactly where your patrons are and want to be: phone, tablet, or desktop. 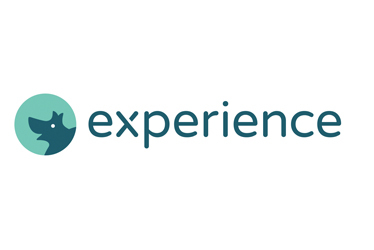 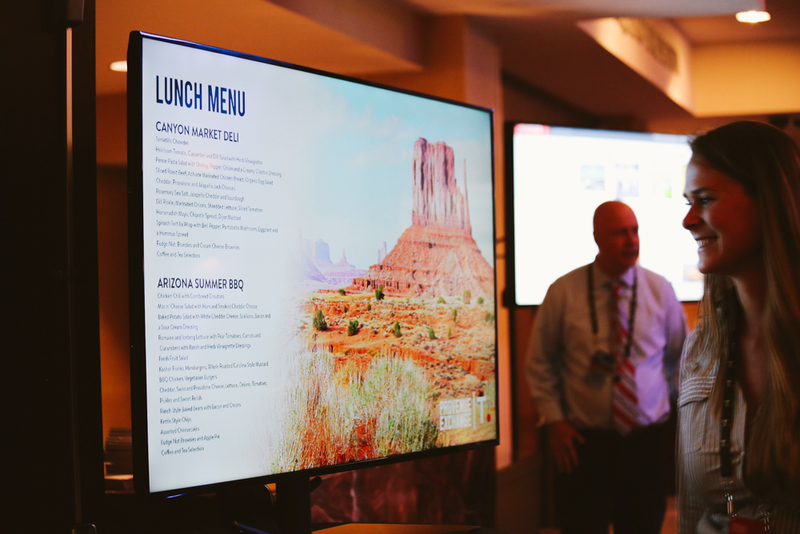 Attendees were taught what it takes to launch this new experience, and how patrons will benefit from its user-friendly interface. 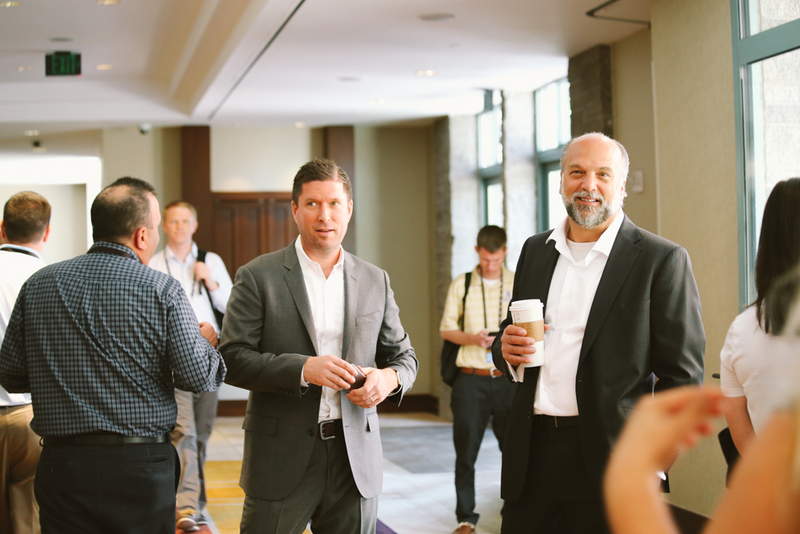 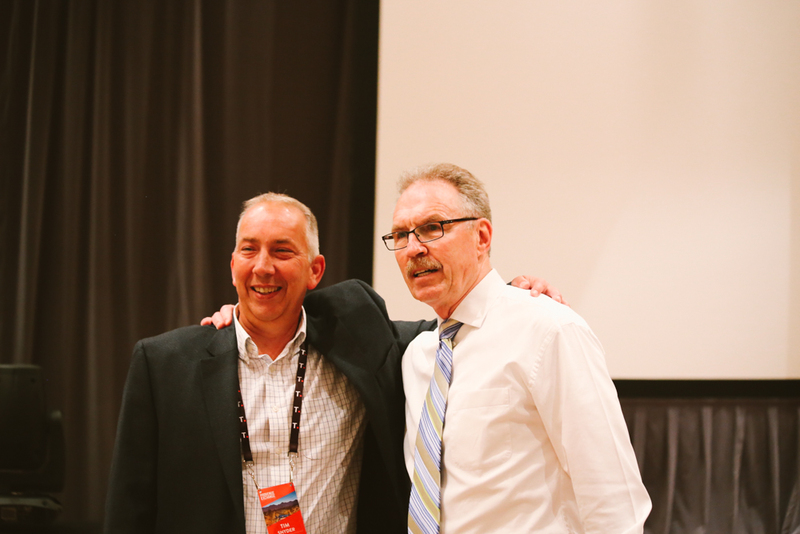 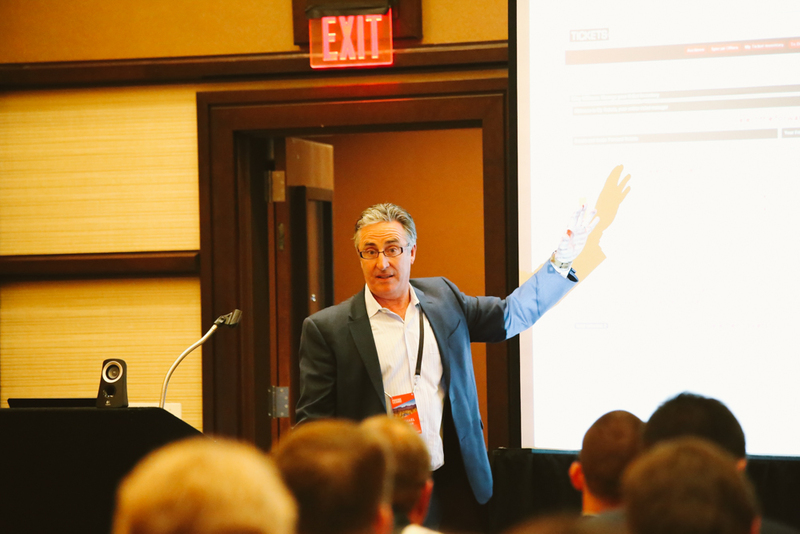 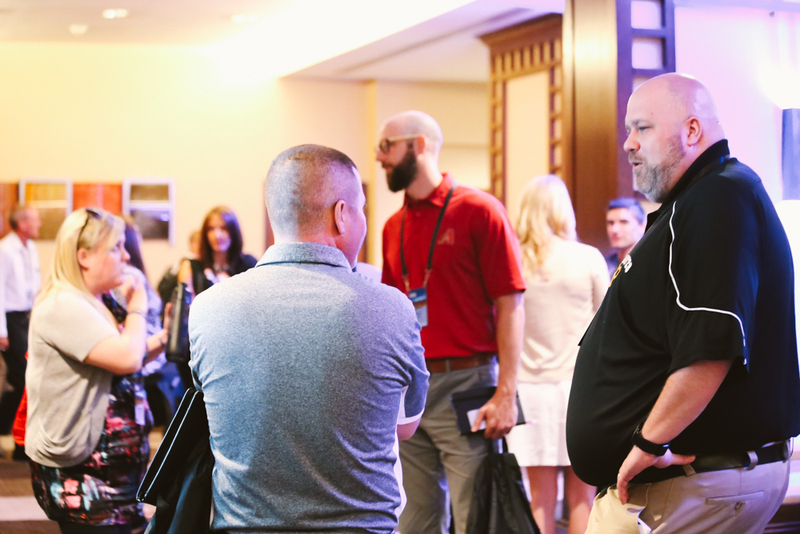 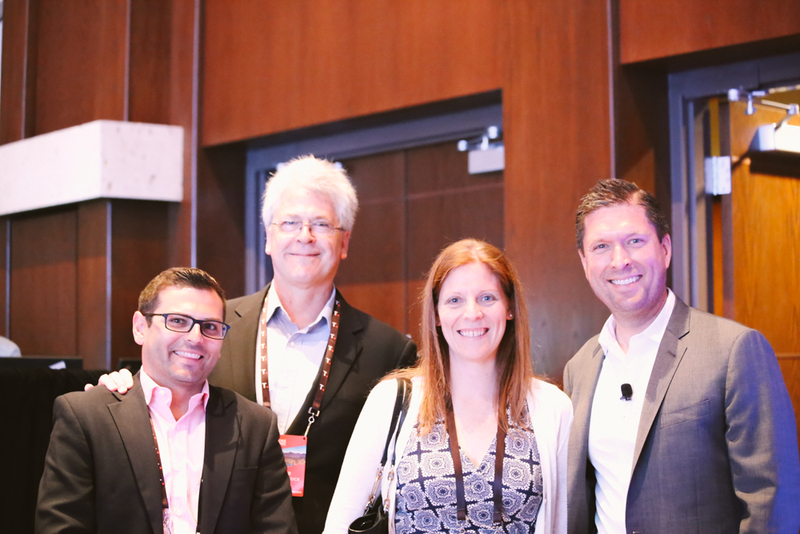 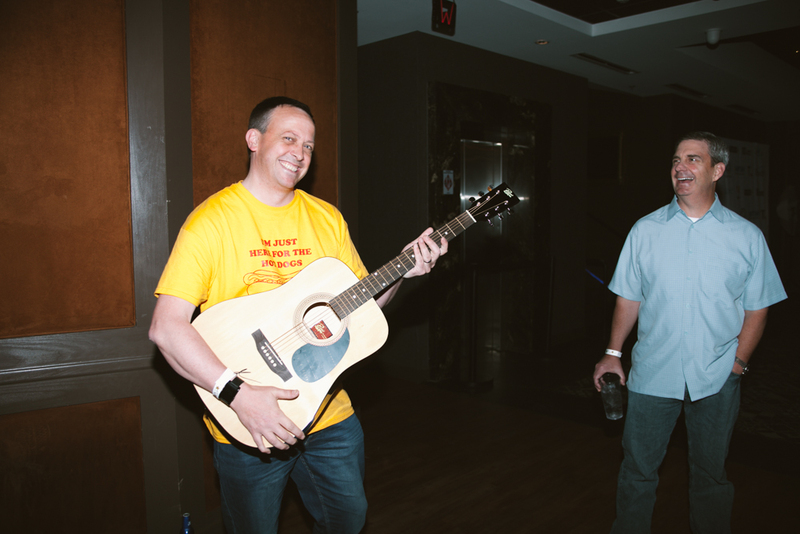 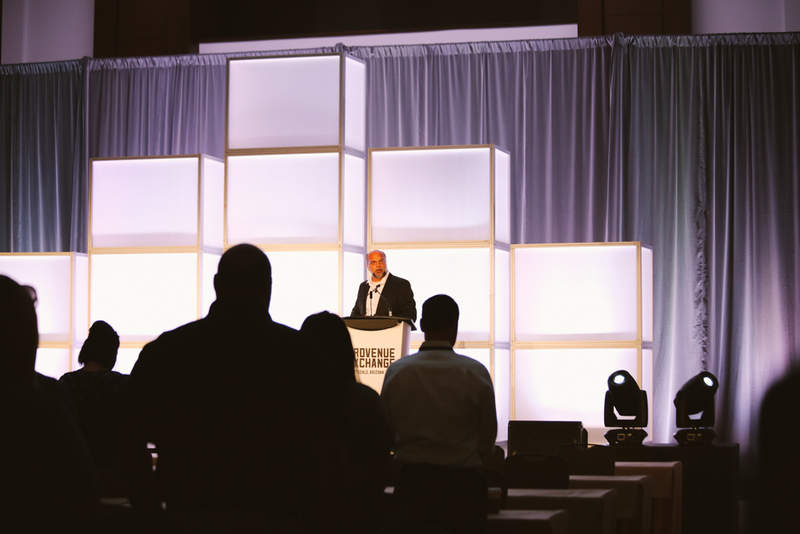 Bucky Heath, Head of Marketing and Strategic Partnerships, and Pete Bramson, Manager of Configuration Quality Control, introduced guests to the new CrowdConnect marketing platform. 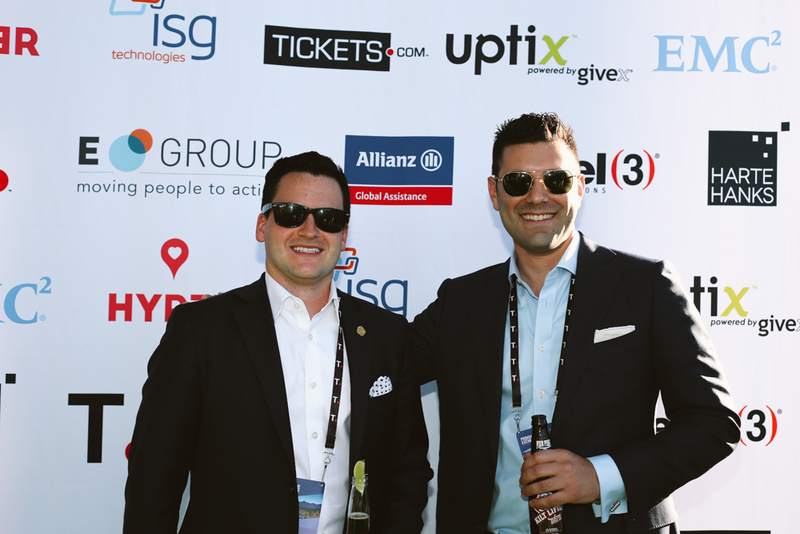 The new platform is designed to help clients reach more fans, drive sales and event attendance with a powerful and personal approach. 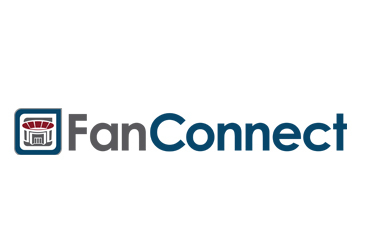 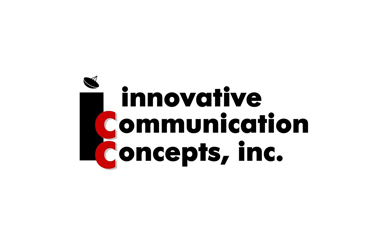 CrowdConnect, with its industry-leading products and services, creates a collaborative community that fosters innovation and growth. 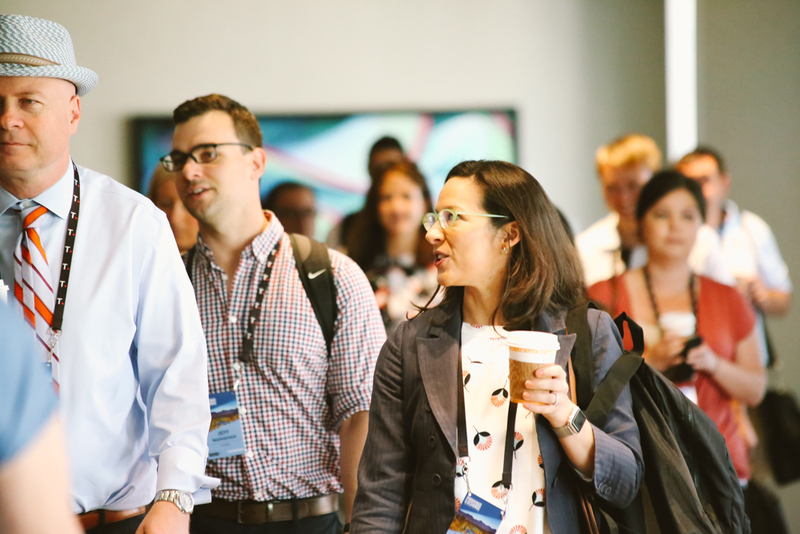 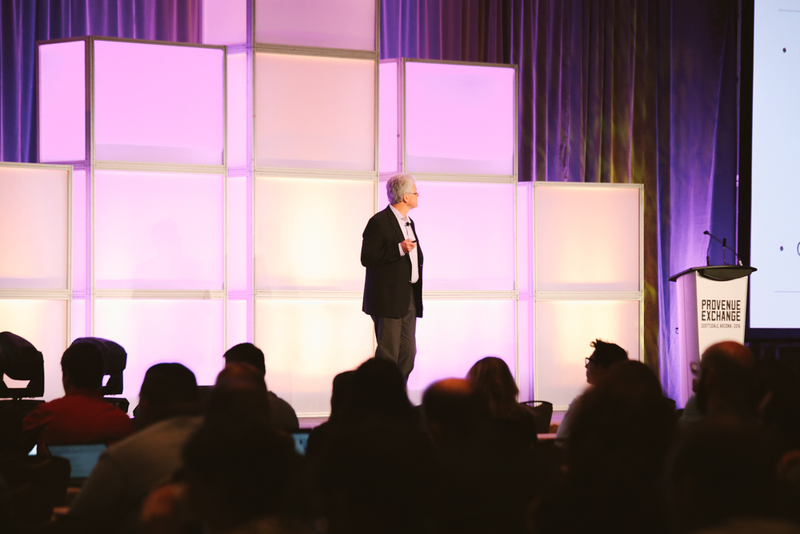 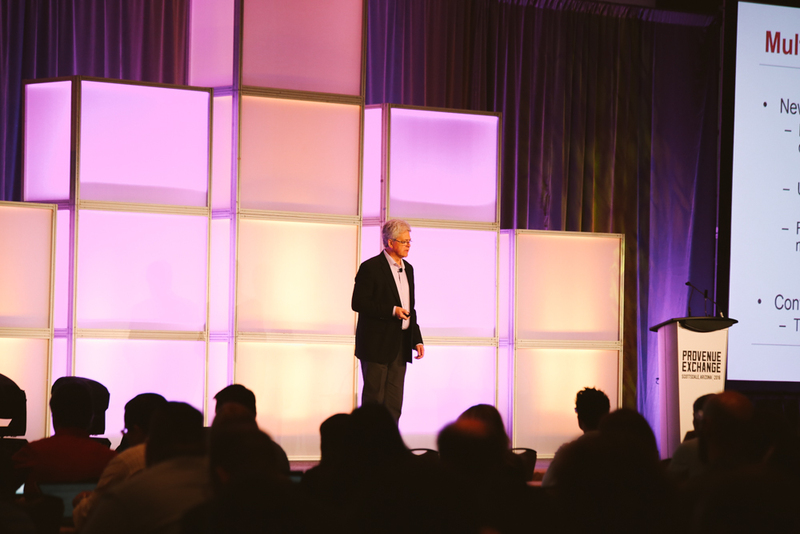 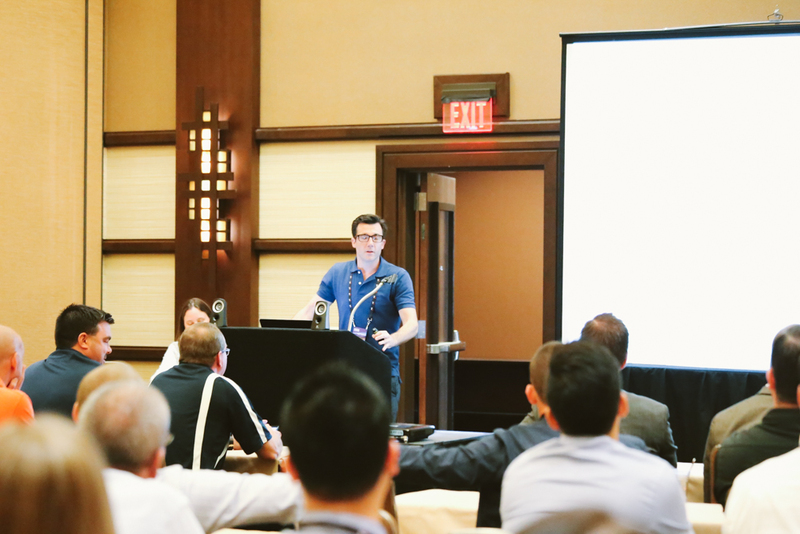 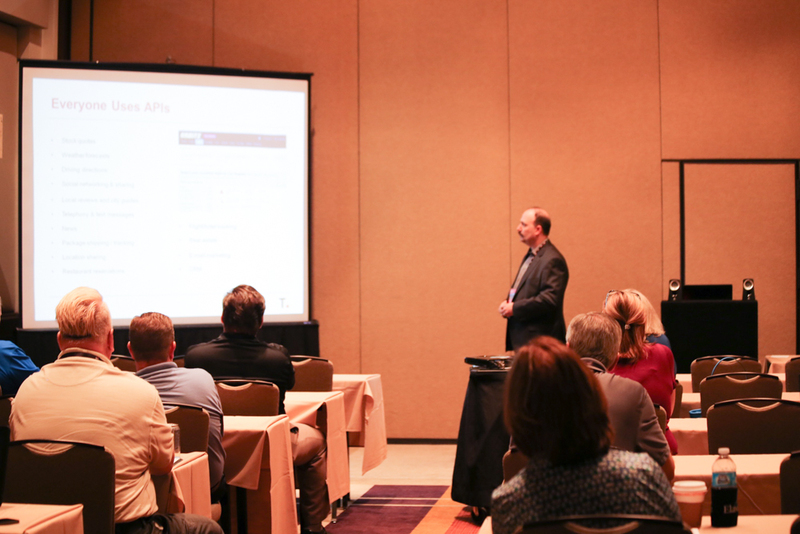 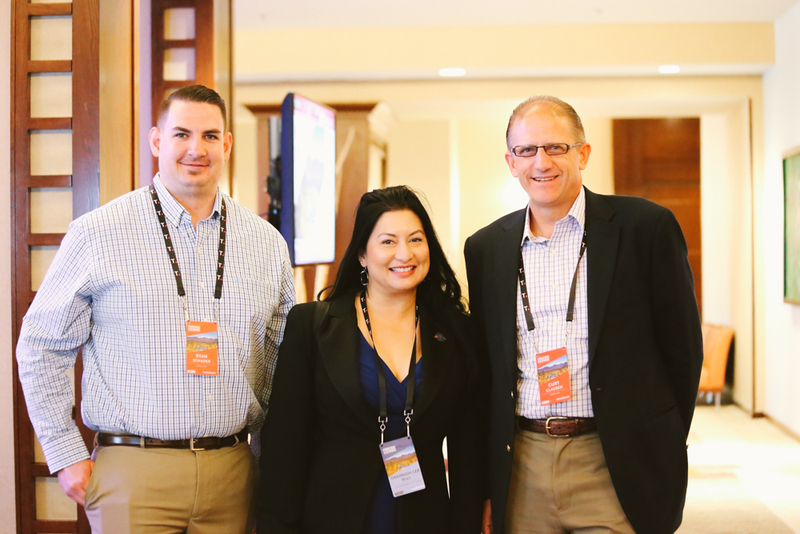 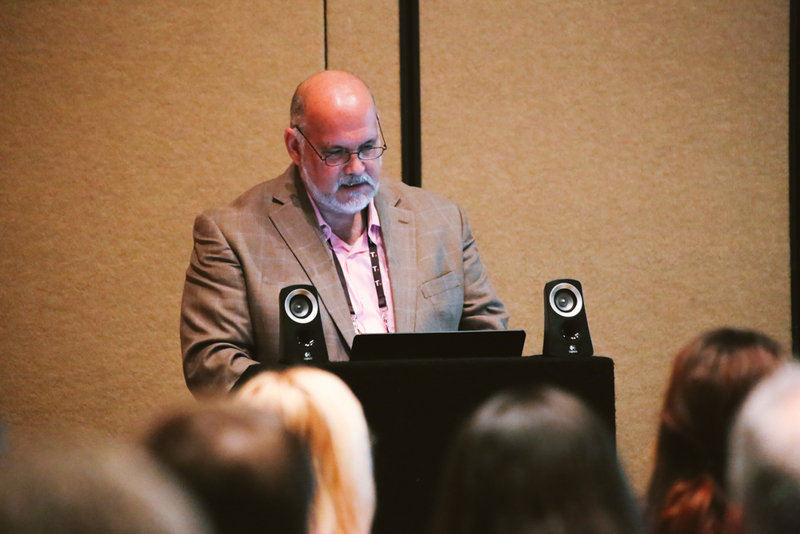 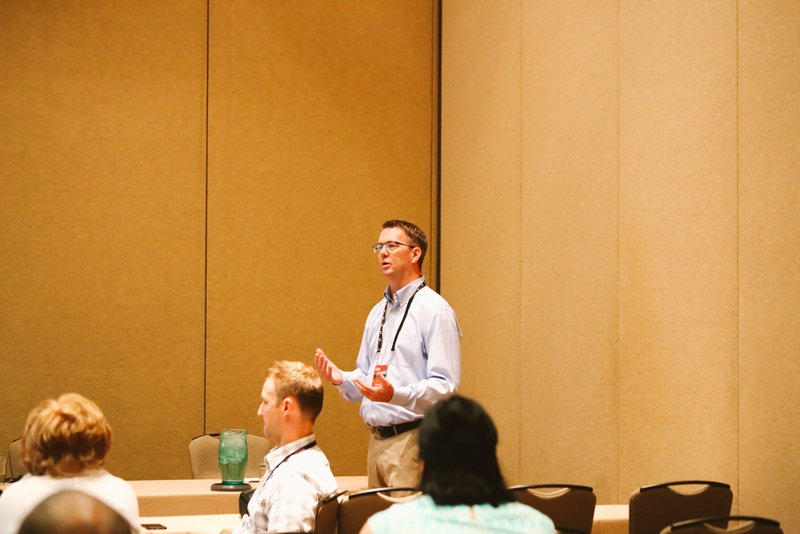 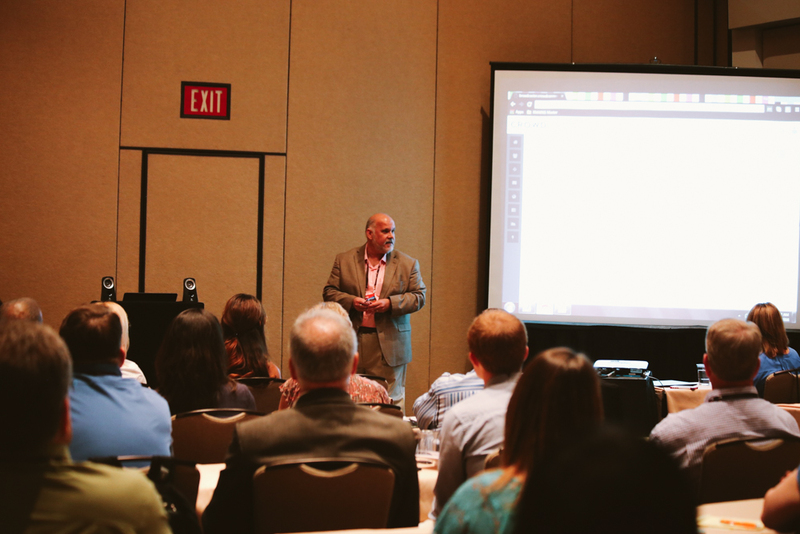 Mike Turner, Senior Director of Product Management, and Jennifer Liao, Senior User Experience Designer, showcased two important benefits of intuitive map design: minimizing abandonment and maximizing checkouts. 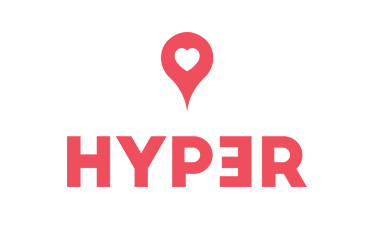 With the ability to embed high-resolution images, styling maps is limited only by your imagination. 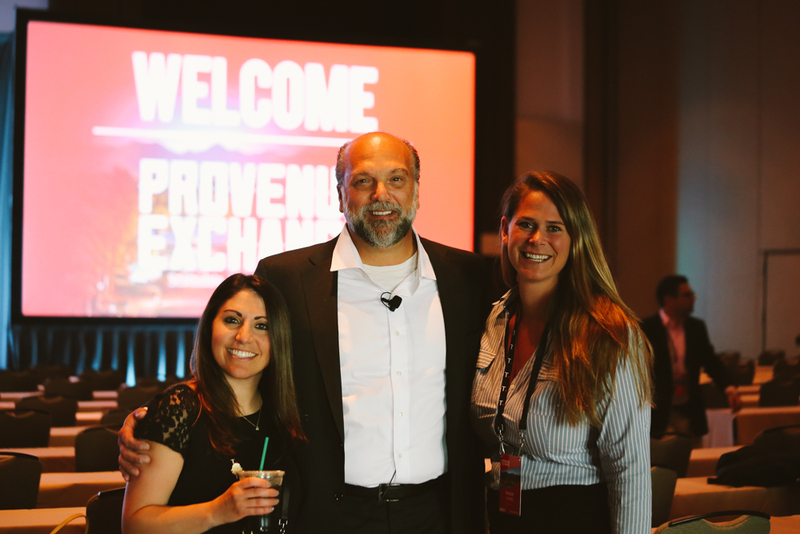 Led by Allyson Miller, Director of Product Management and Reporting, event attendees learned about best practices for reporting on Primary Market Sales from the ProVenue domain. 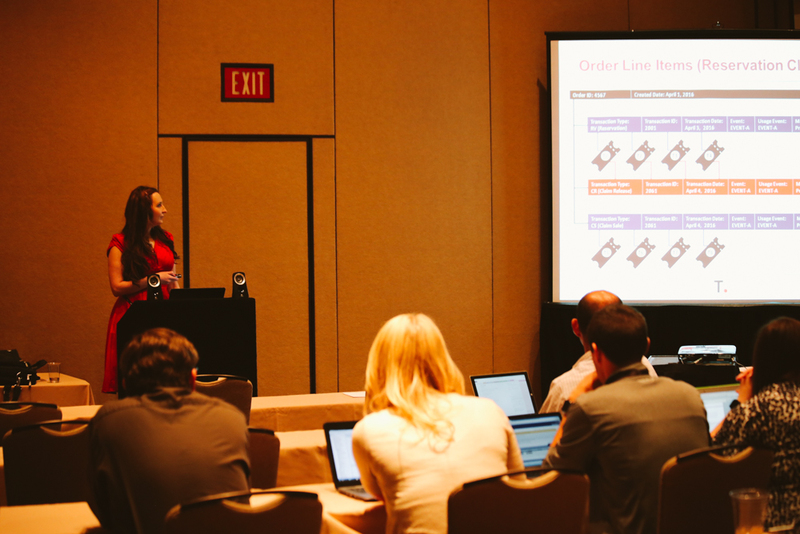 She also reviewed changes coming to the ProVenue Replicated Data Service. 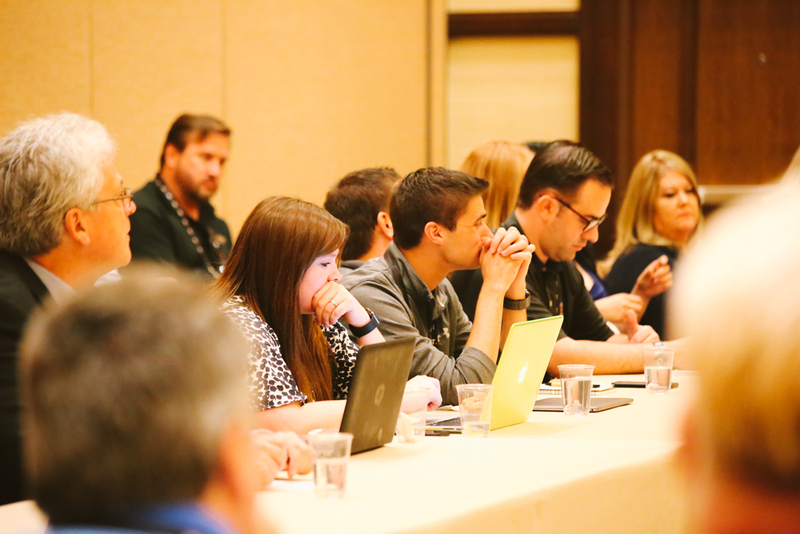 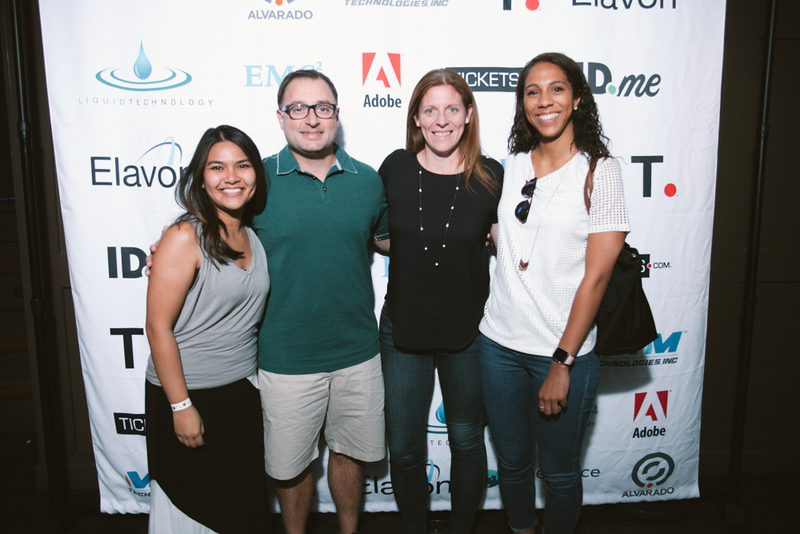 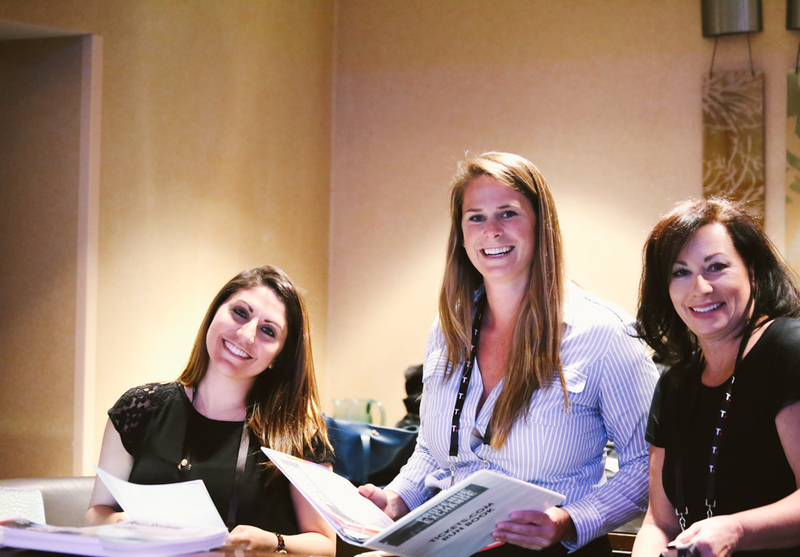 Led by MLB Advanced Media World Class Digital Marketing Team, attendees took a deep dive into the world of digital advertising while learning about best practices and proven campaigns. 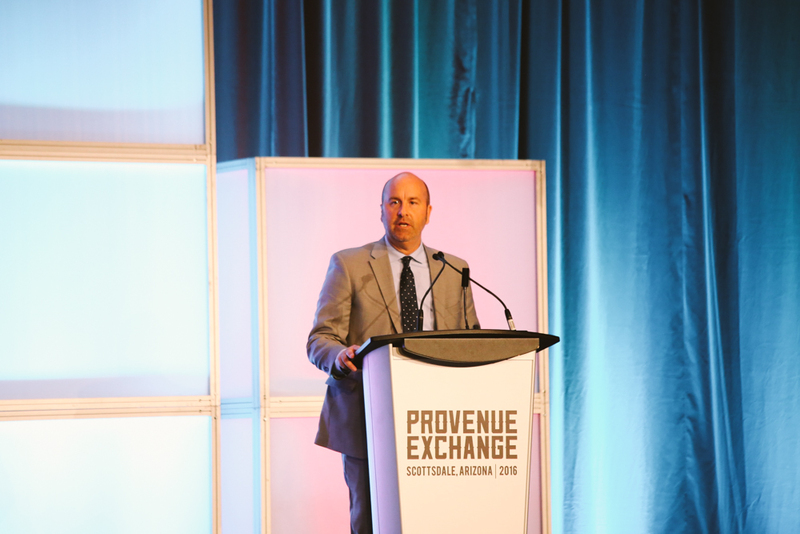 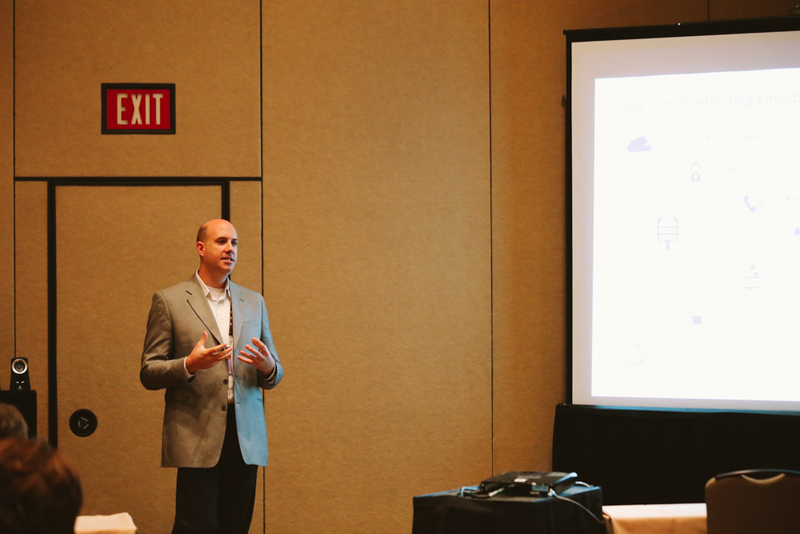 Mike Dunham, Director of Client Support, shared clients’ experiences making the transition from ProVenueMax to ProVenue. 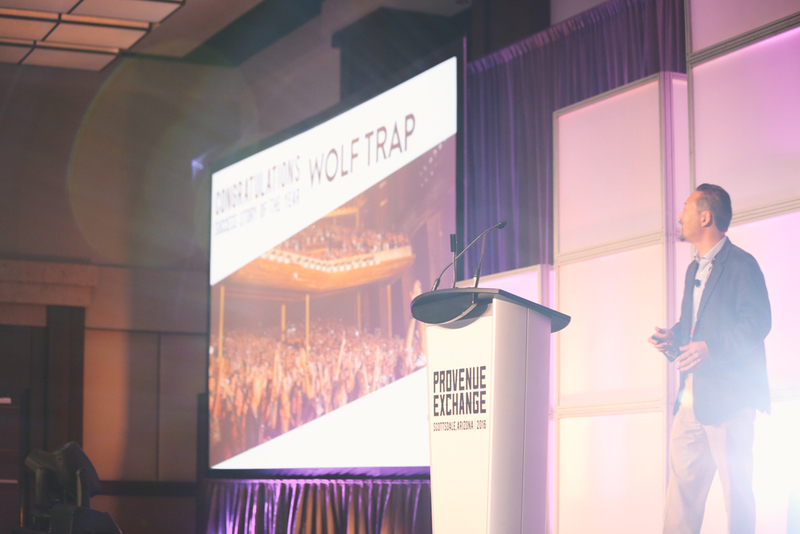 The ProVenue platform provides users with a modern, flexible and powerful ticketing platform.